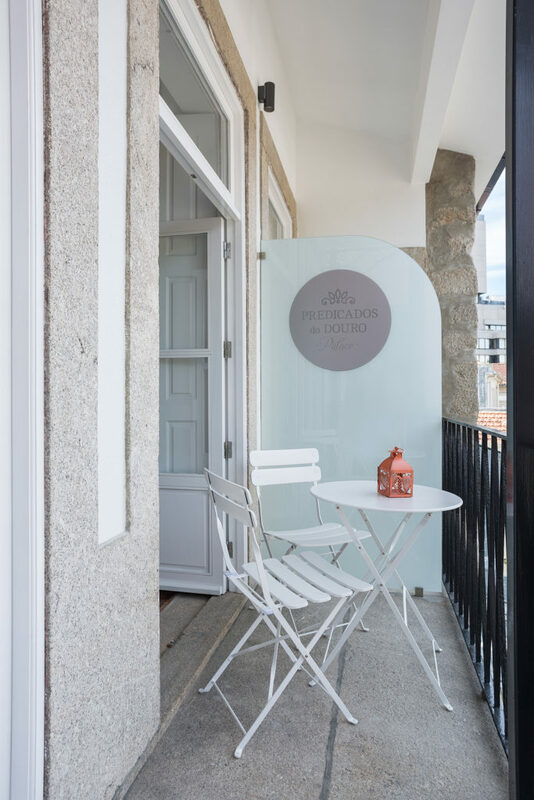 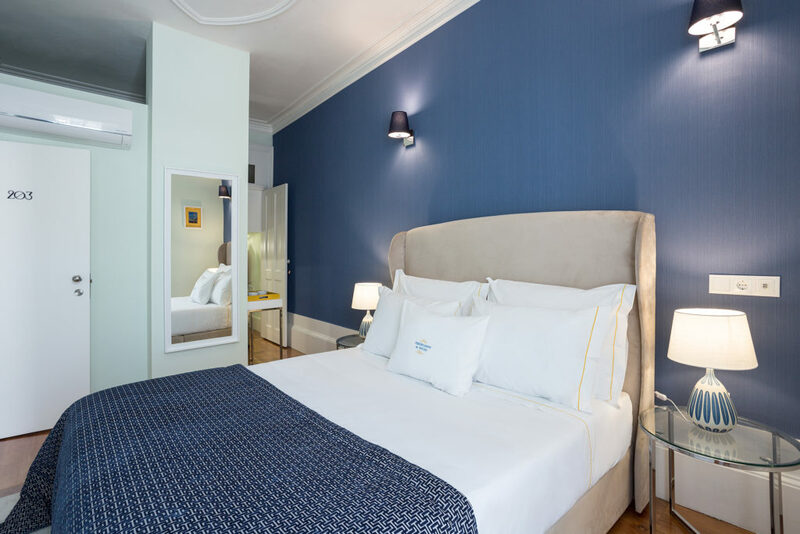 The Predicados do Douro Palace is a prestigious hotel in the center of Porto. 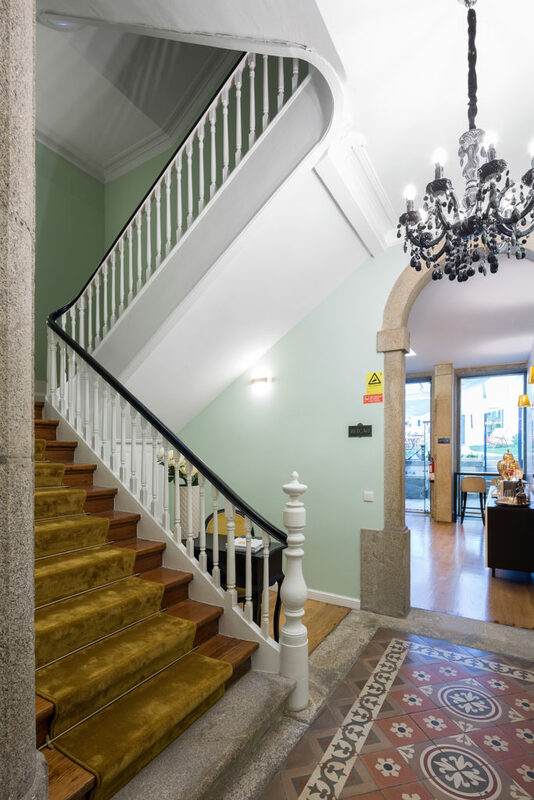 In front of the historic Crystal Palace, this building is composed of apartments T0 and T1 for all tastes. 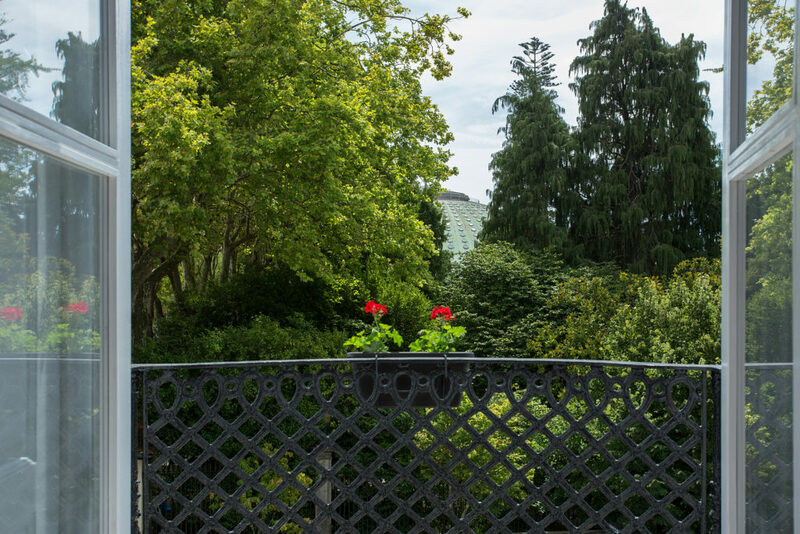 Enjoy a nice garden at the rear of the building, for the hottest days. 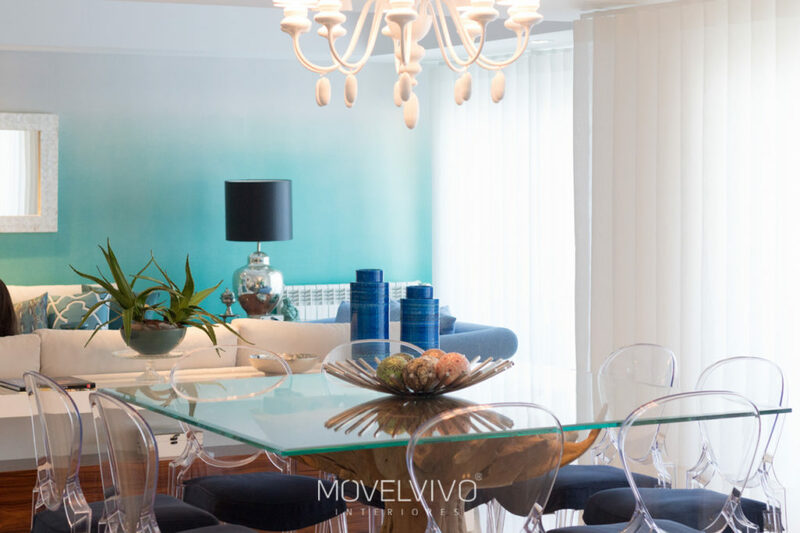 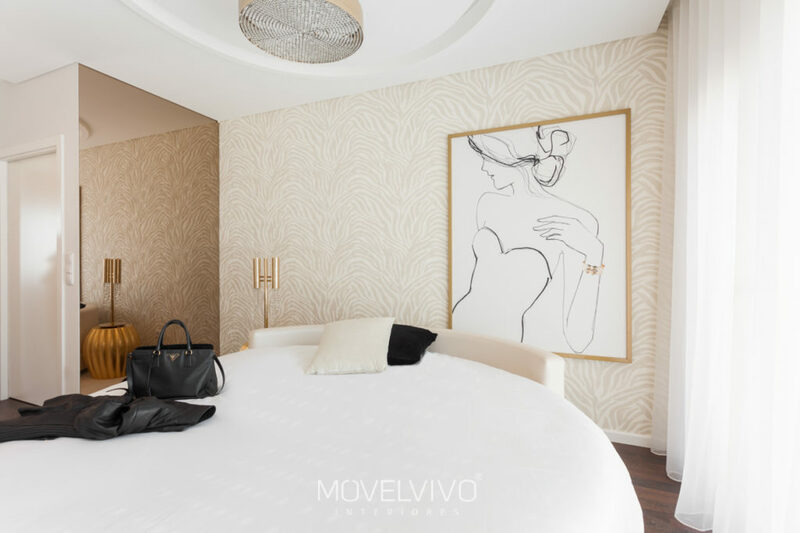 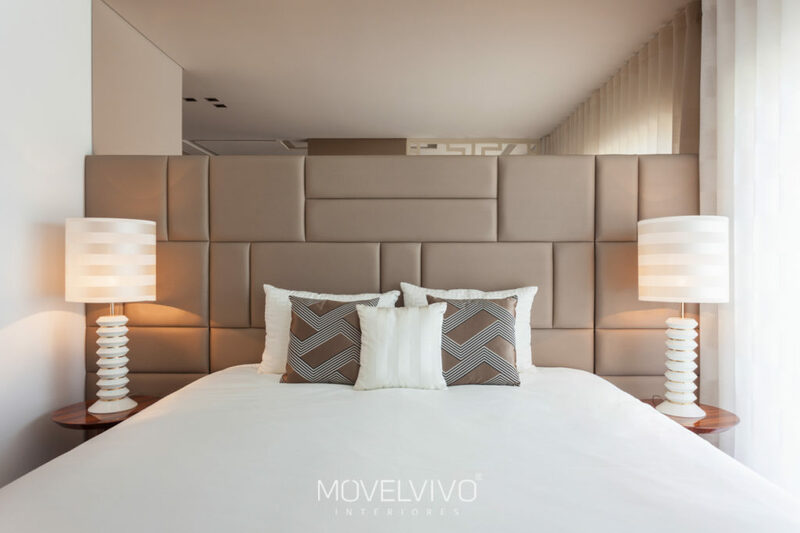 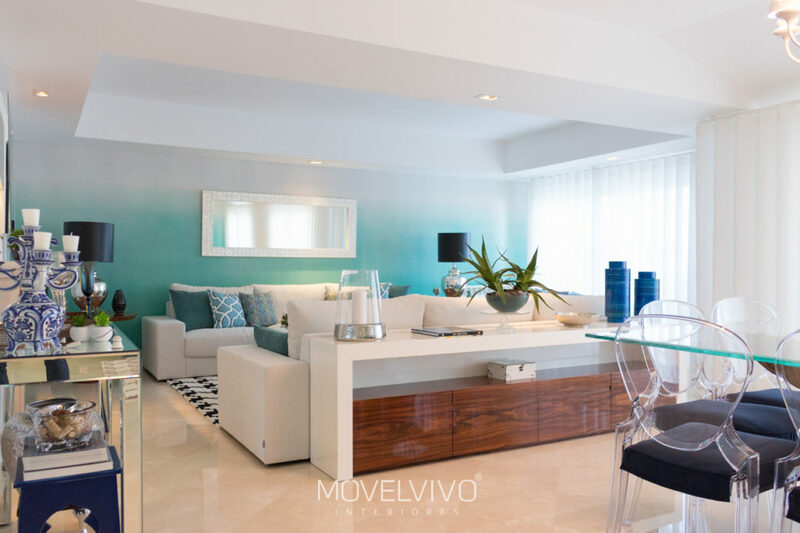 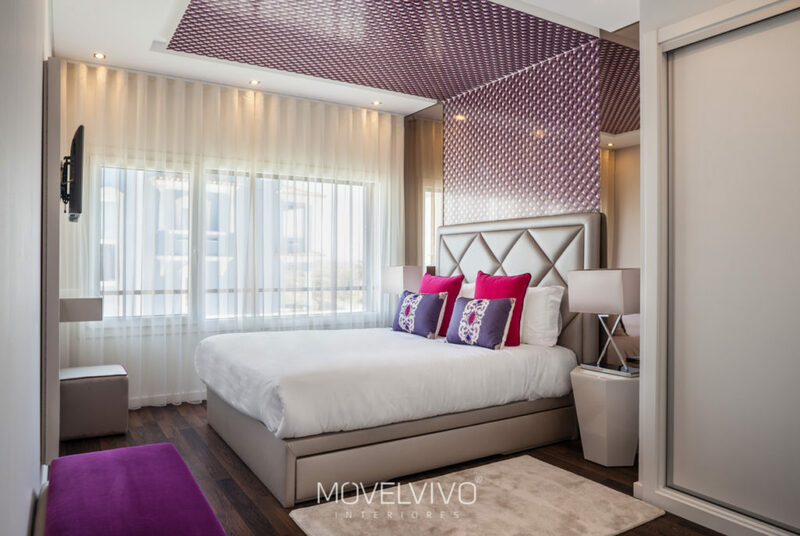 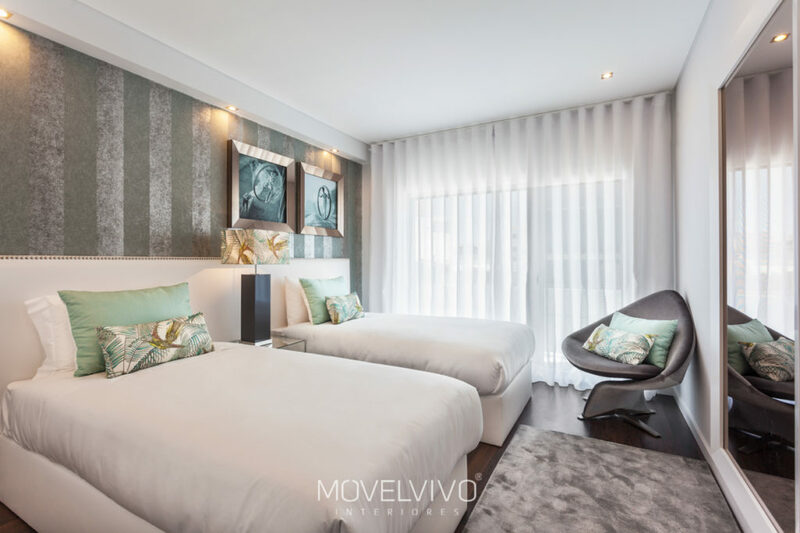 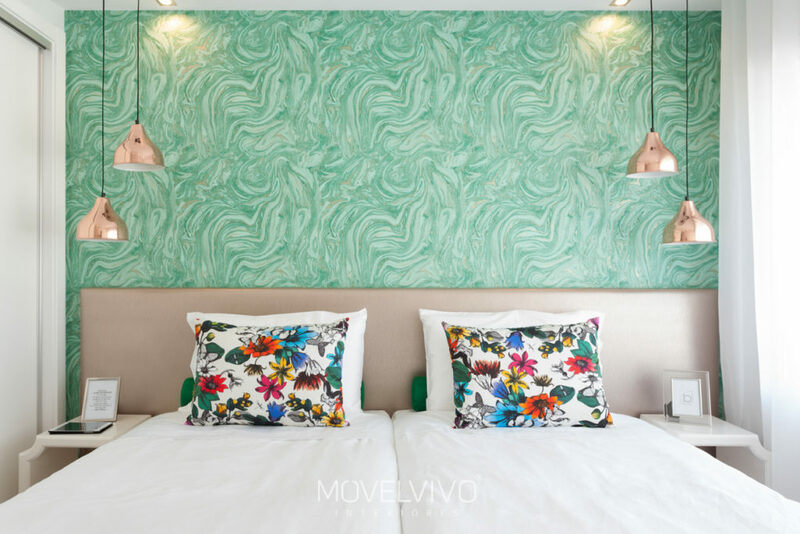 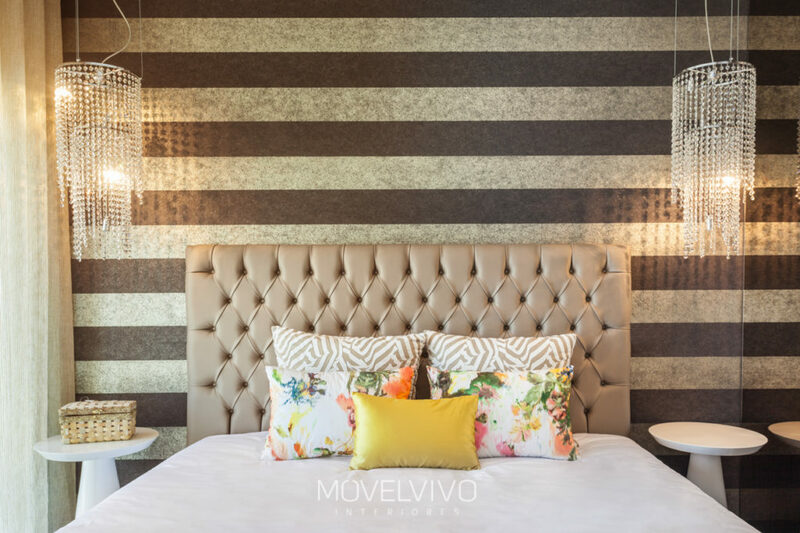 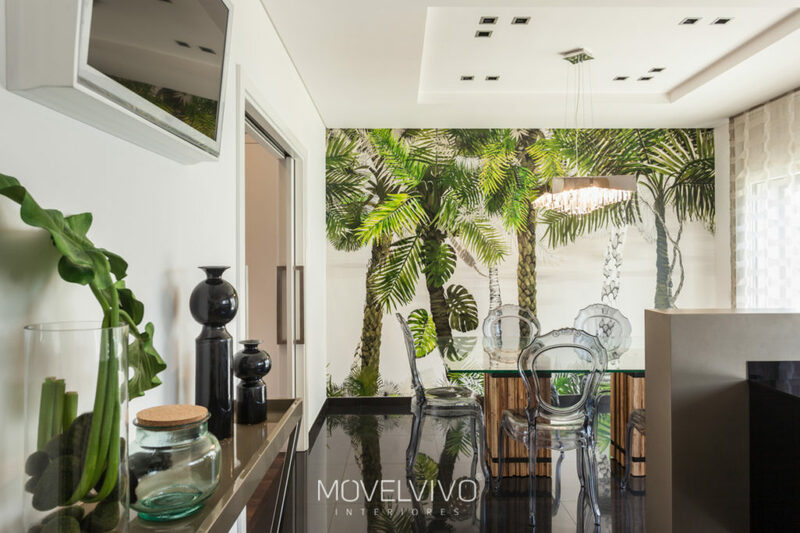 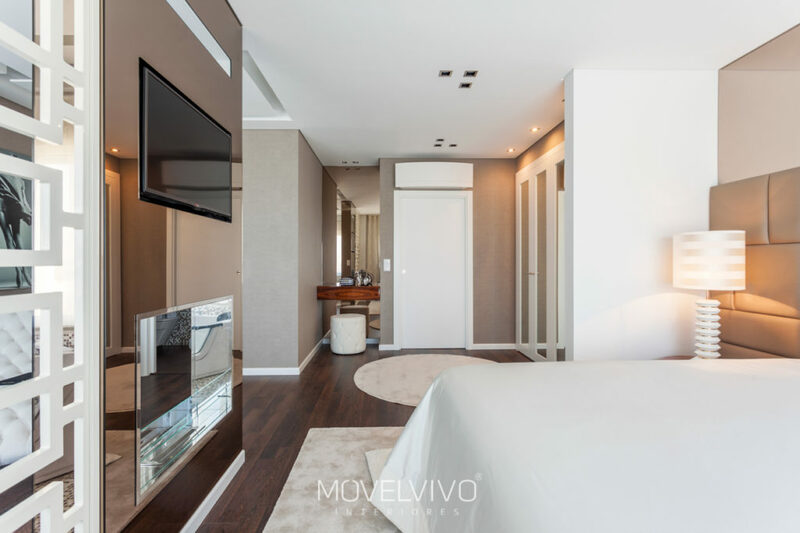 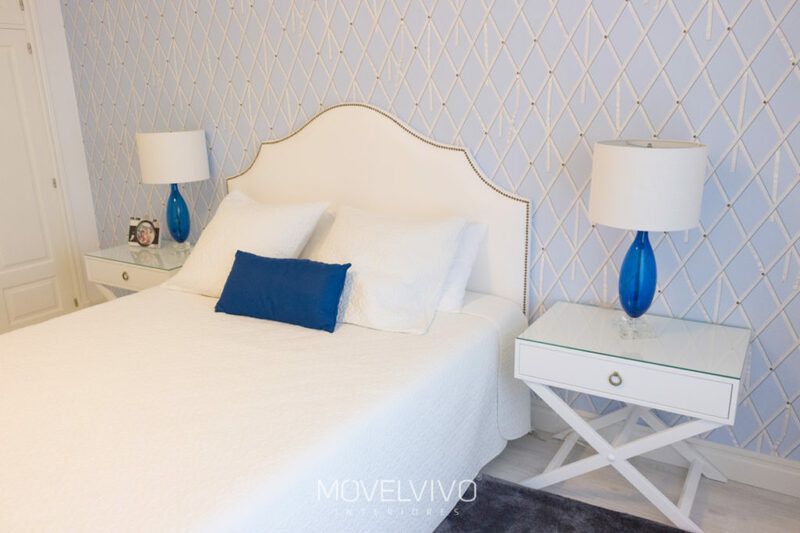 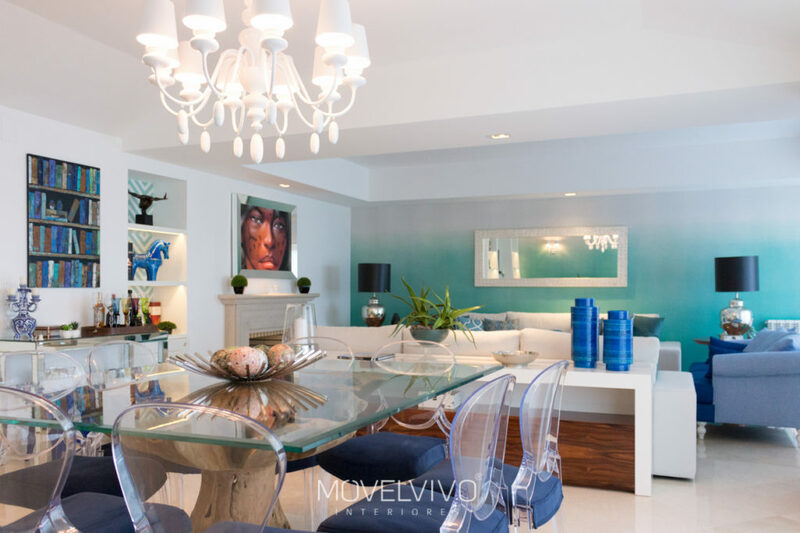 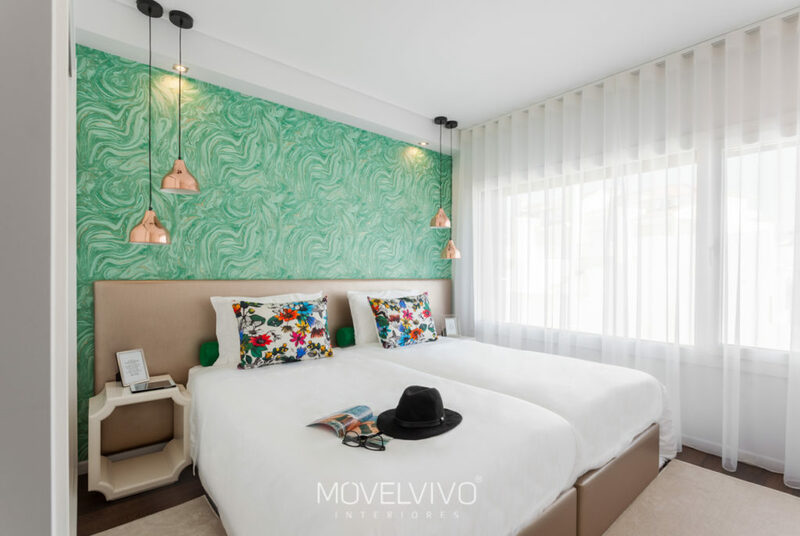 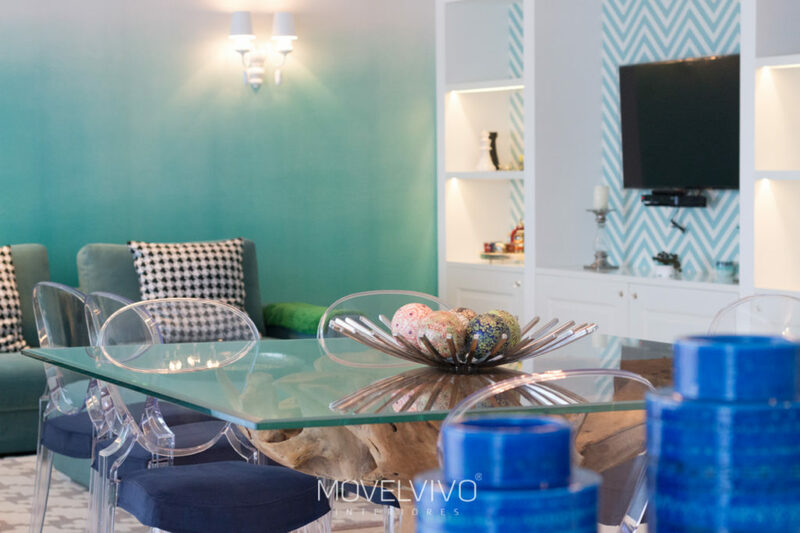 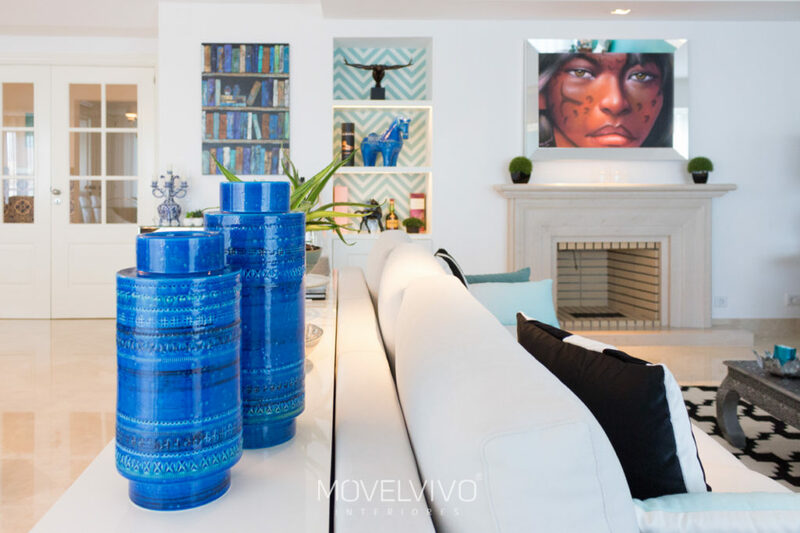 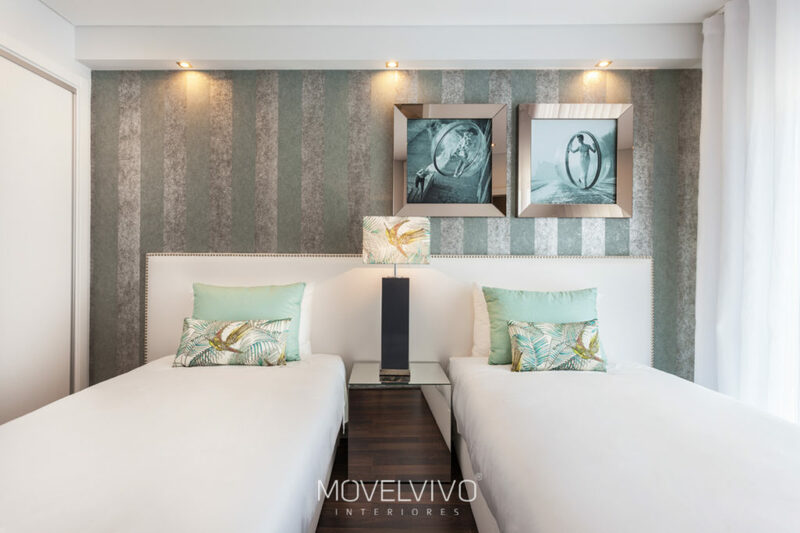 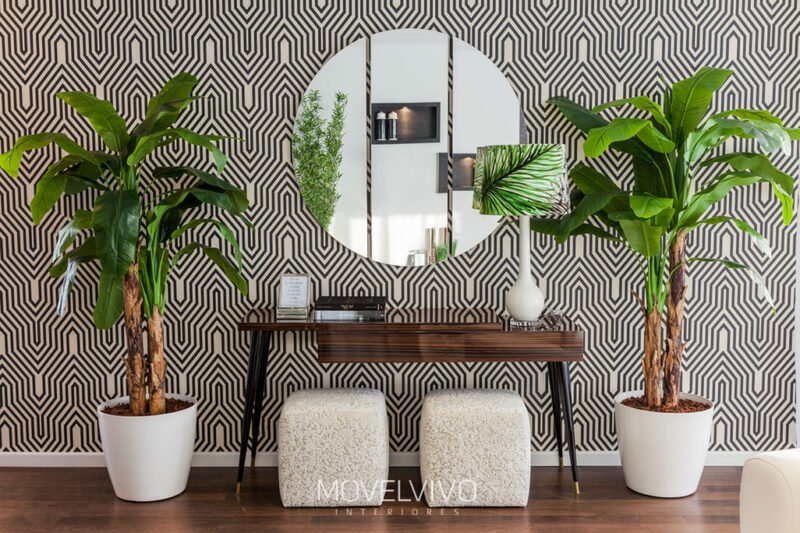 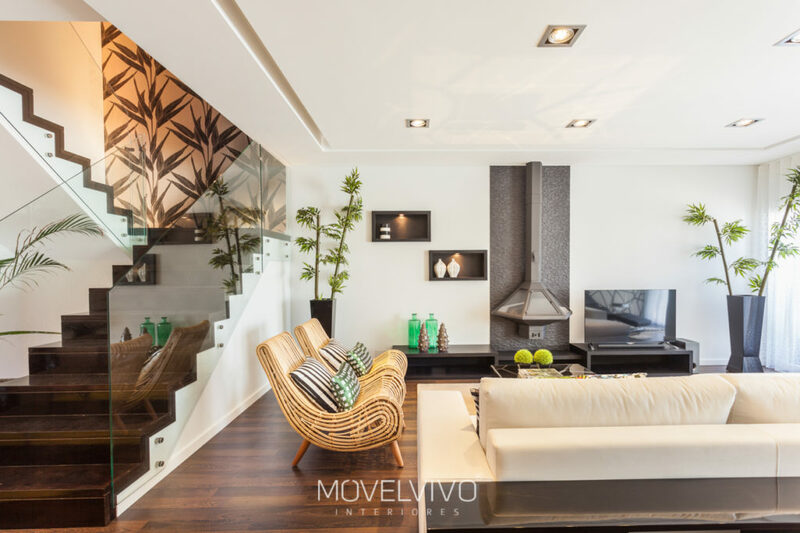 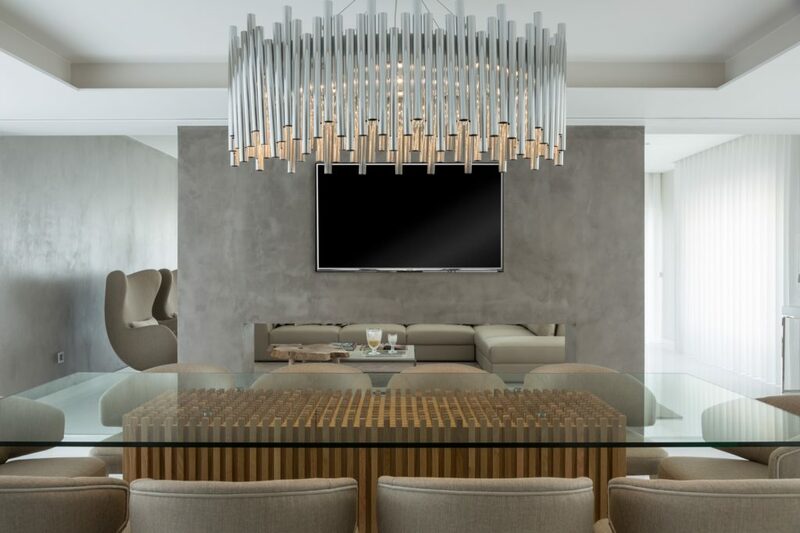 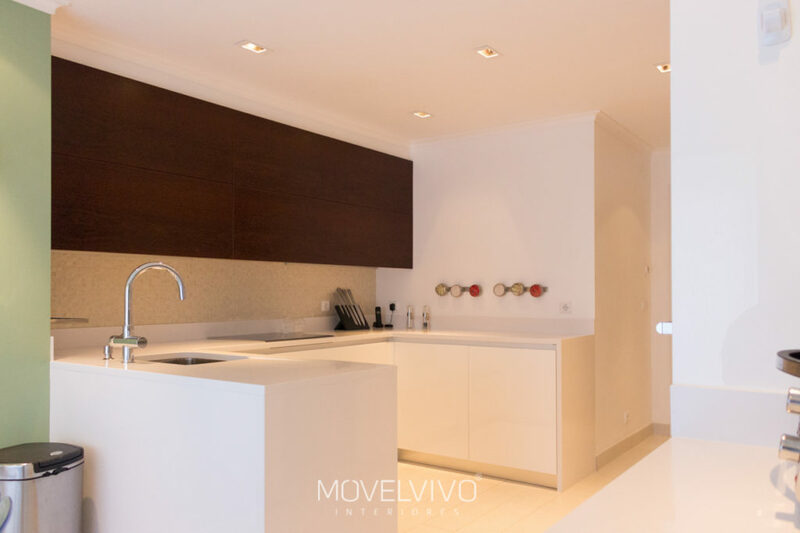 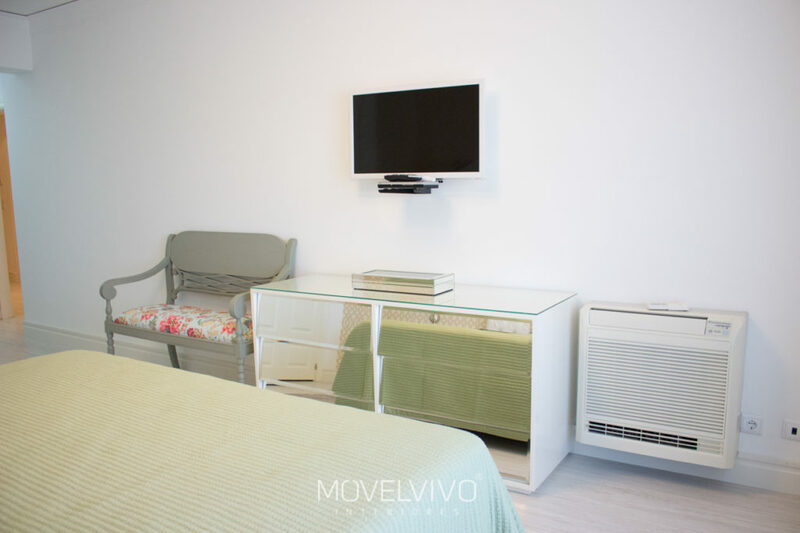 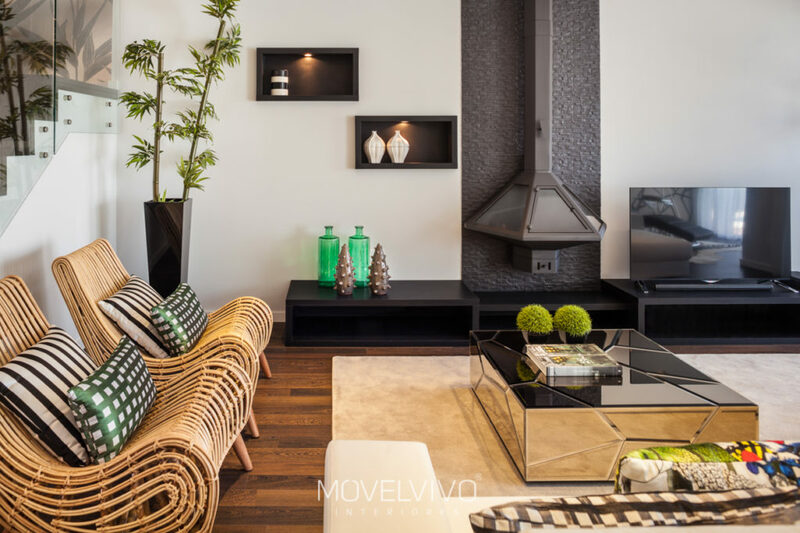 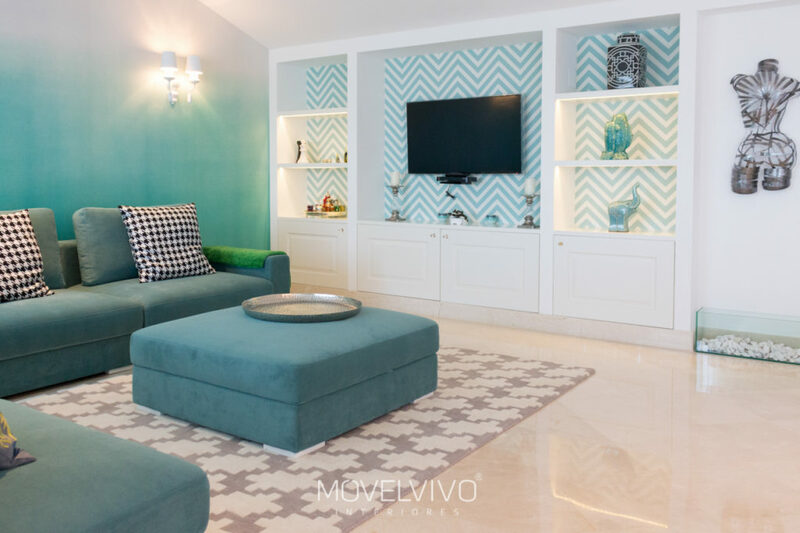 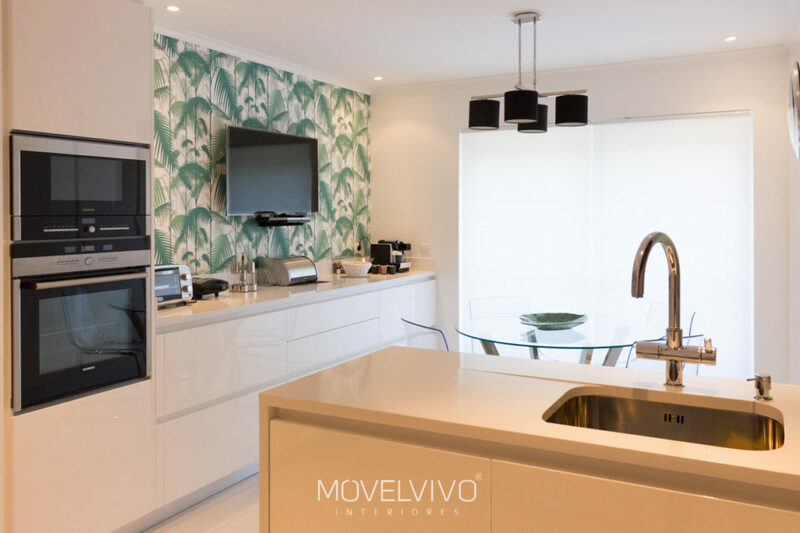 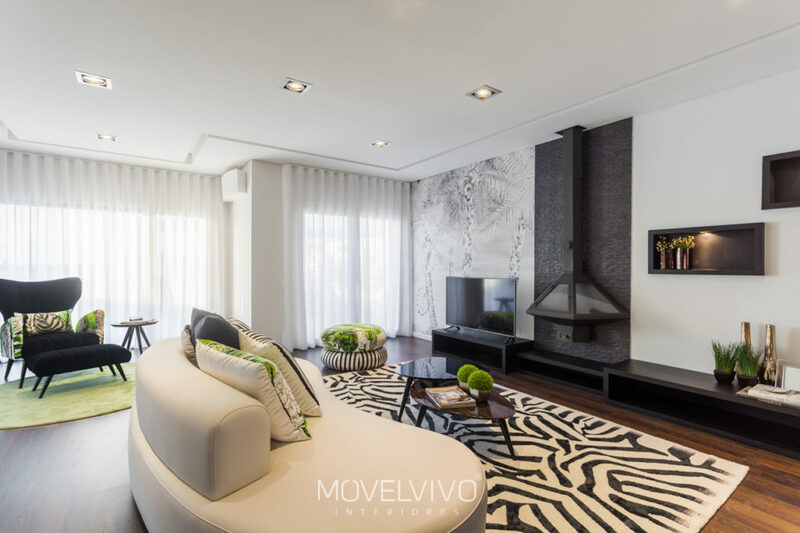 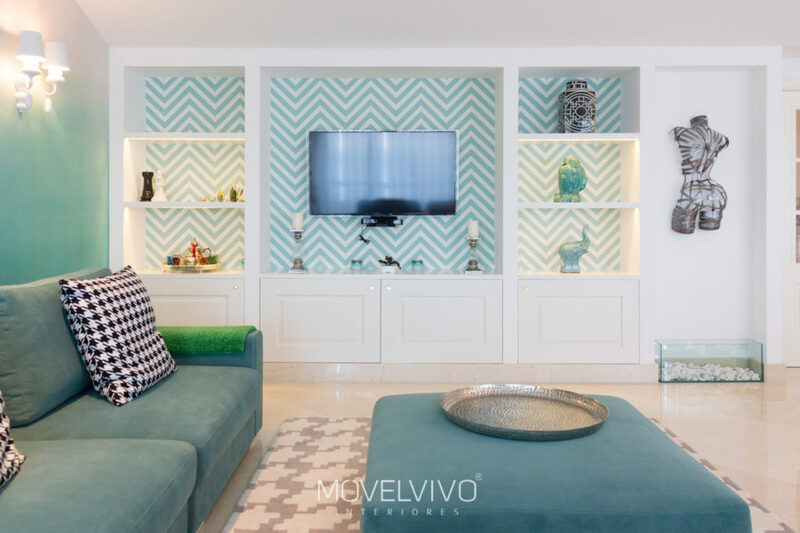 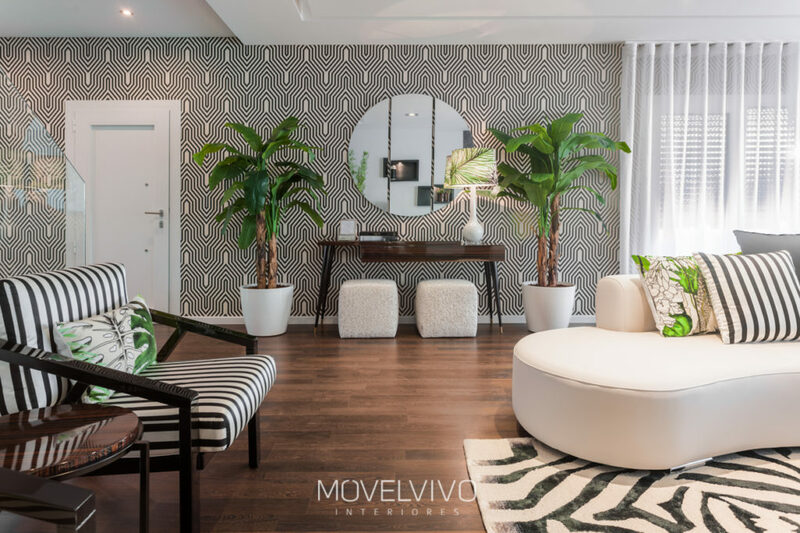 The decoration is 100% exclusive to Movelvivo Interiors, and in each room, you can have a different experience. 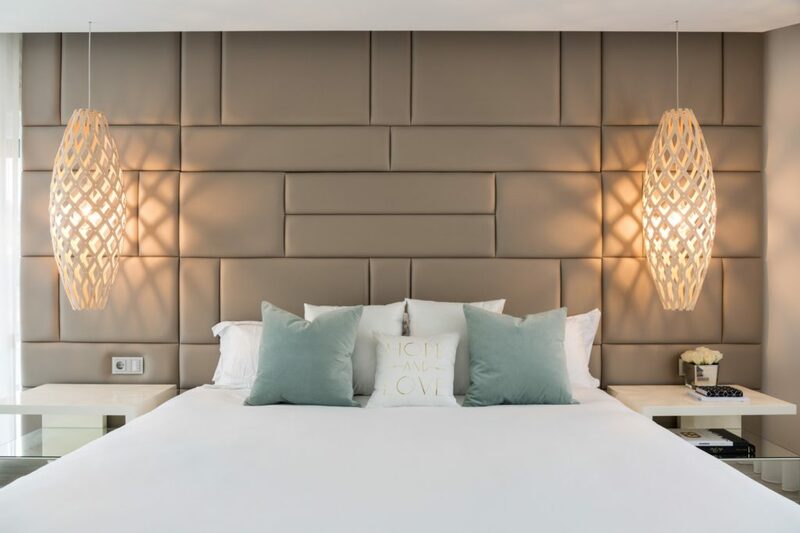 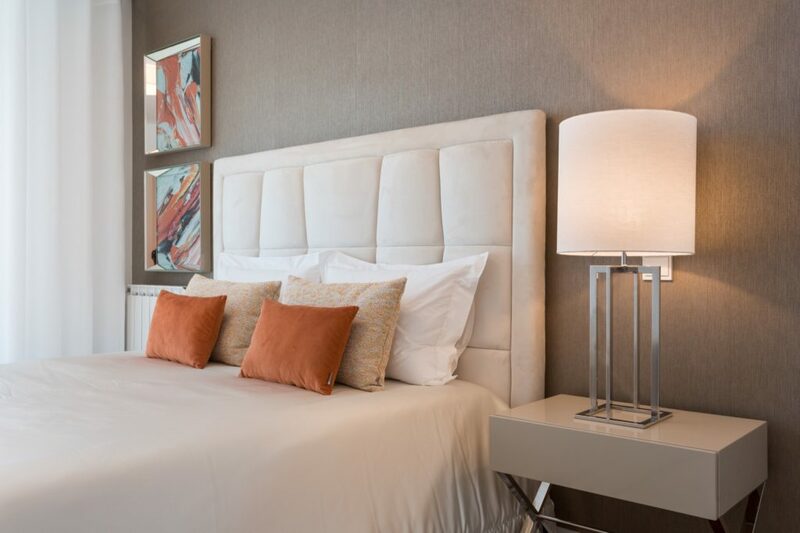 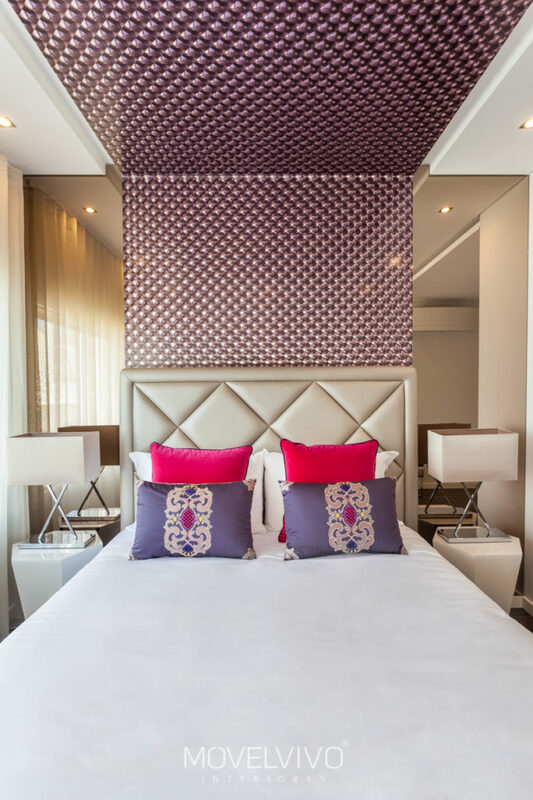 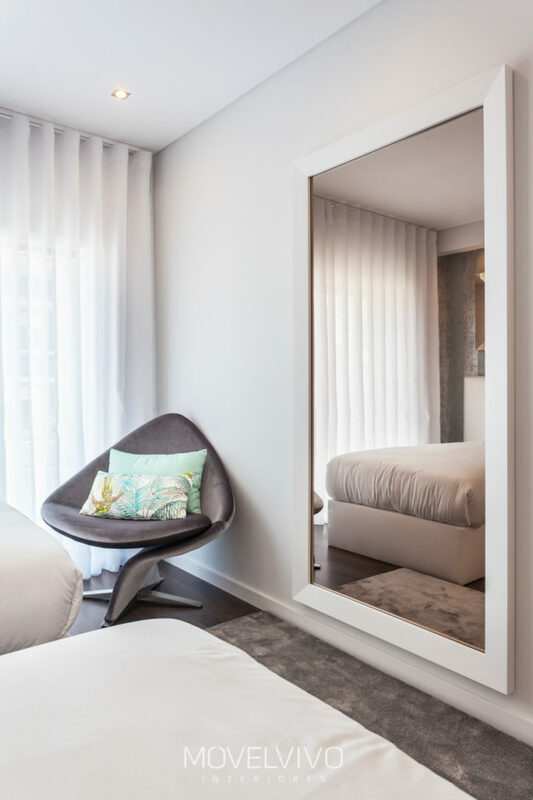 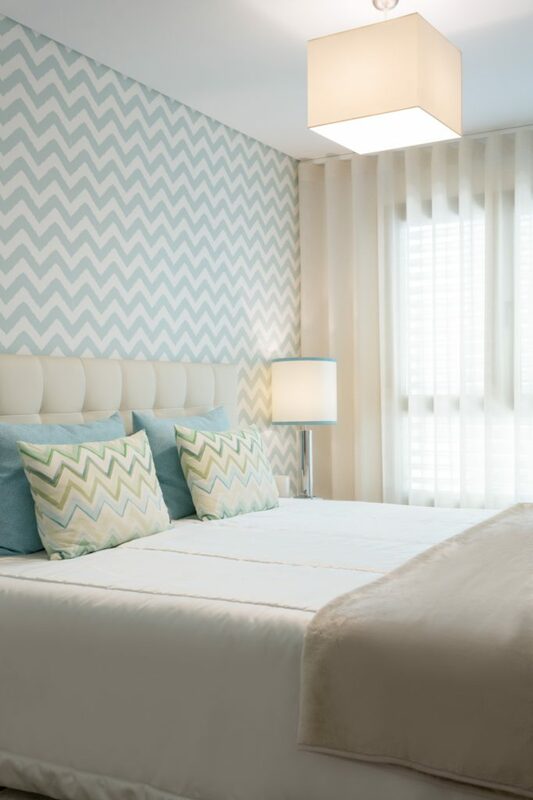 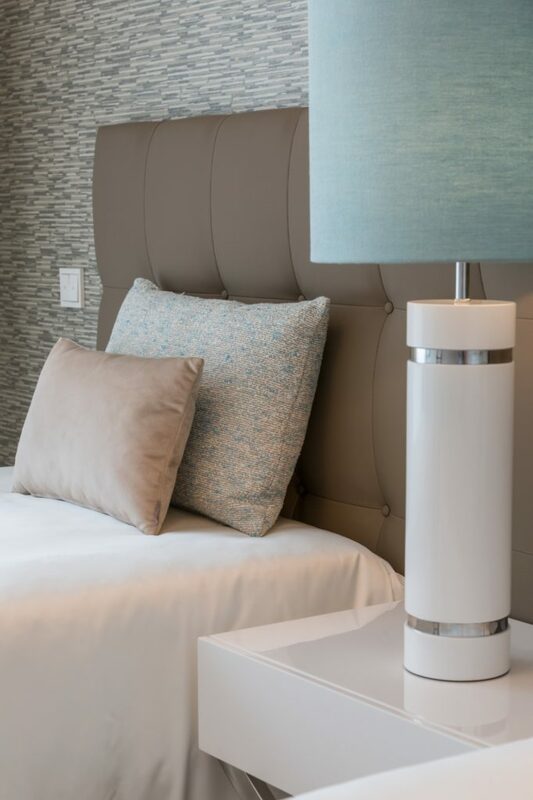 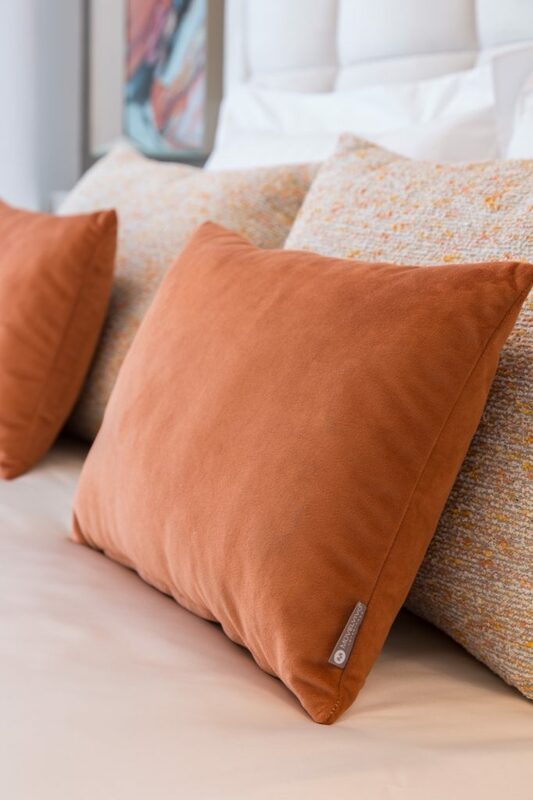 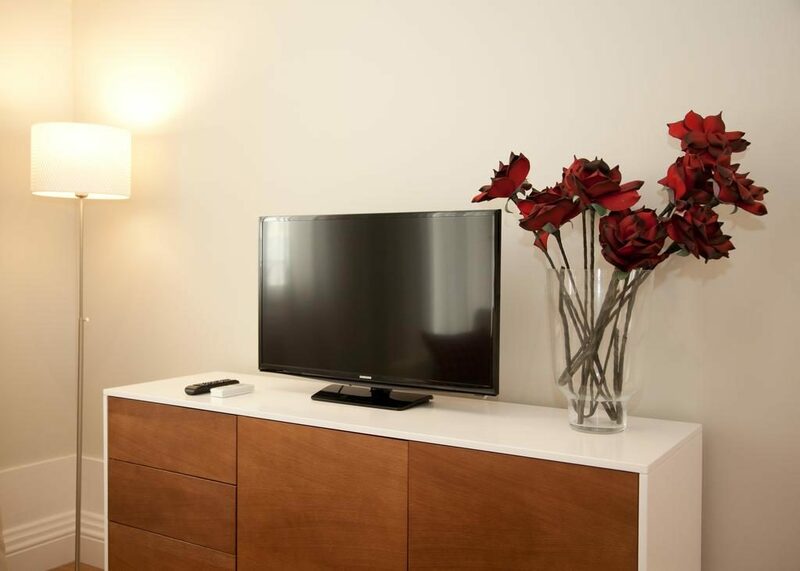 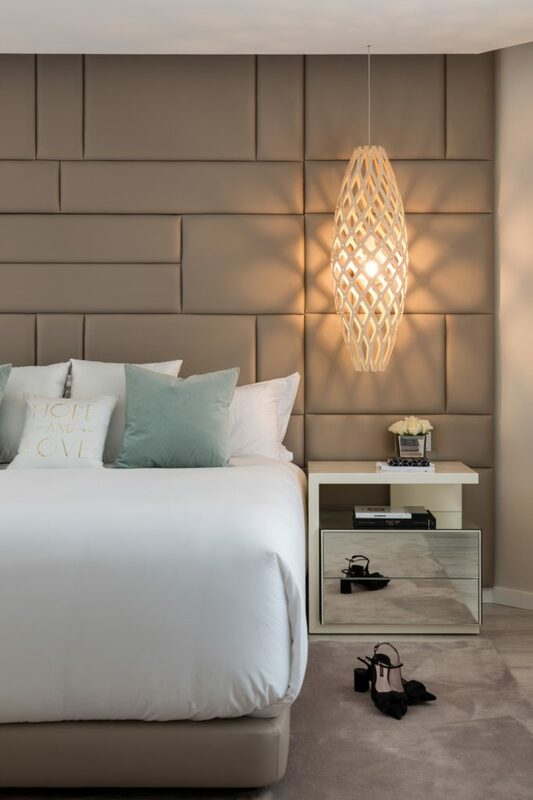 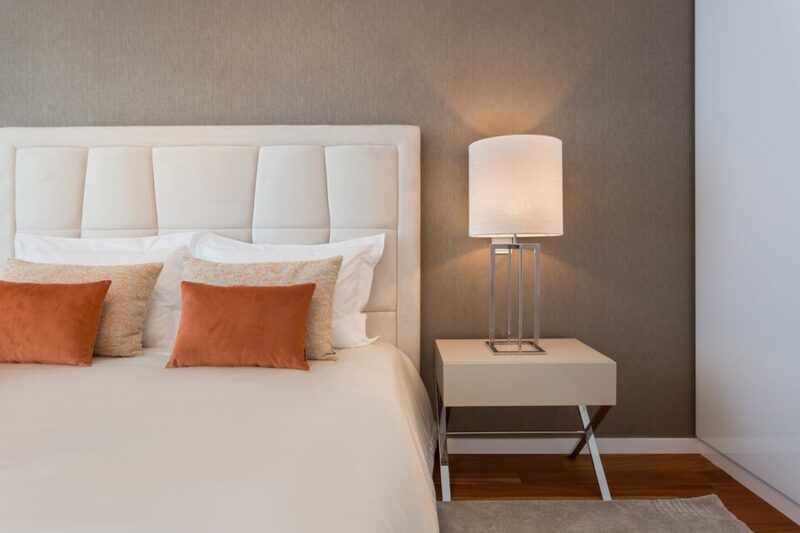 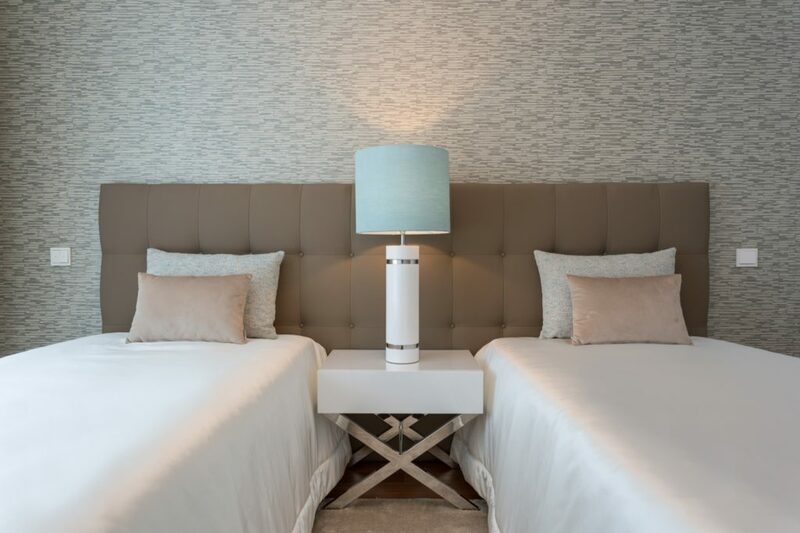 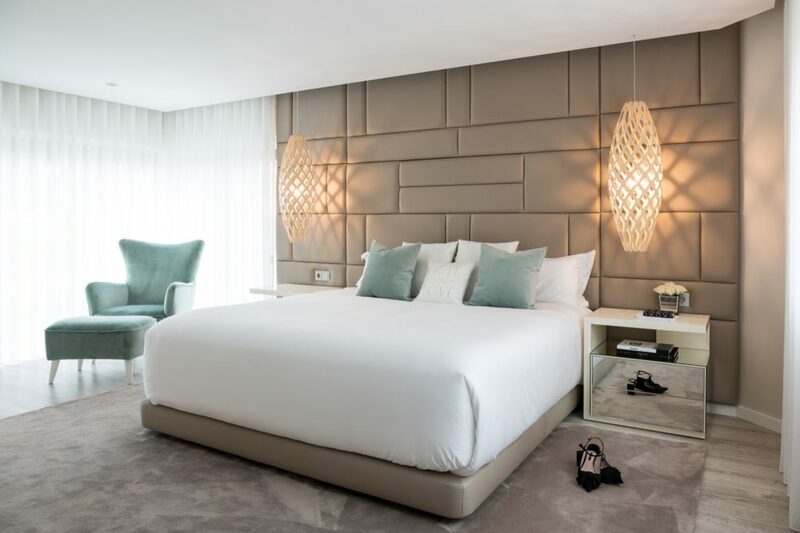 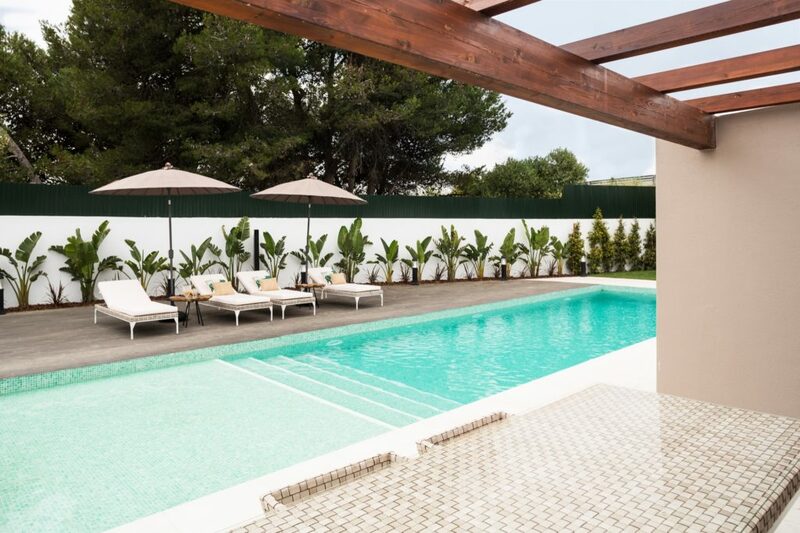 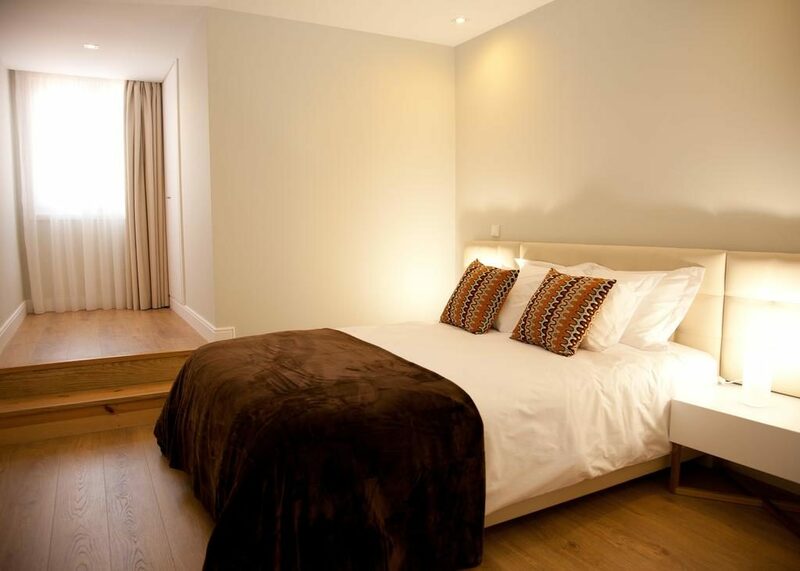 From two warm tones to a more minimalist design, you will have a unique feeling of staying at this hotel. 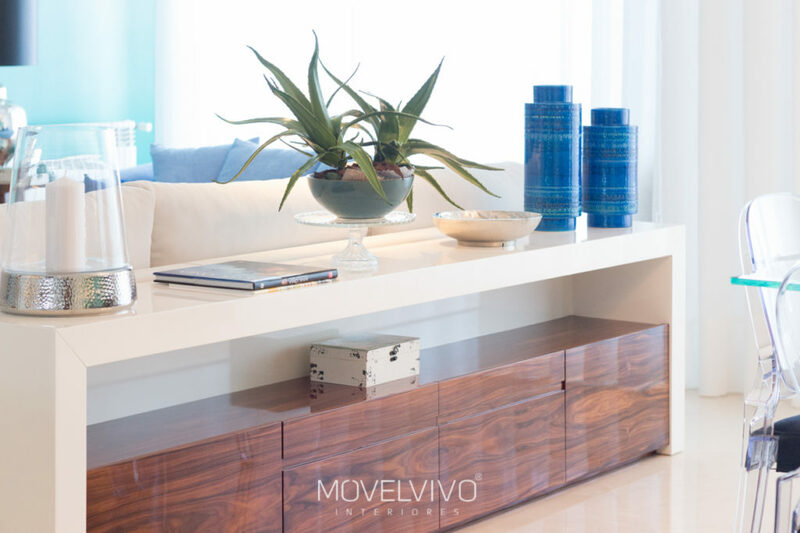 Once again, Movelvivo can demonstrate that it is the best partner for your business. 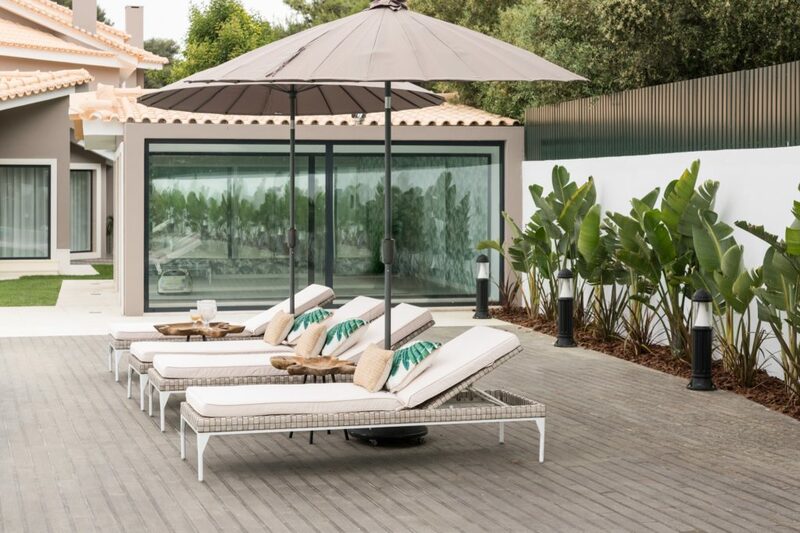 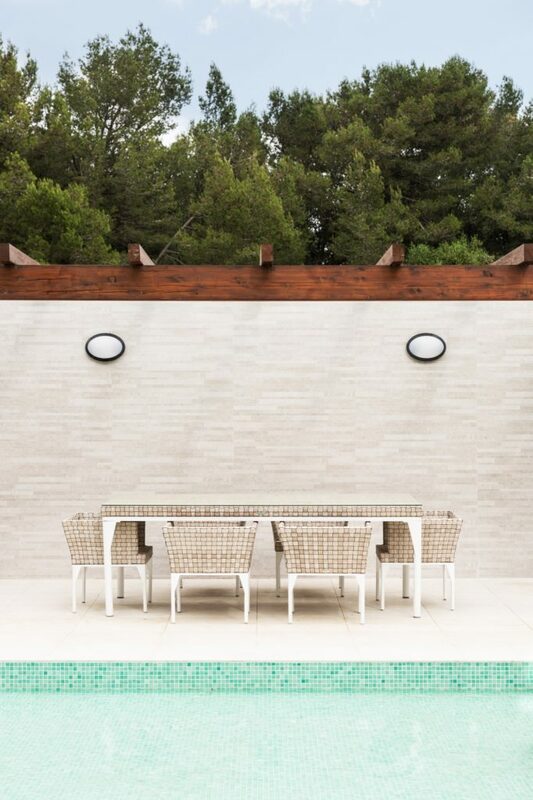 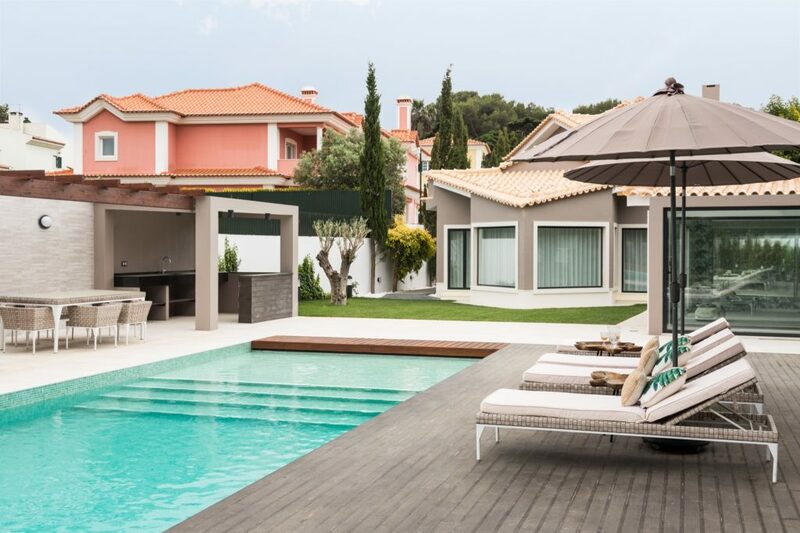 This Scandinavian and Eclectic project is probably one of the most prestigious masterpieces of residential projects in Portugal. 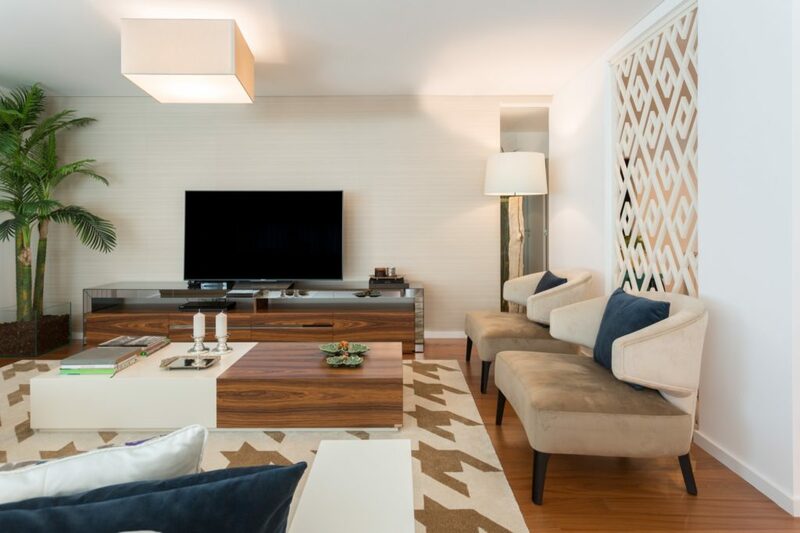 The house has great divisions, but the meticulous decorating style makes the difference in the final result. 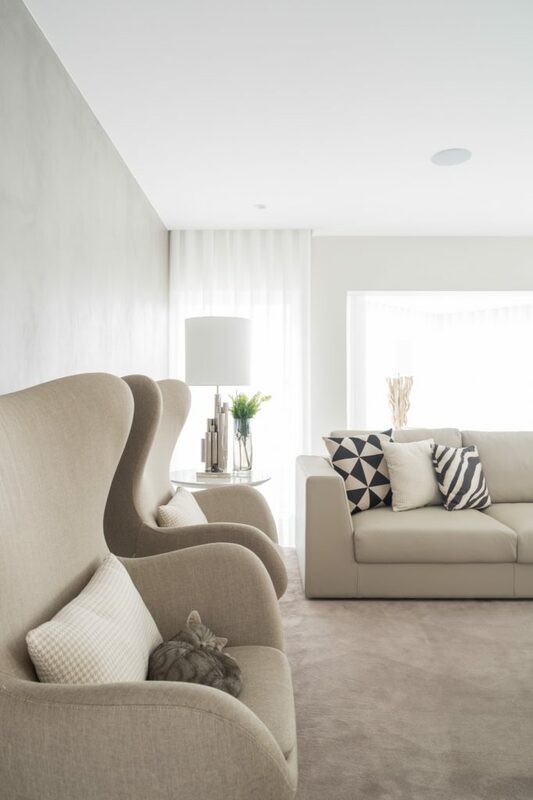 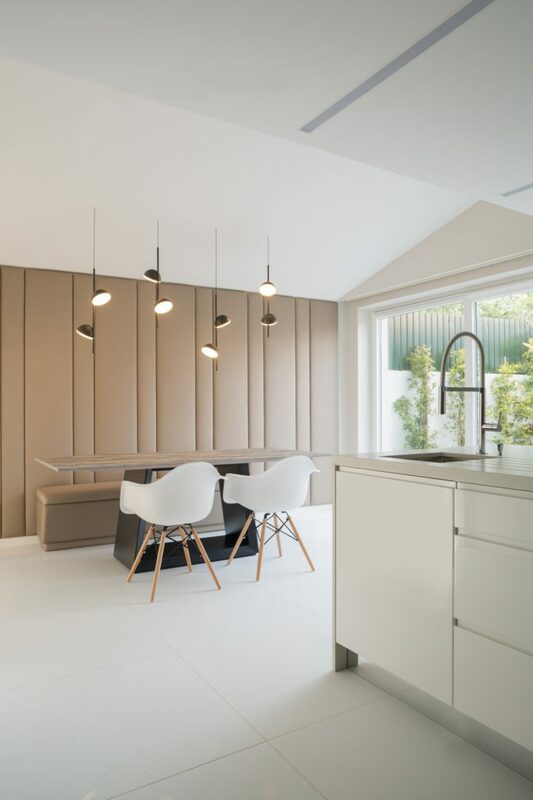 In the Scandinavian style, the main room of this house contains three distinct areas, which although they share the same space, they are very different from each other. 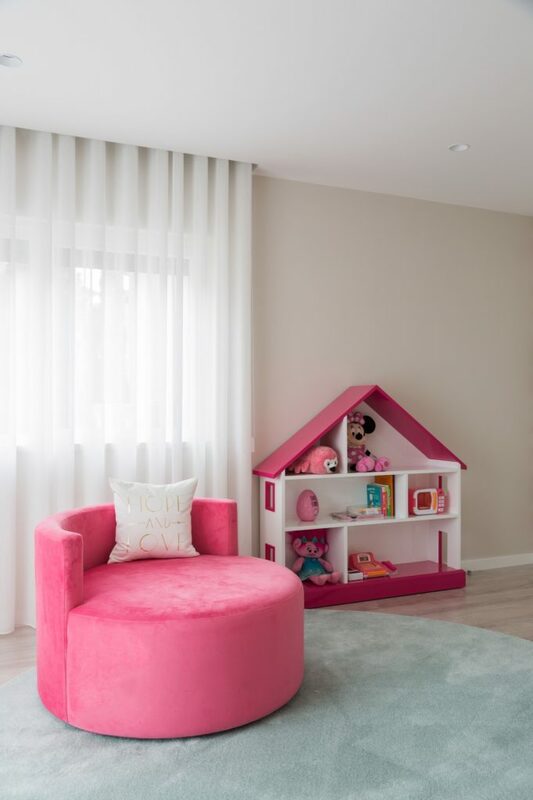 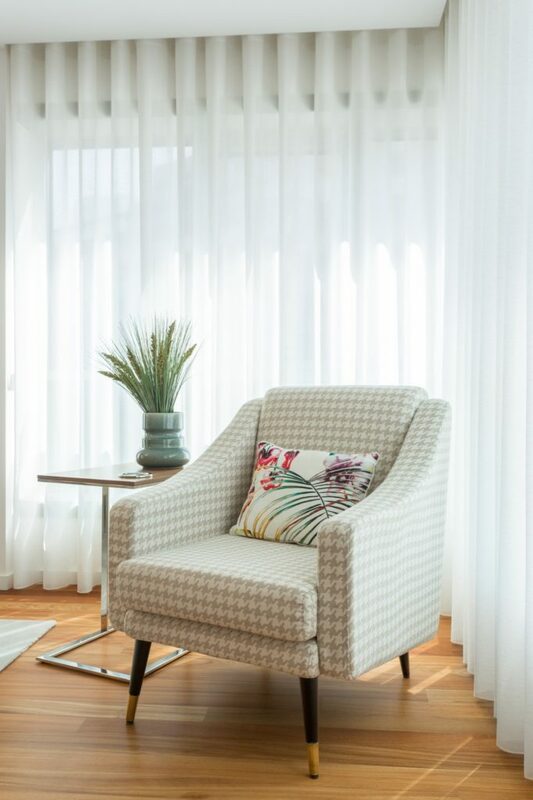 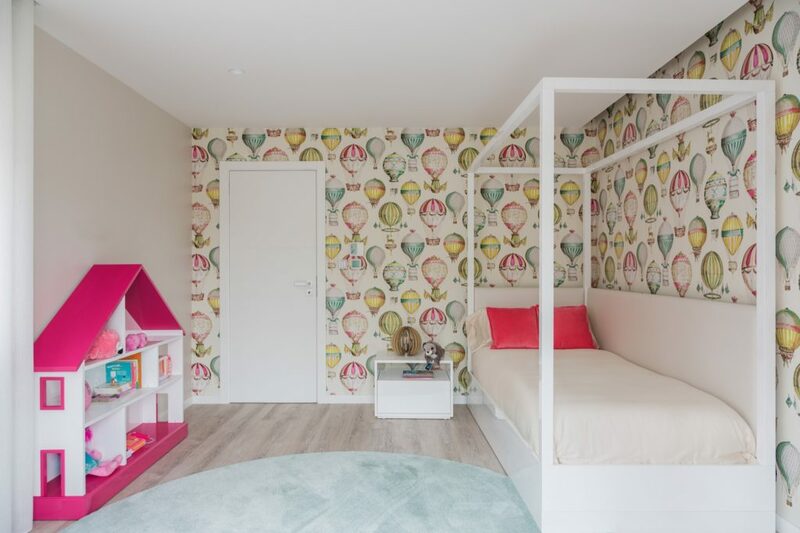 The reading corner is really an appeal to relax, facing a garden with lots of natural light. 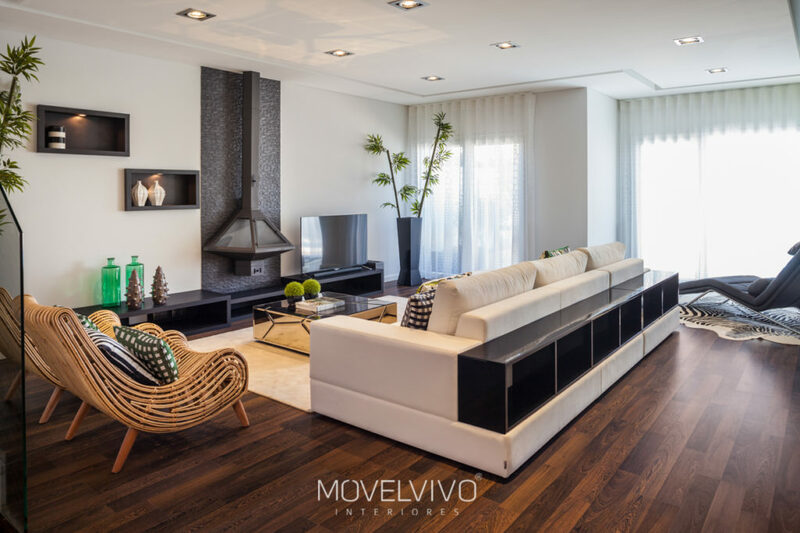 The living room is pleasant and comfortable. 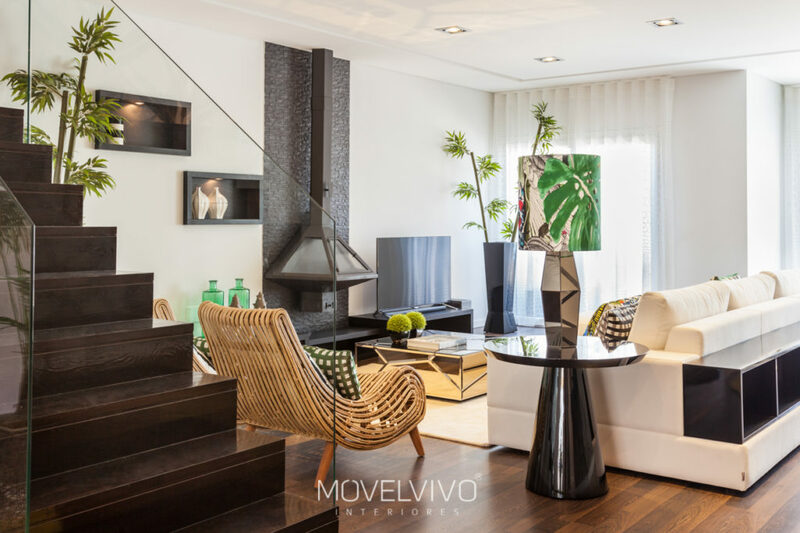 Look to the dining room, besides glamorous, can be connected to the living area through his stunning fireplace. 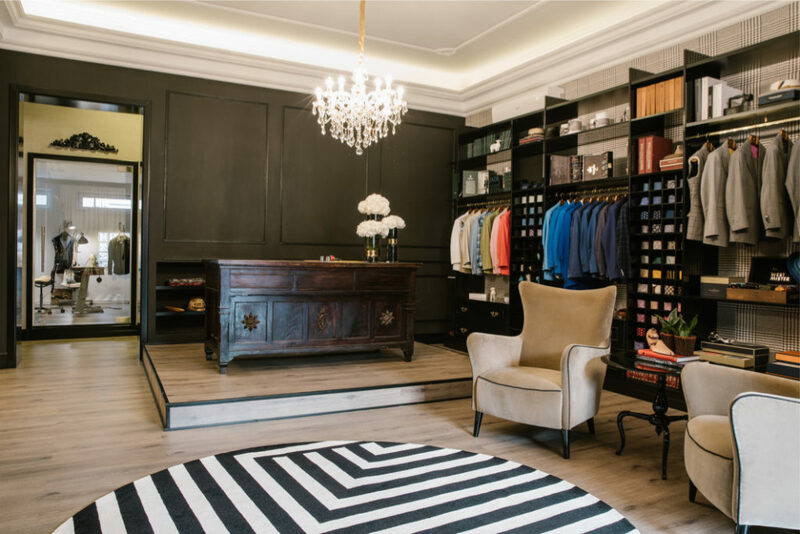 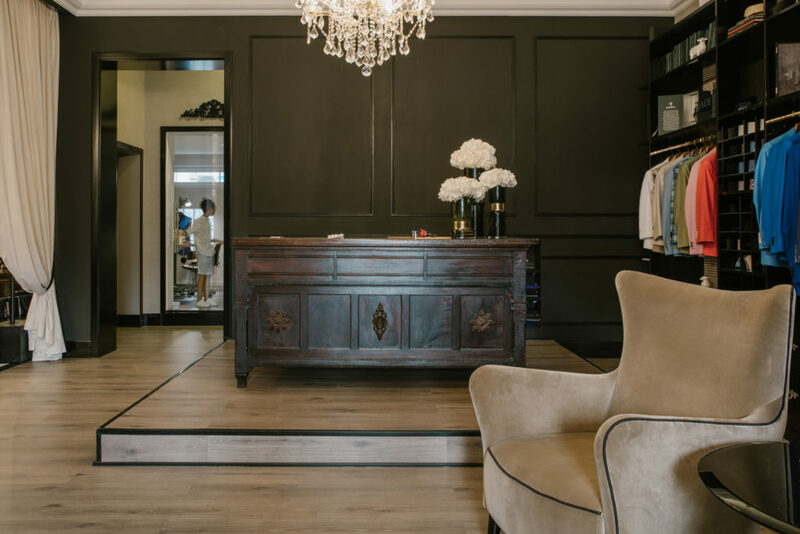 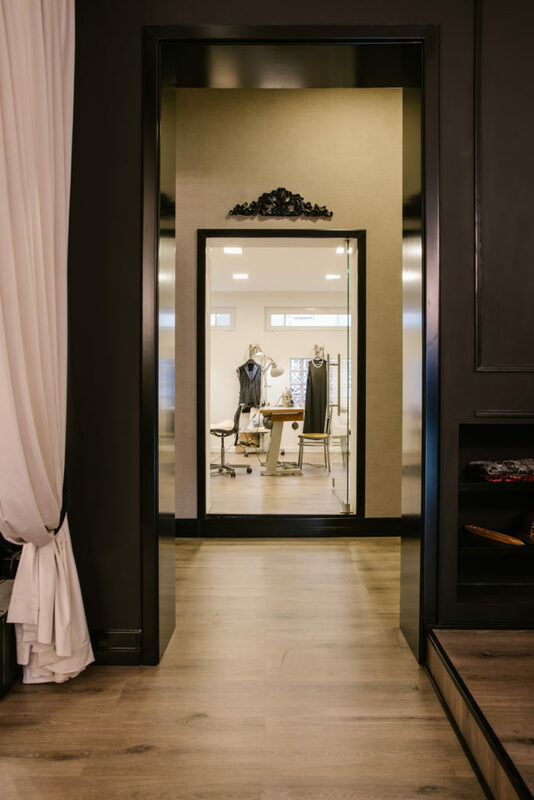 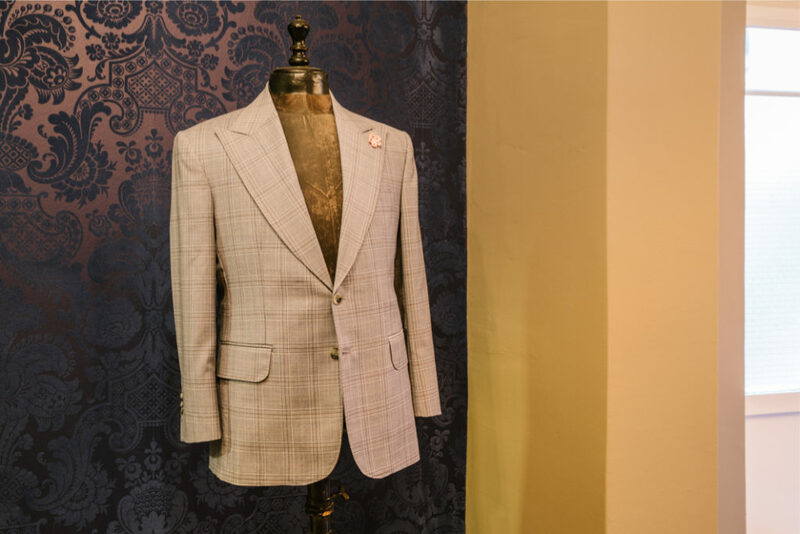 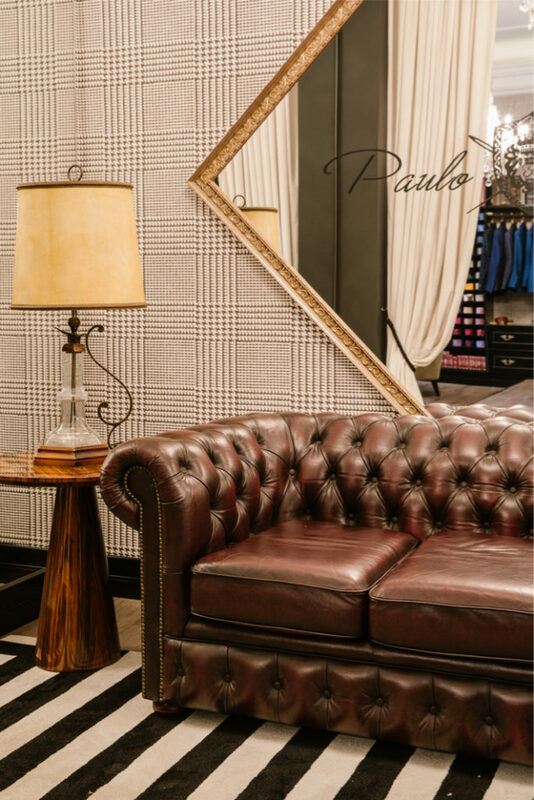 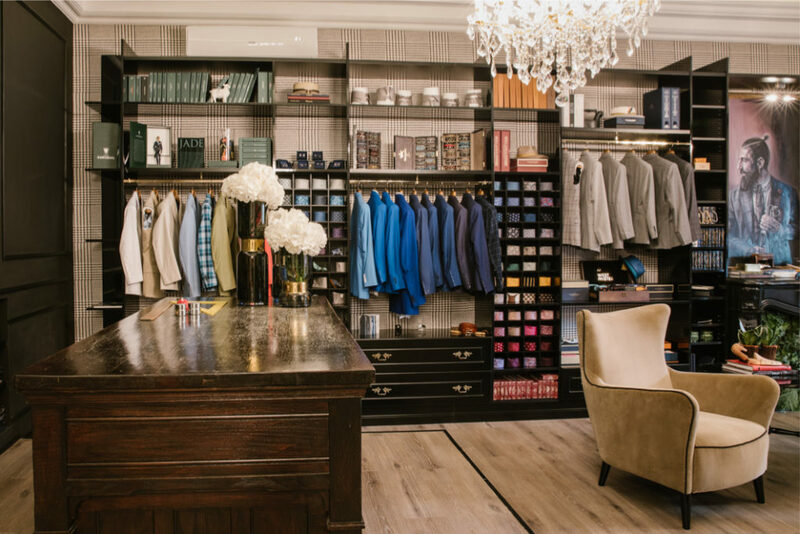 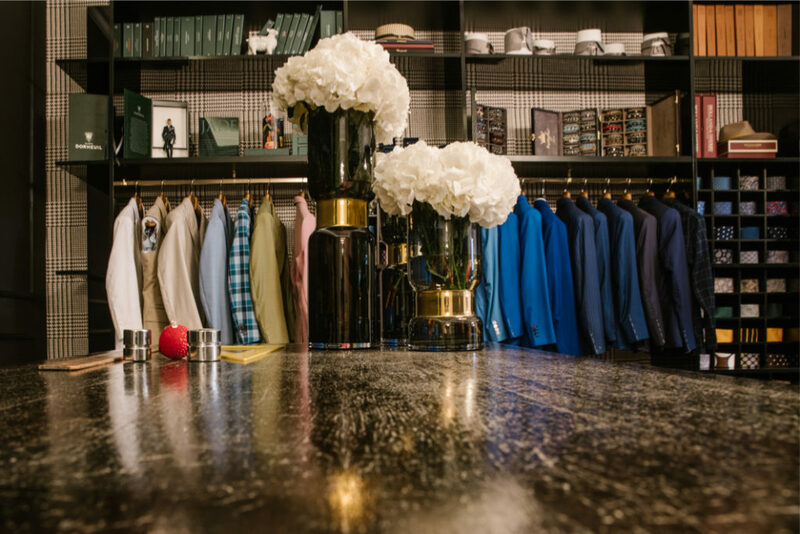 Paulo Battista’s Tailoring is one of the most recent proofs of our Contract solutions. 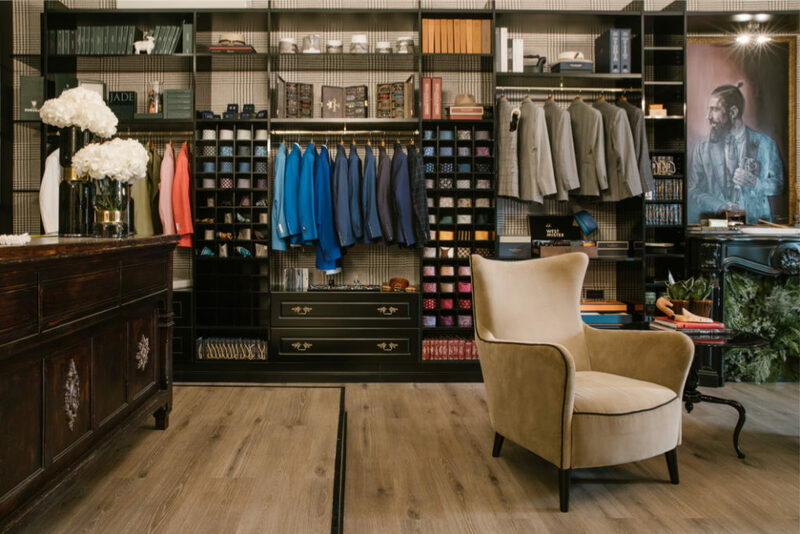 It’s divided into work rooms, the tailor invites those who pass by, to know the secrets of this artisan work. 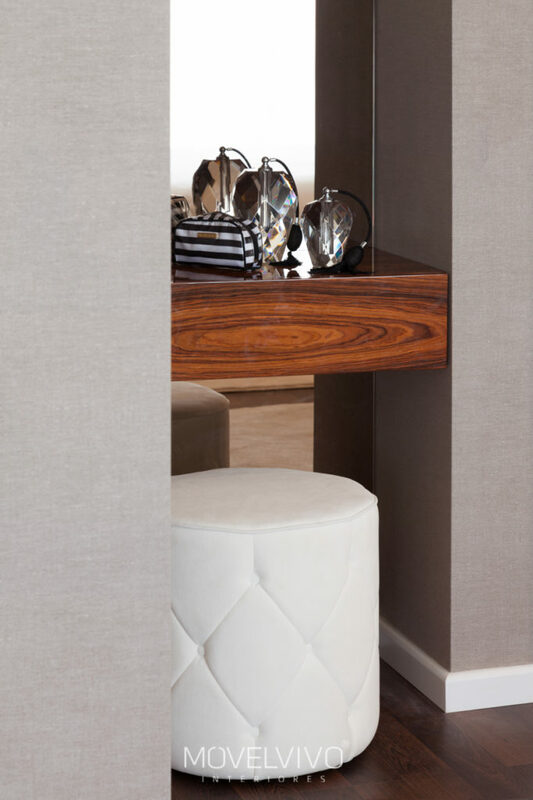 The work desk imposes itself in the center of the room that welcomes who enters. 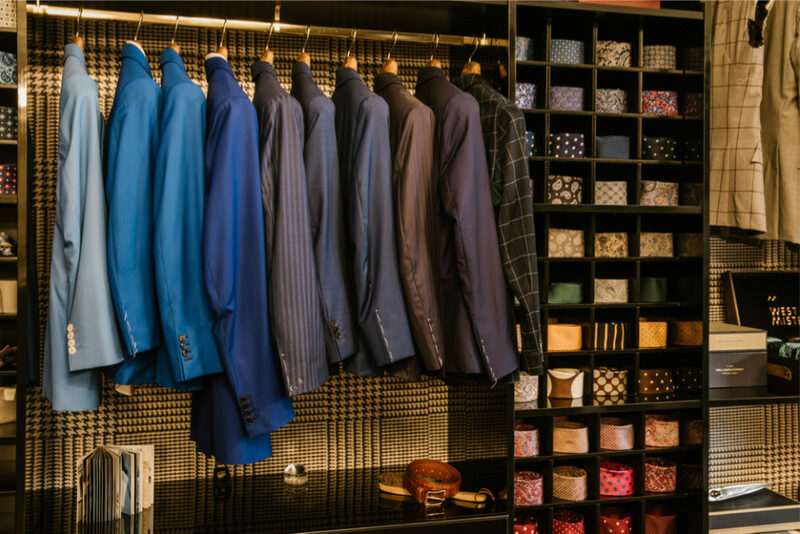 You can see him tailoring molds or cutting fabrics in a half-walled room with a big evidence cabinet. 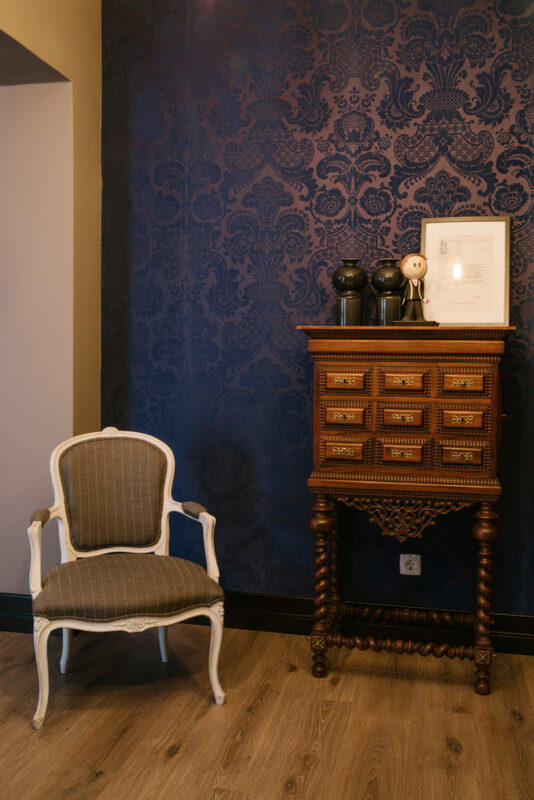 In the background, the sewing studio shows the care work of who knows a suite´s confection. 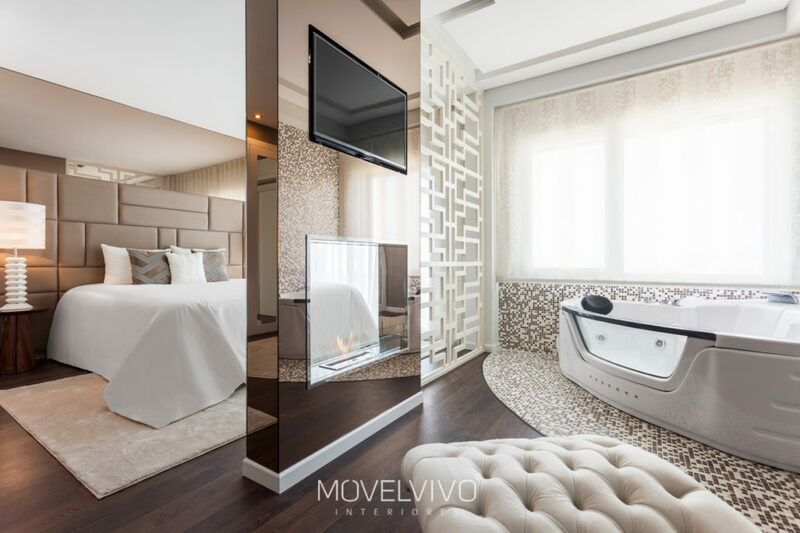 It is no doubt a space that proofs the very high level of Movelvivo’s interior design work. 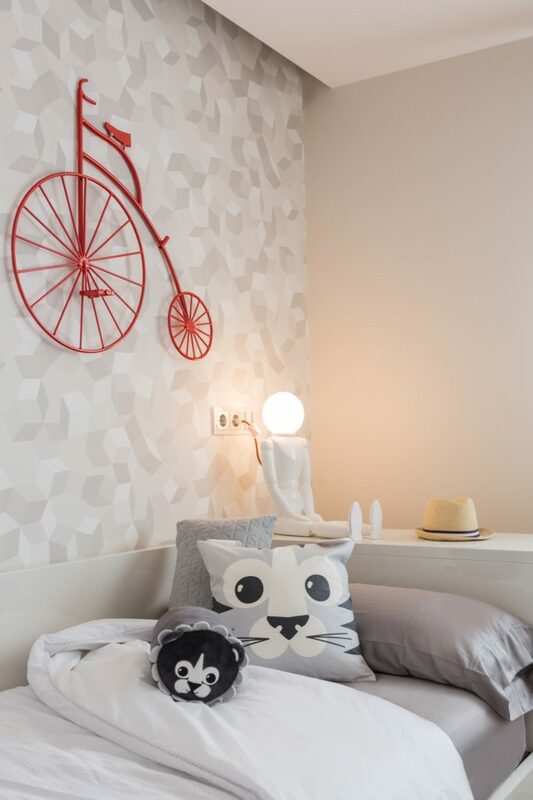 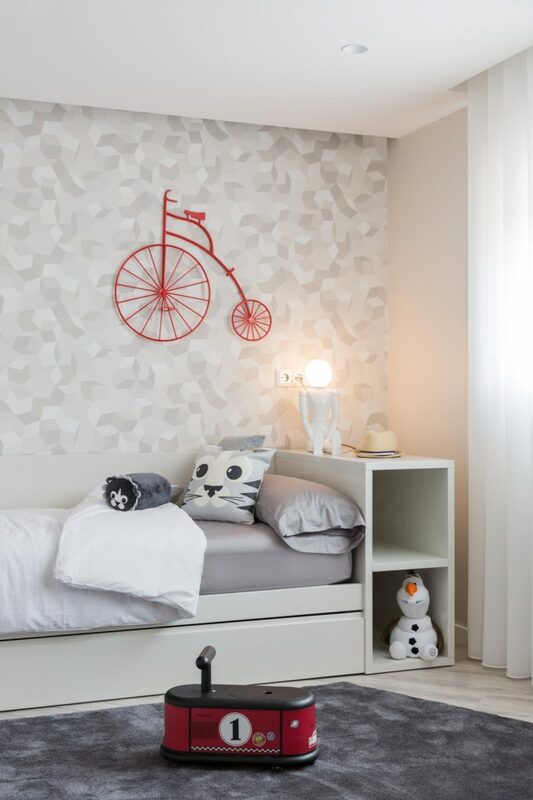 Feel the excitement of this unique design, available on Airbnb. 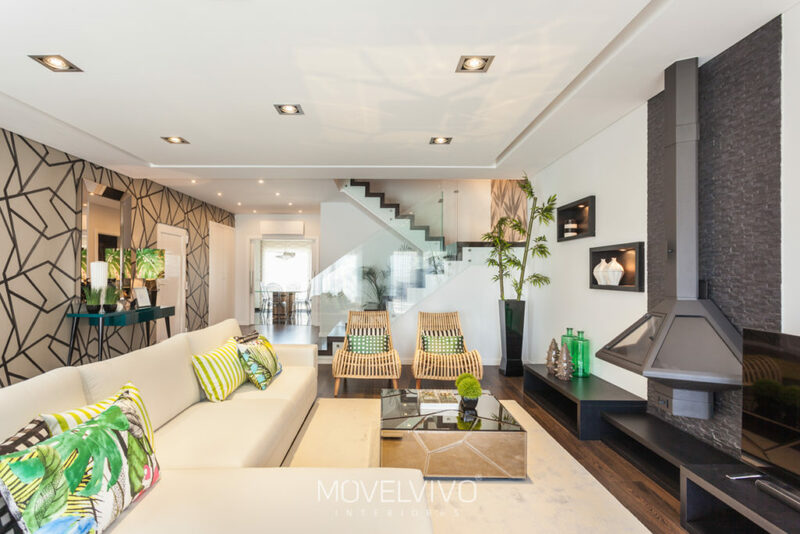 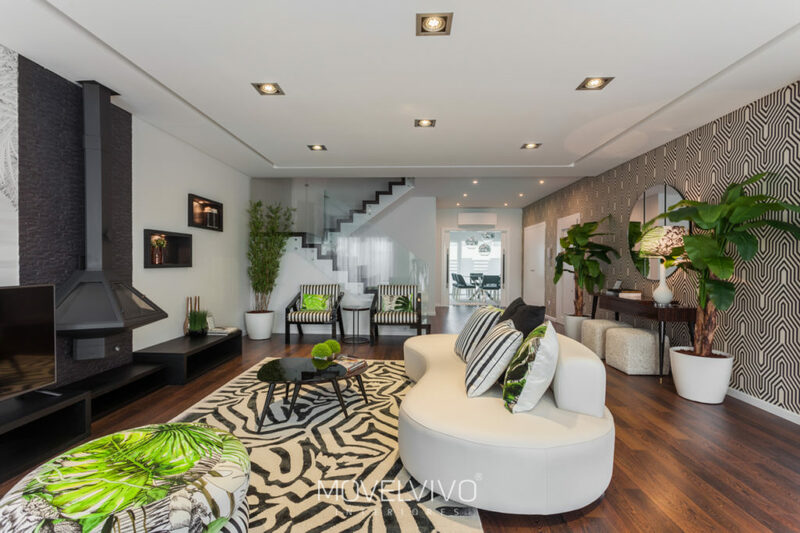 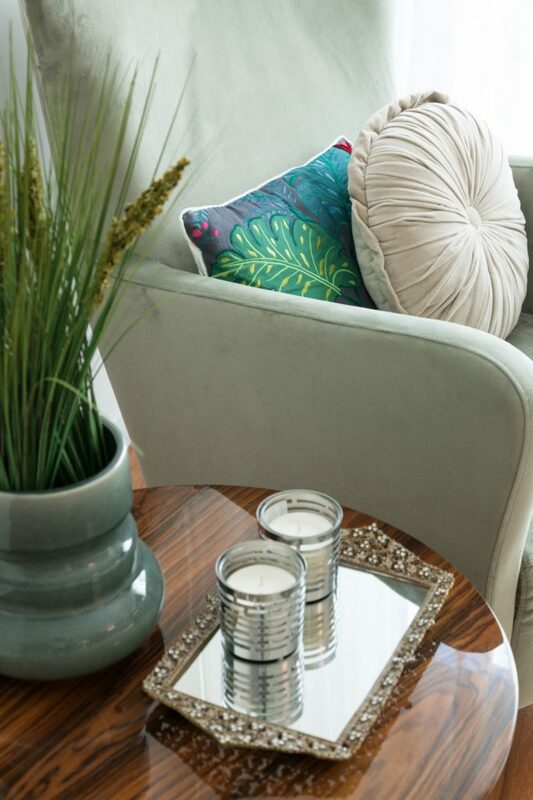 The living room is decorated in dark and light tones filled with nature details in green tones. 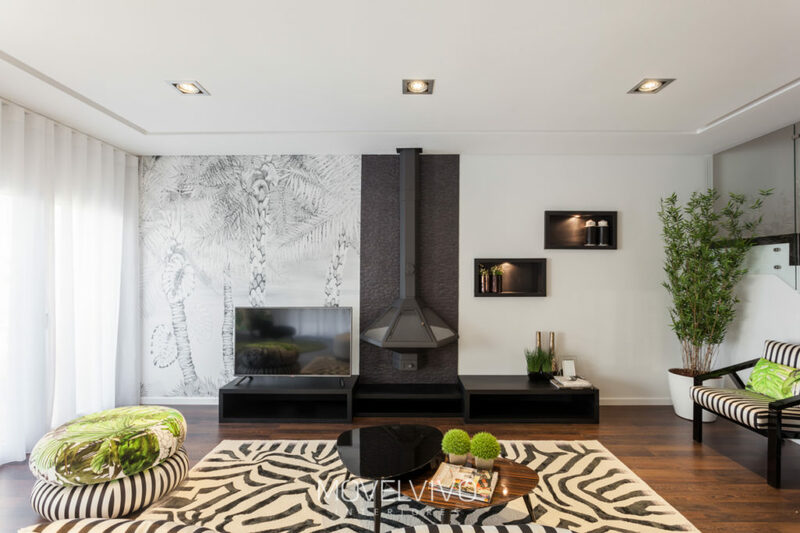 A sofa with a unique design and the support table under the zebra rug are some details of this decoration. 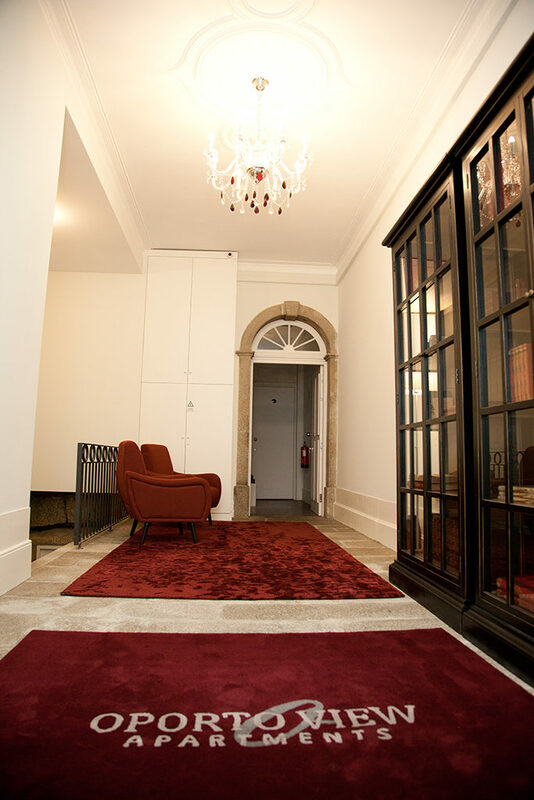 Regarding the reading corner, has a black armchair and rest foot under a green carpet. 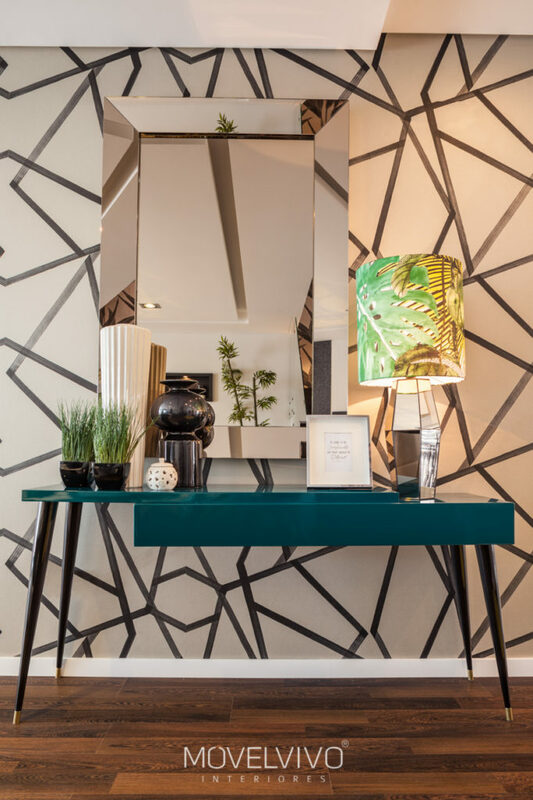 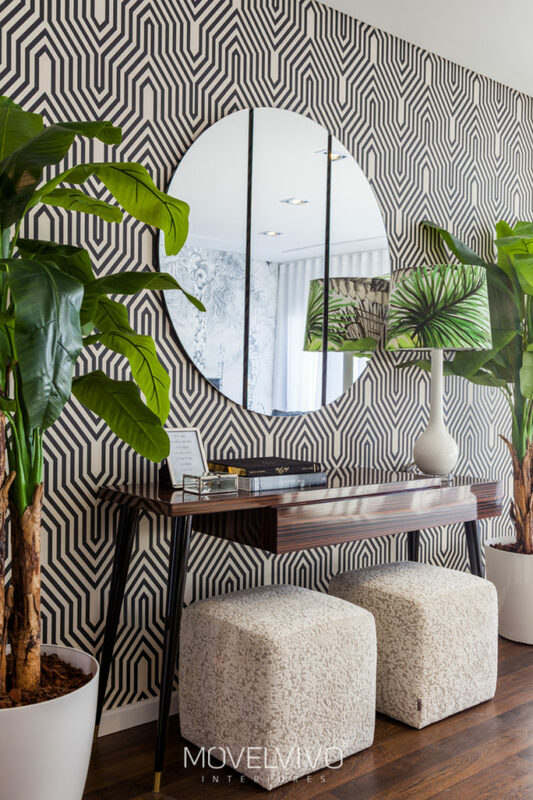 Also, has a wallpaper in zebra pattern filled with a Caiscais Console and a contrasting circle mirror. 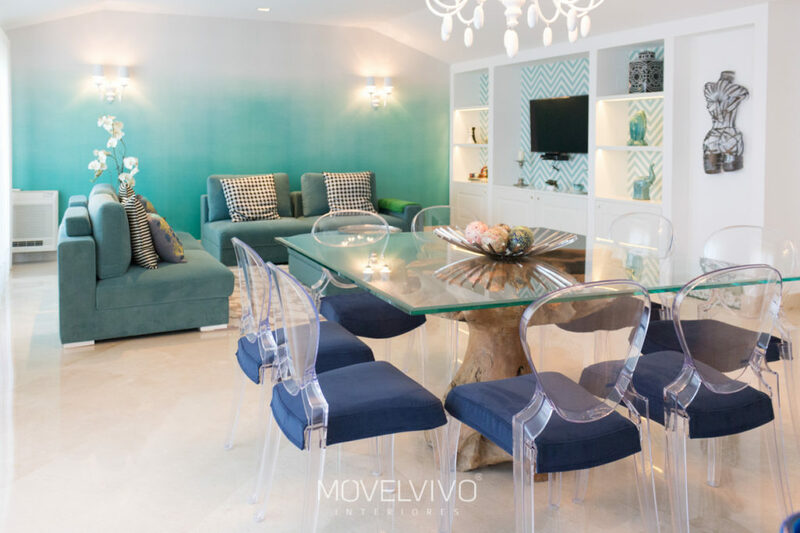 In the dining room, the main color is turquoise, present in the glamorous chairs and also in the wallpaper. 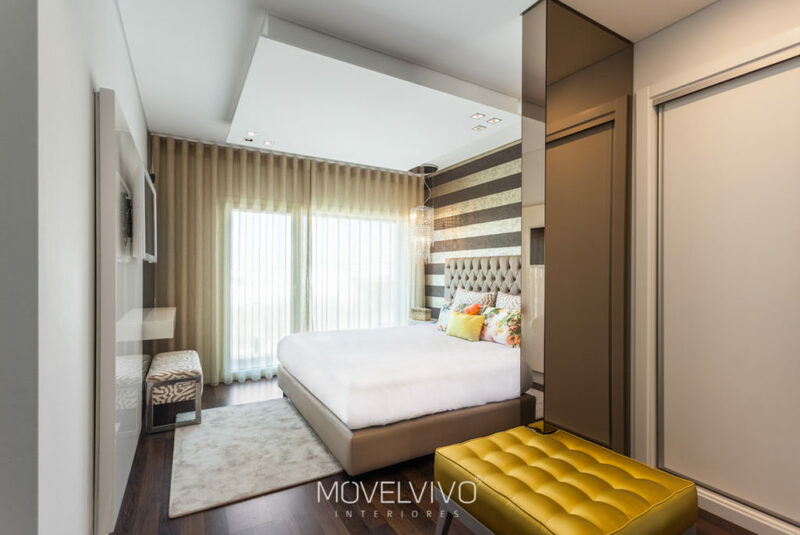 Another strong point is the extravagance of the master bedroom, with a chaise-longue corner, and a luxurious Jacuzzi in the bathroom. 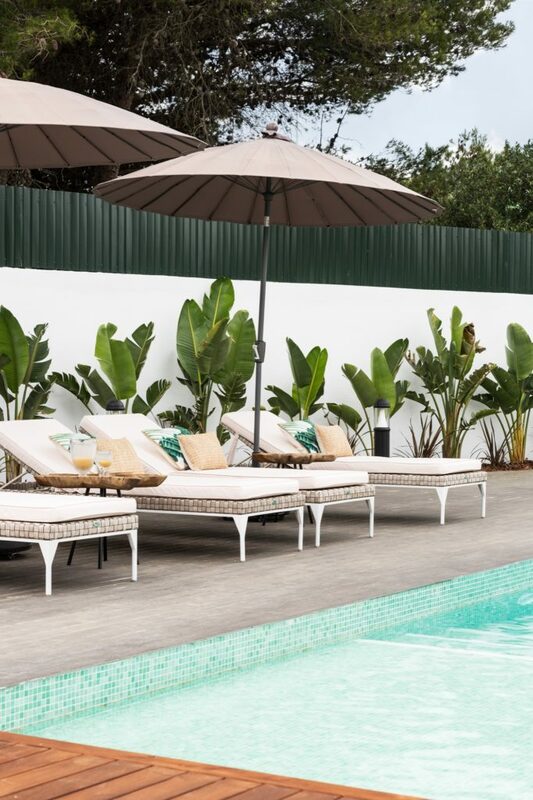 An Airbnb Habitat as exotic as this awakens all the senses of the human being. 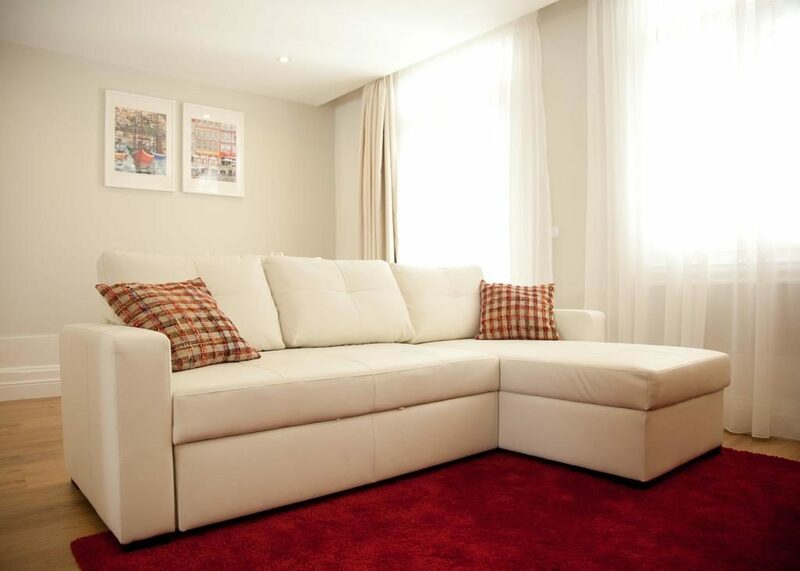 A magnificent sofa with a detail of the bookcase on the back makes him totally different. 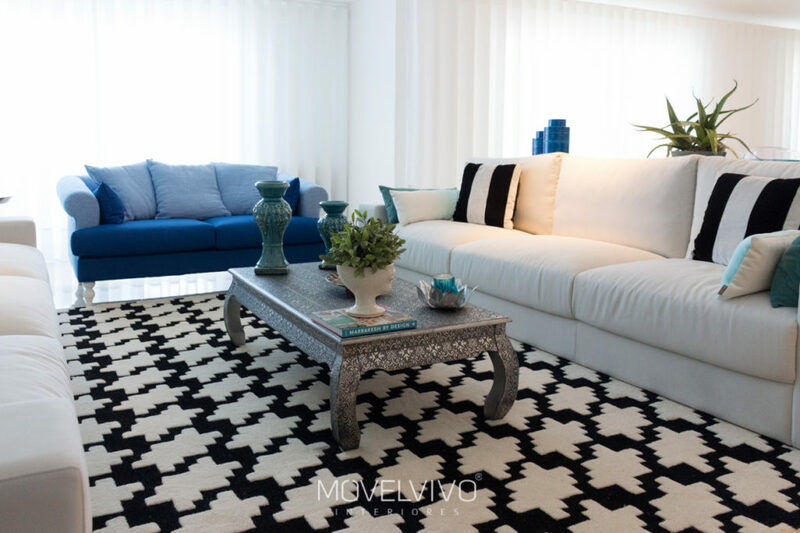 In the corner, a chaise-longue under a zebra rug, for more impersonal moments. 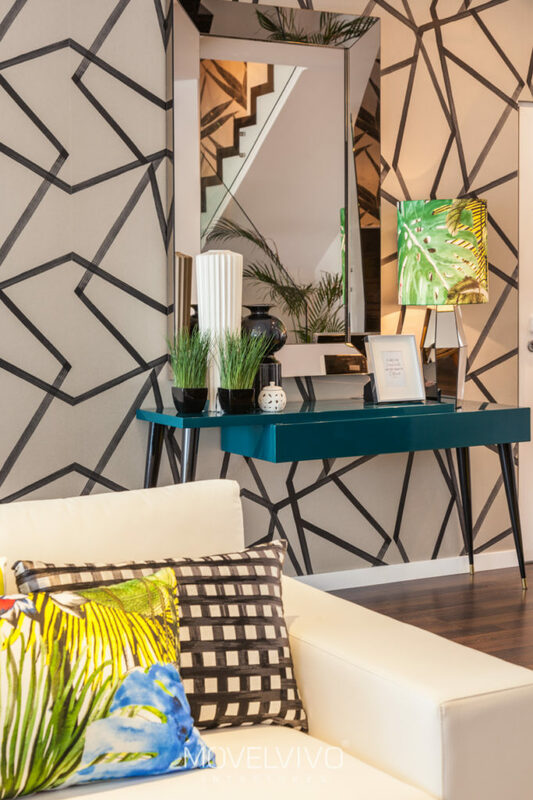 The Living Room has an abstract paint carved into a wallpaper. 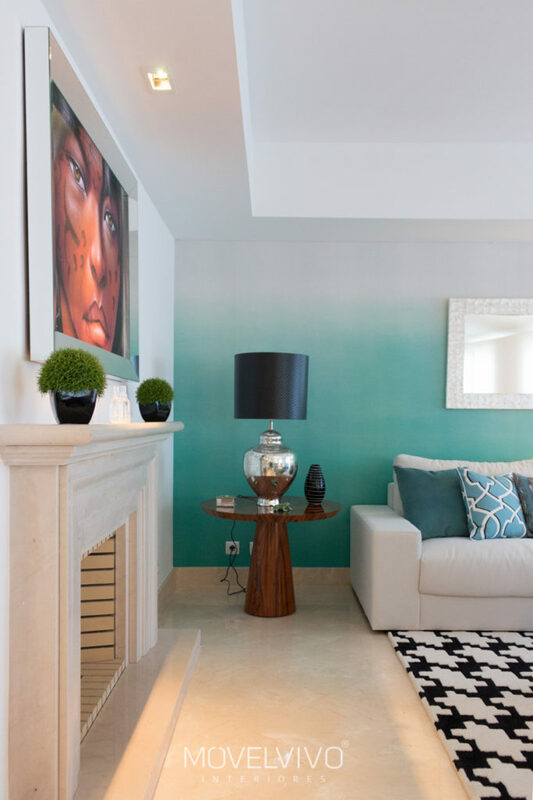 Passing through a hall filled with a Cascais console in tones of green Amazonian. 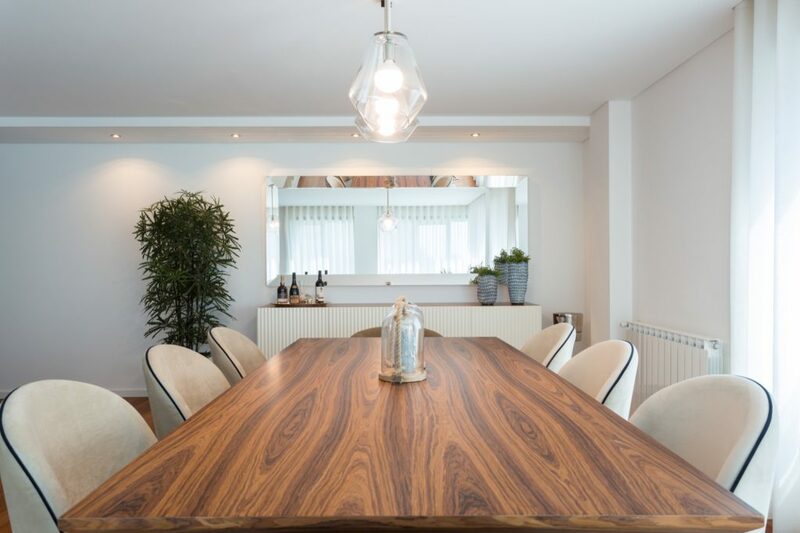 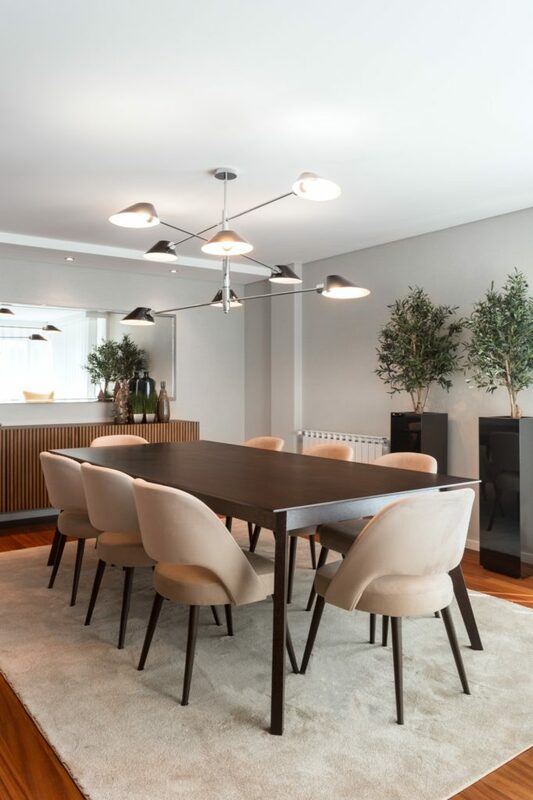 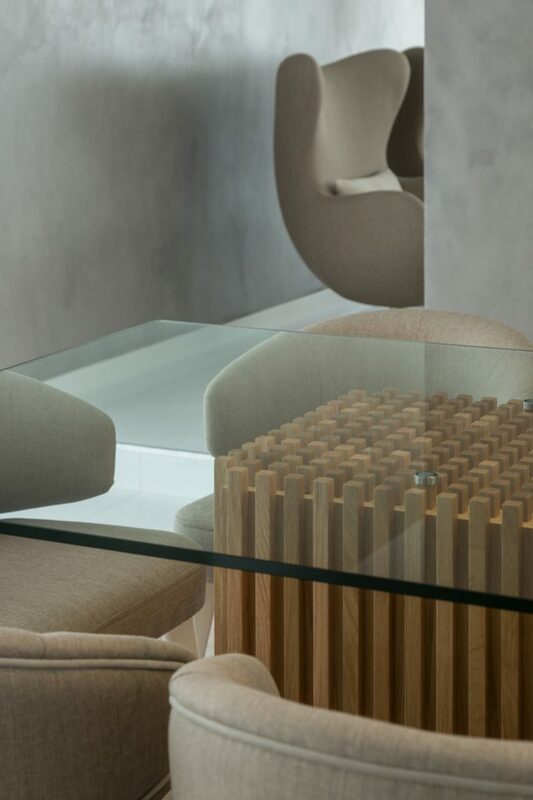 In the dining area, a natural space with a rectangular glass table, highlighting the wonderful wooden foot. 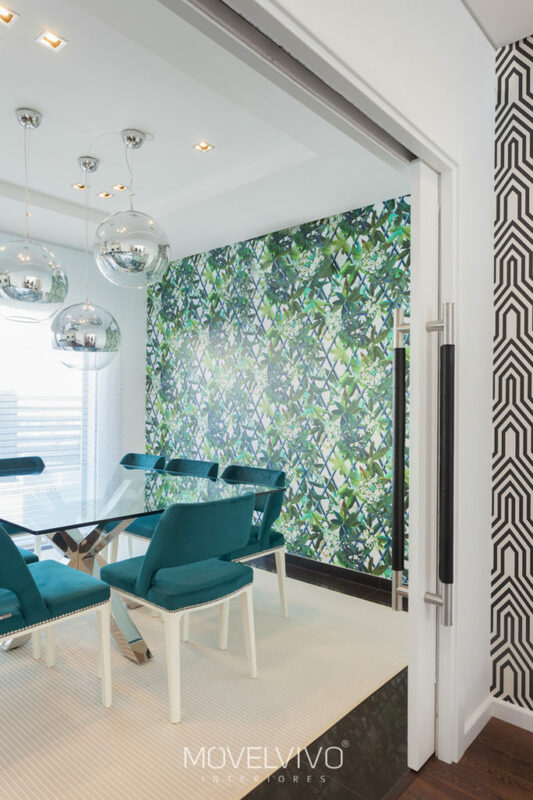 Surrounded by Belle Epoque chairs, this dining room has a wallpaper that lifts us into a warm summer ambiance. 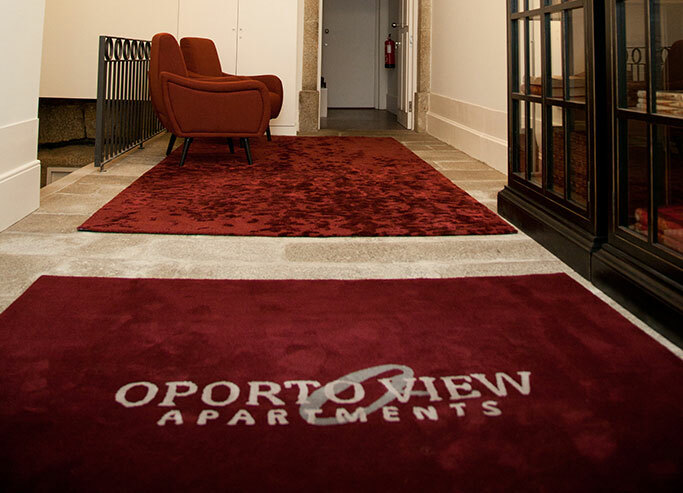 Oporto View Apartments is located in the Oporto historic downtown. 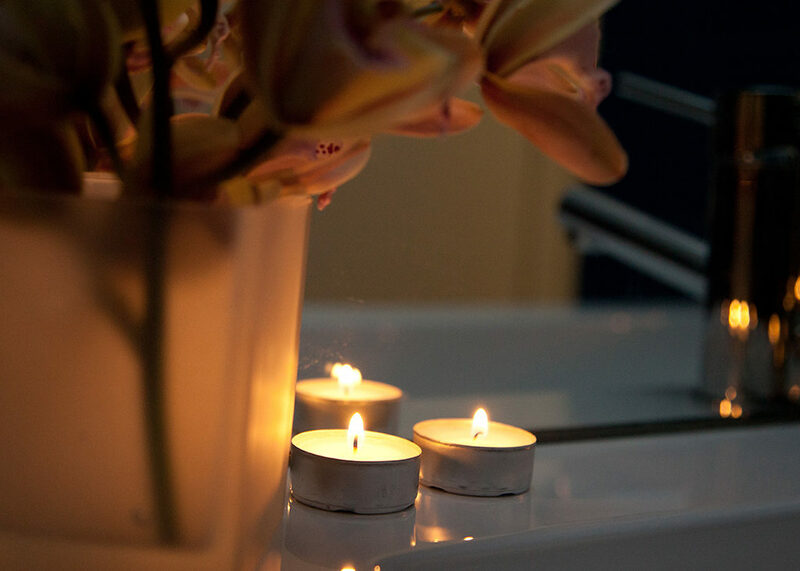 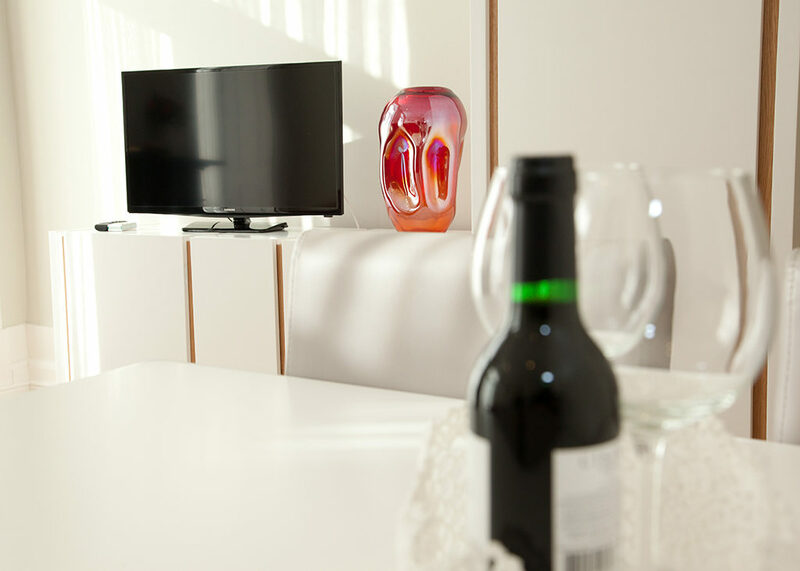 It is a Hotel focused on customer satisfaction and the good experience of your stay. 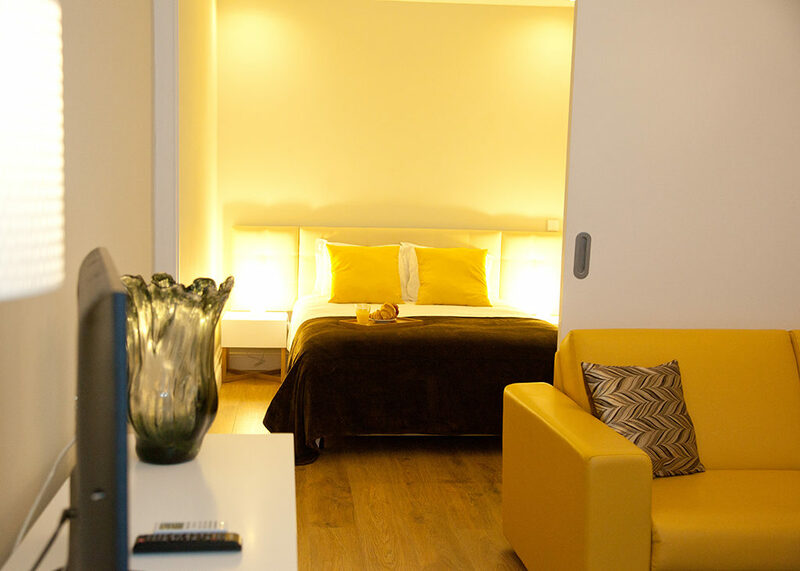 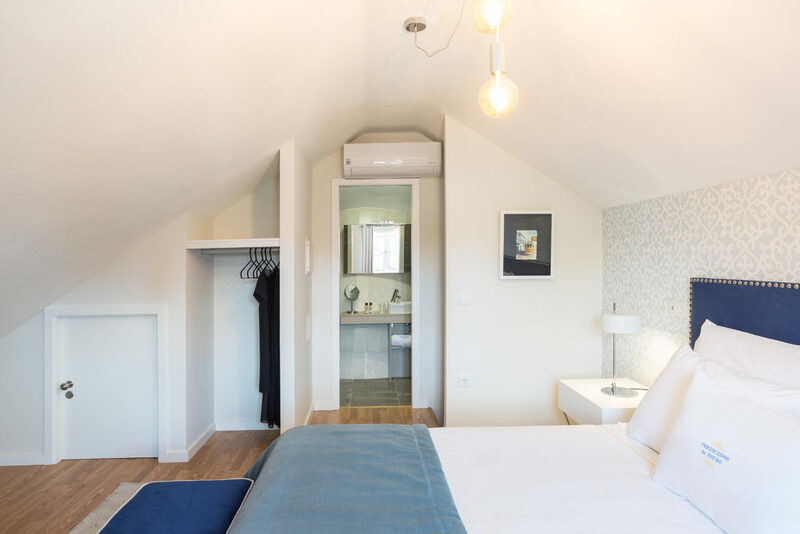 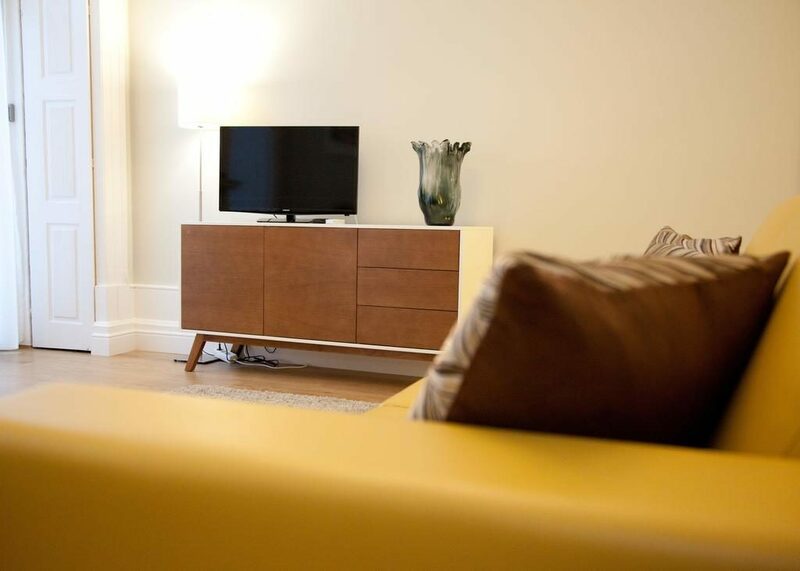 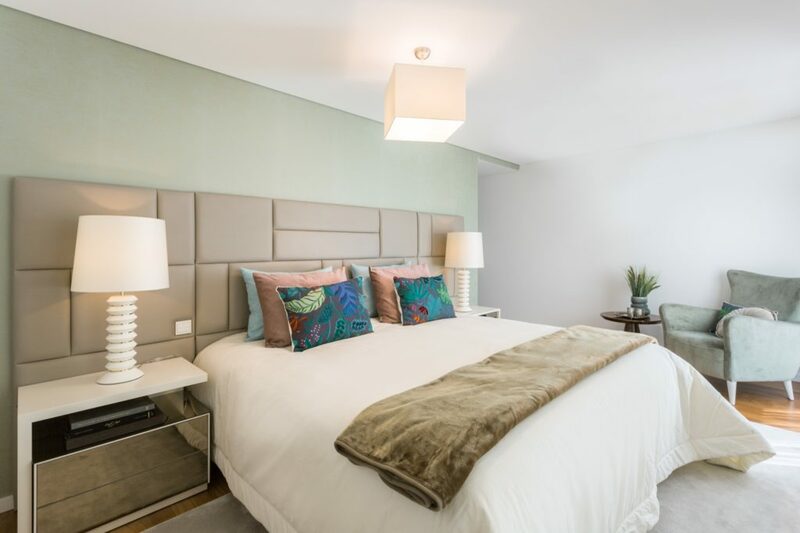 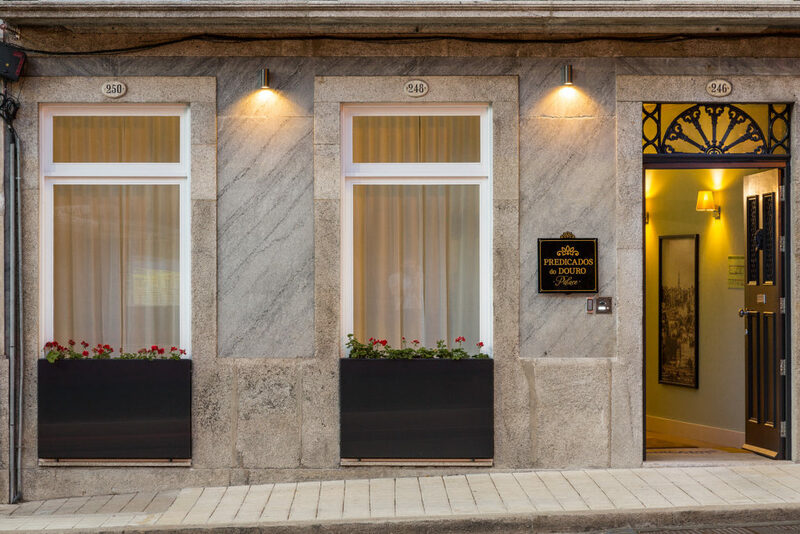 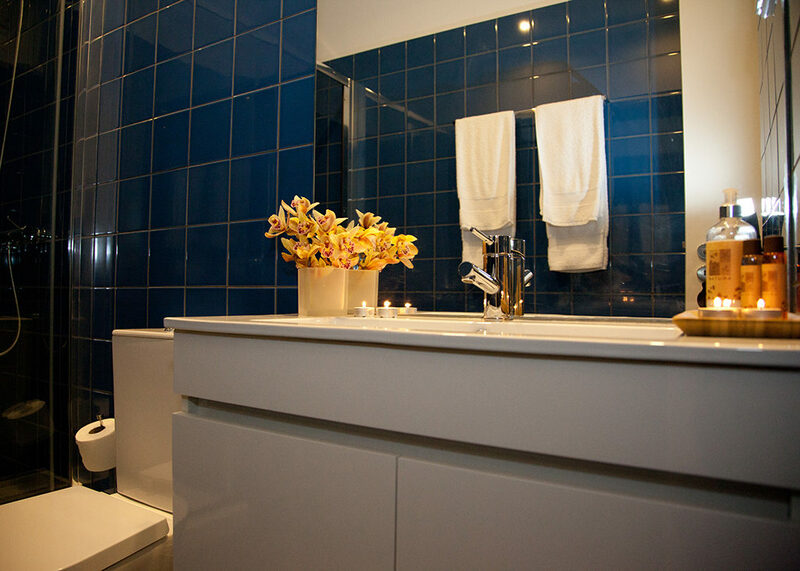 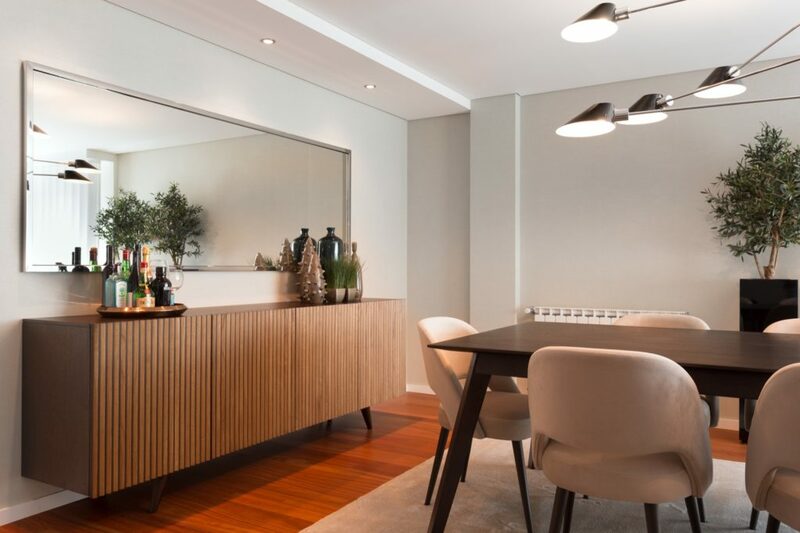 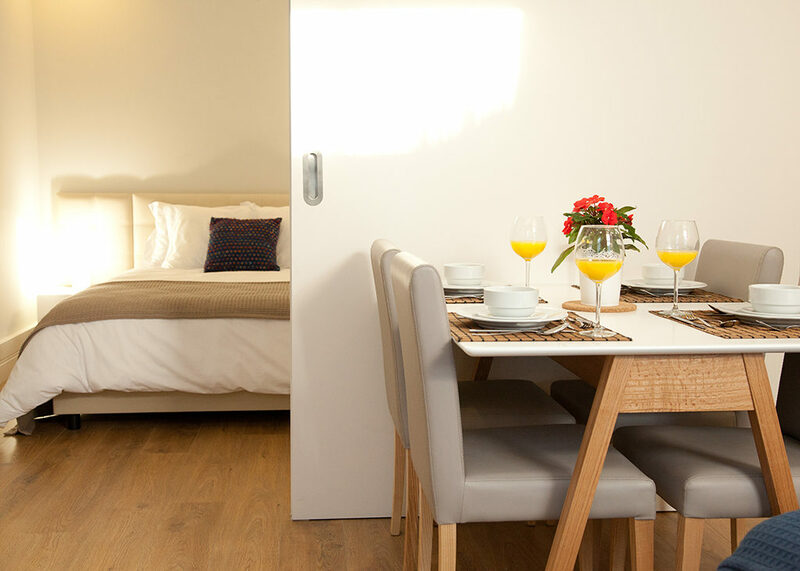 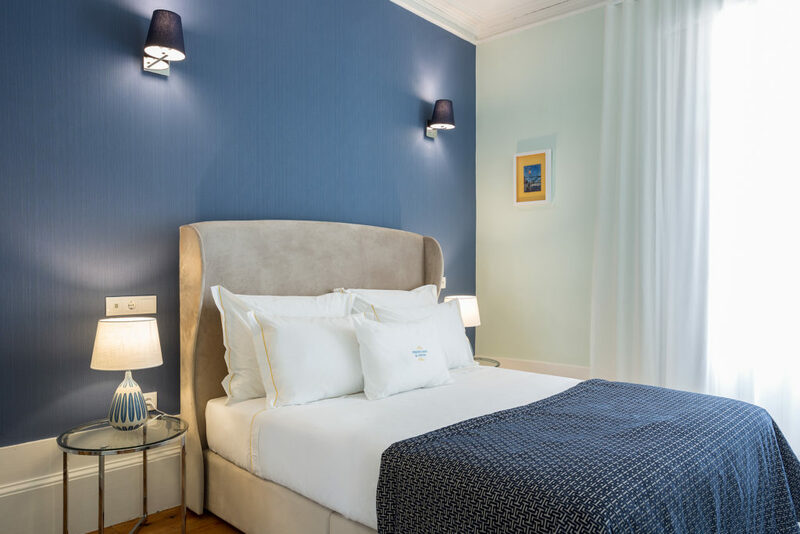 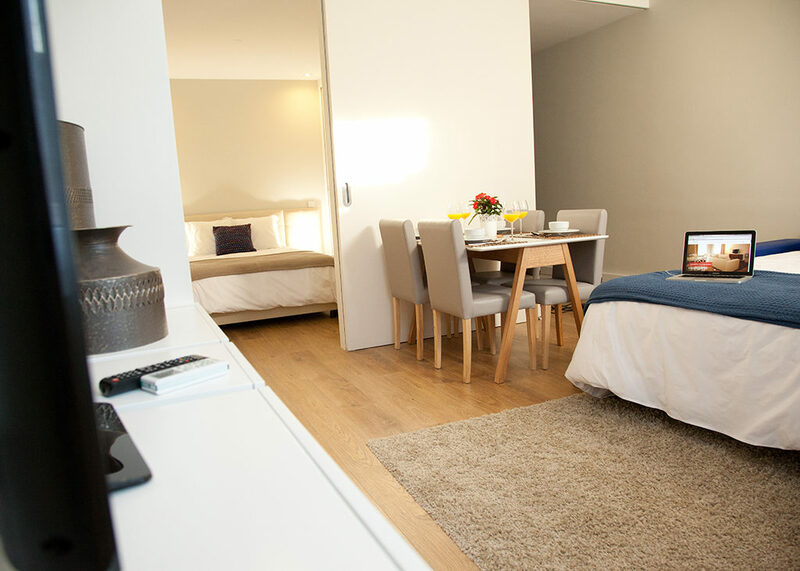 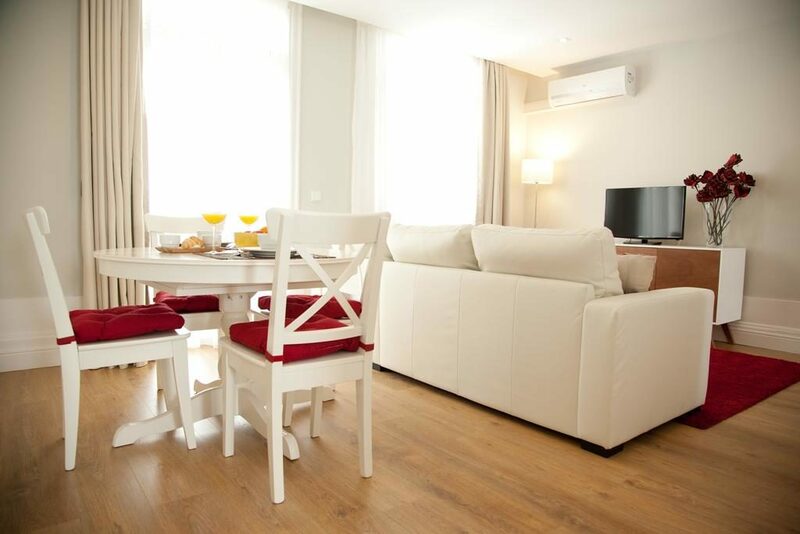 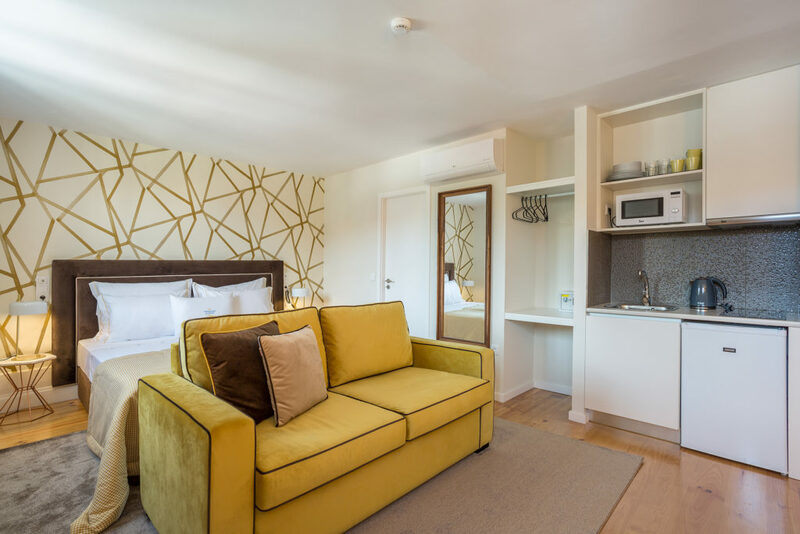 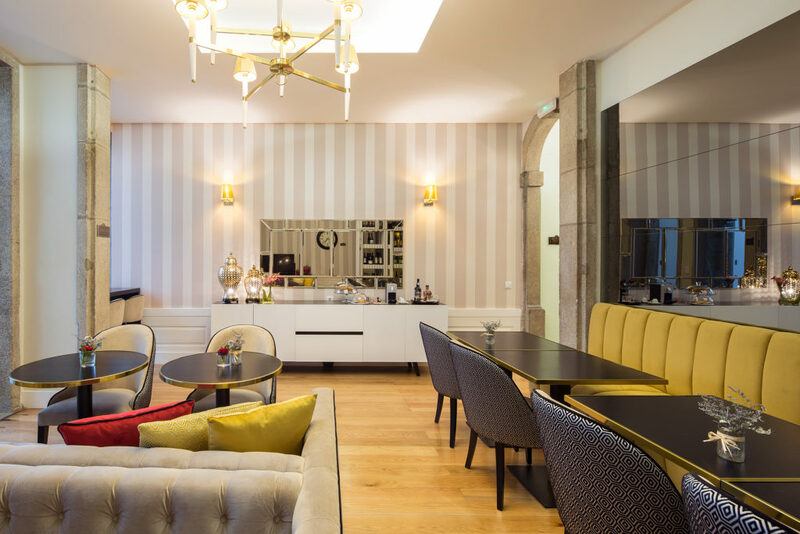 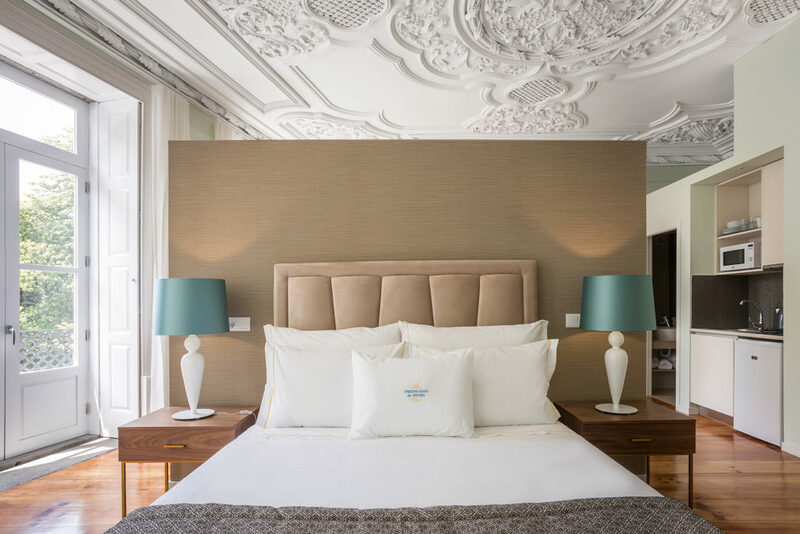 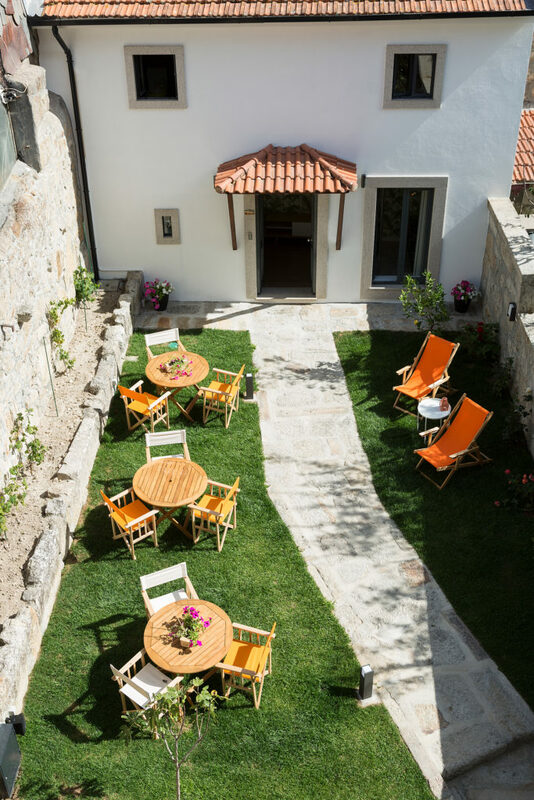 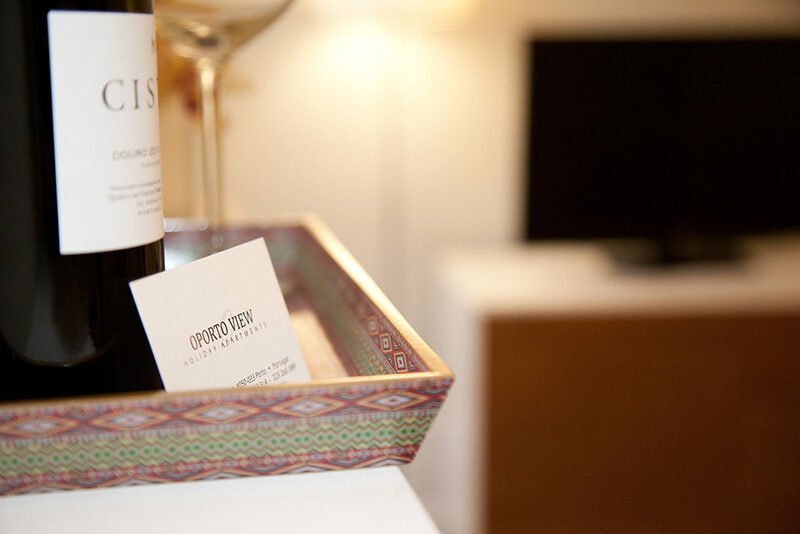 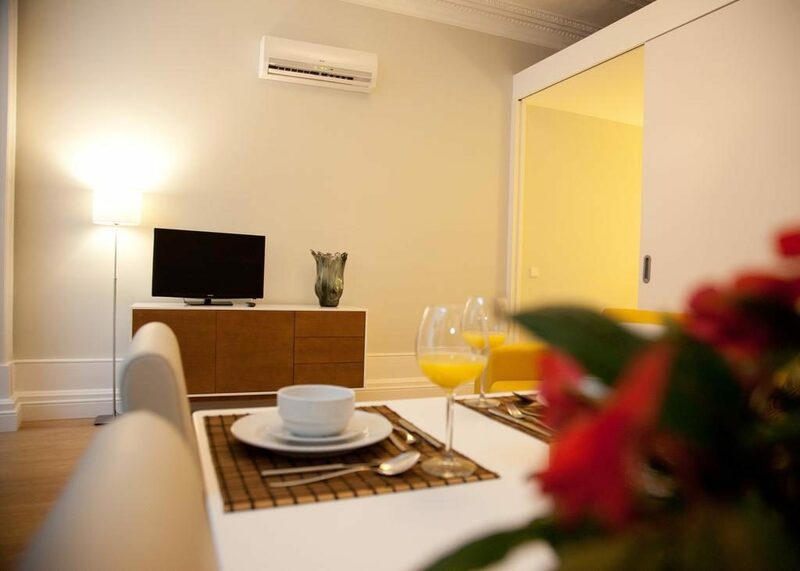 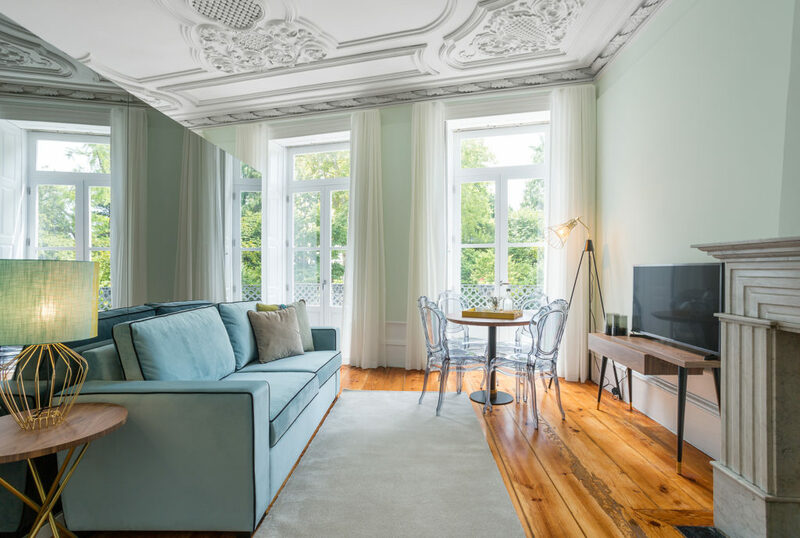 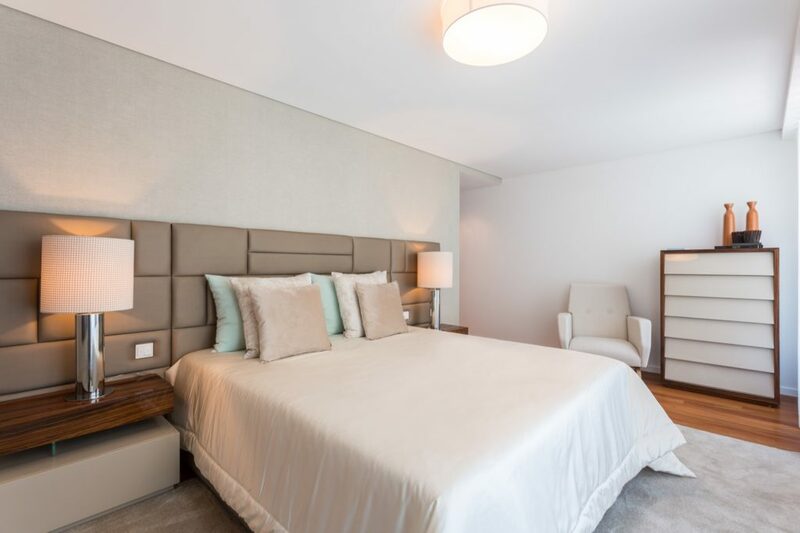 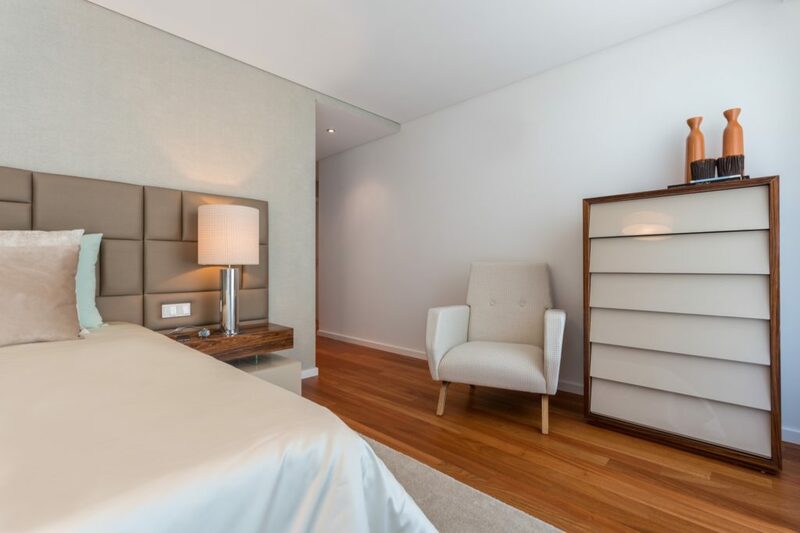 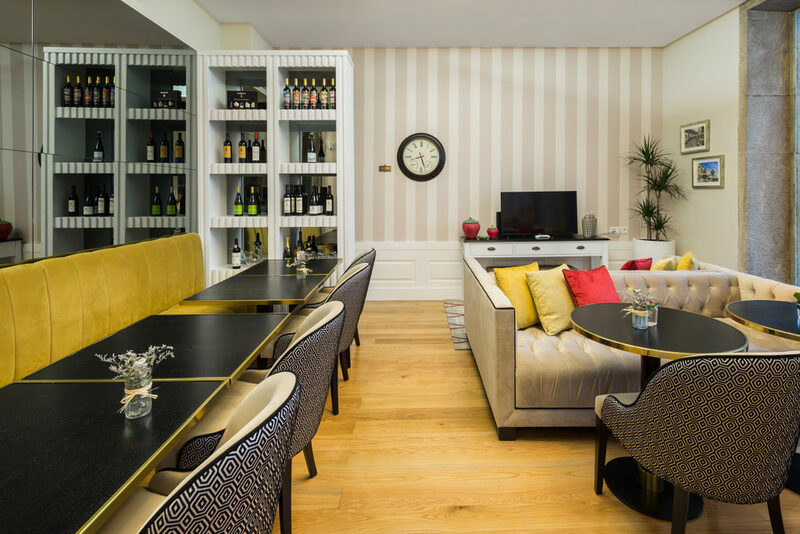 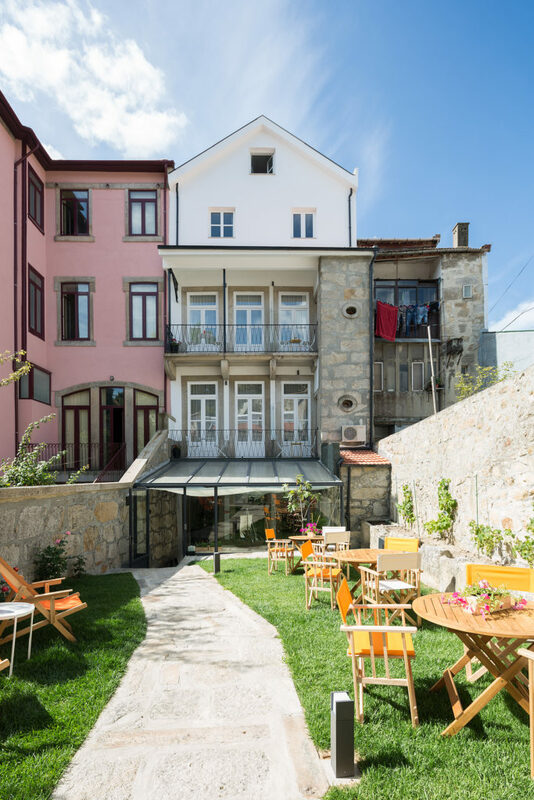 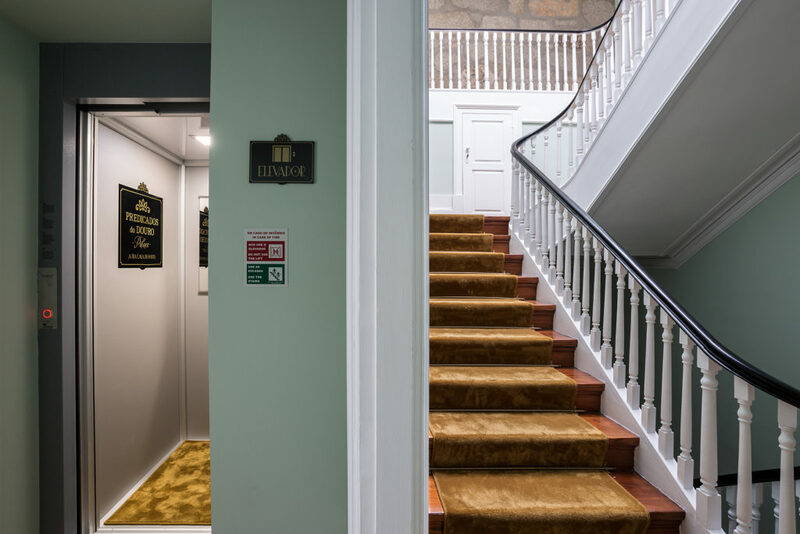 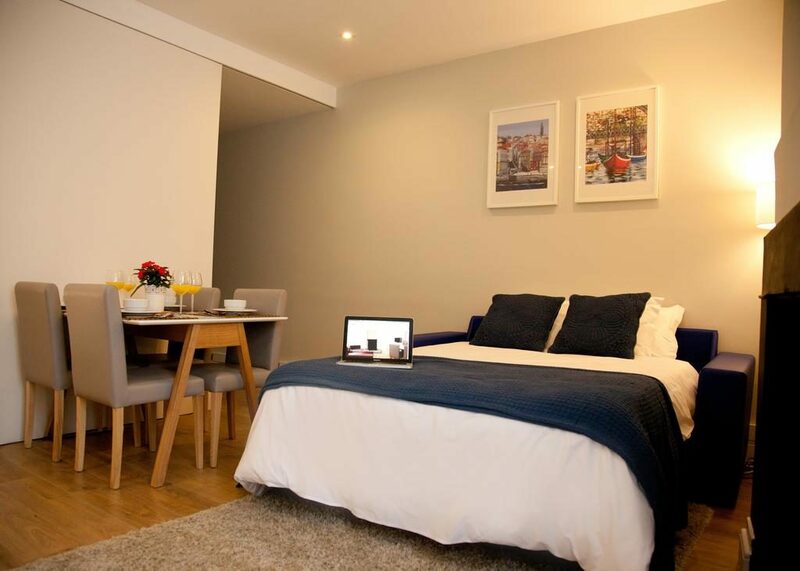 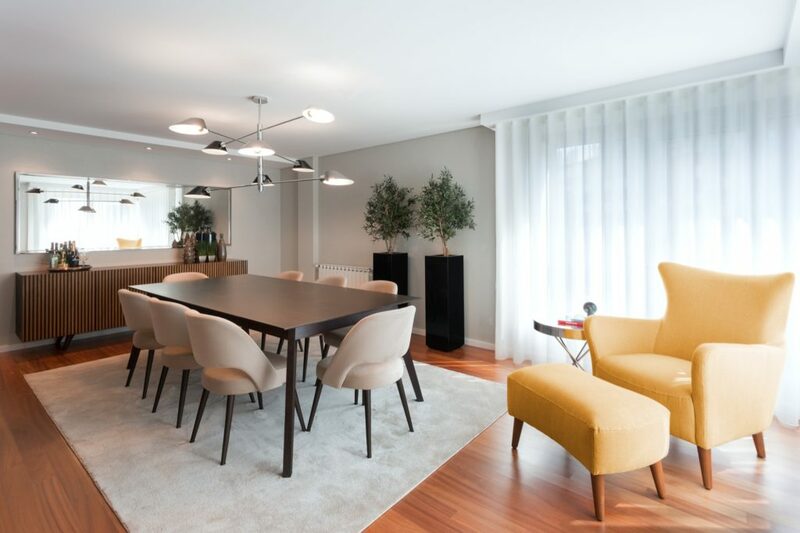 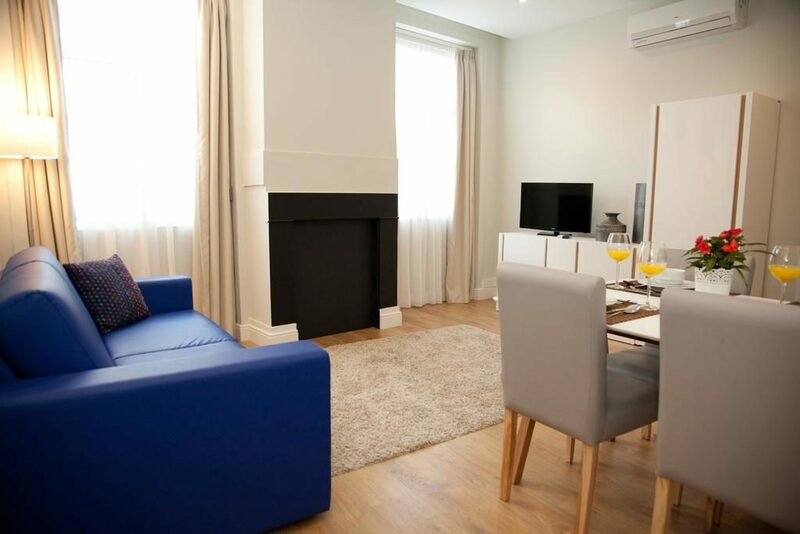 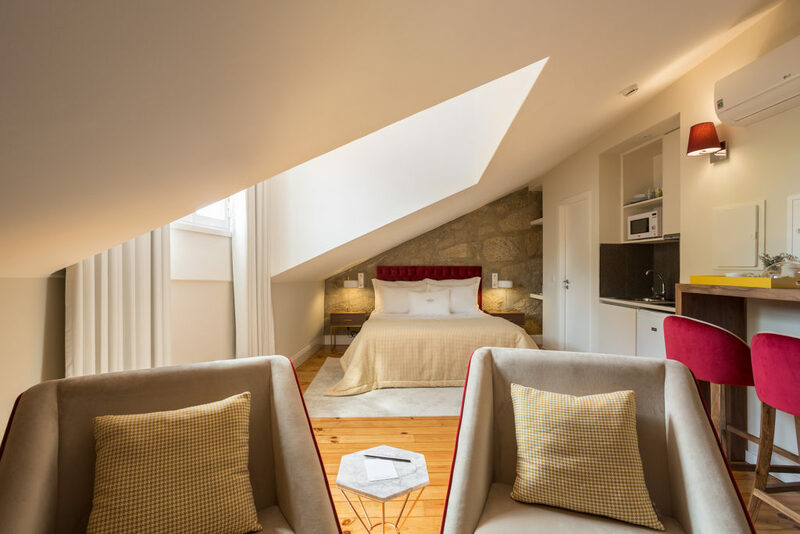 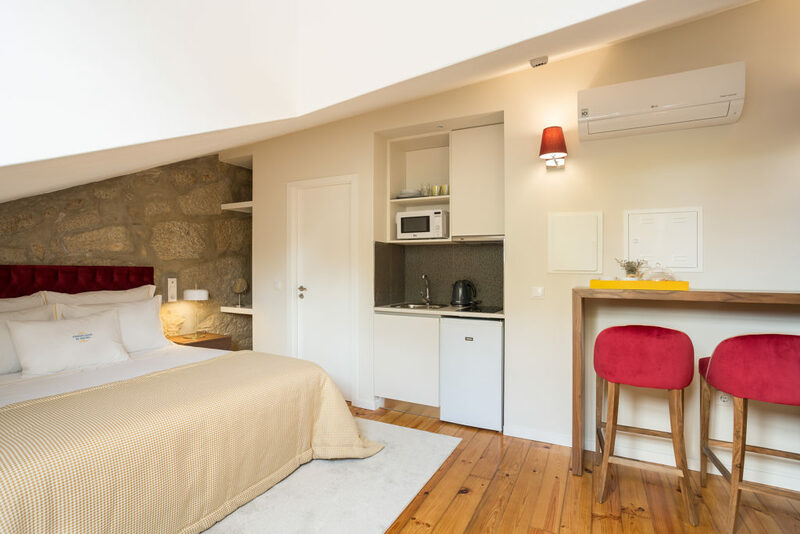 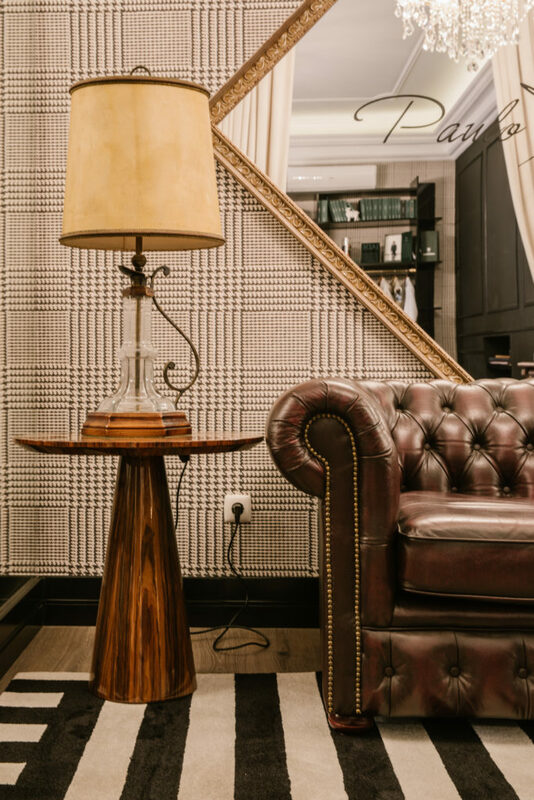 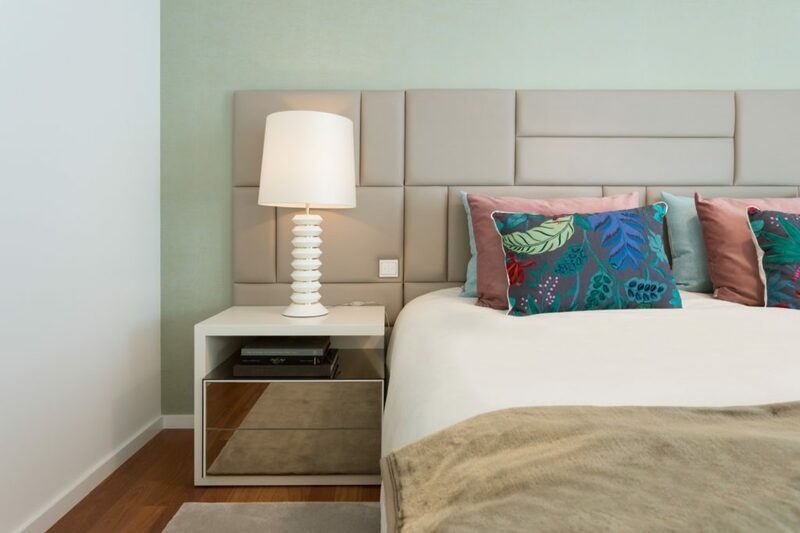 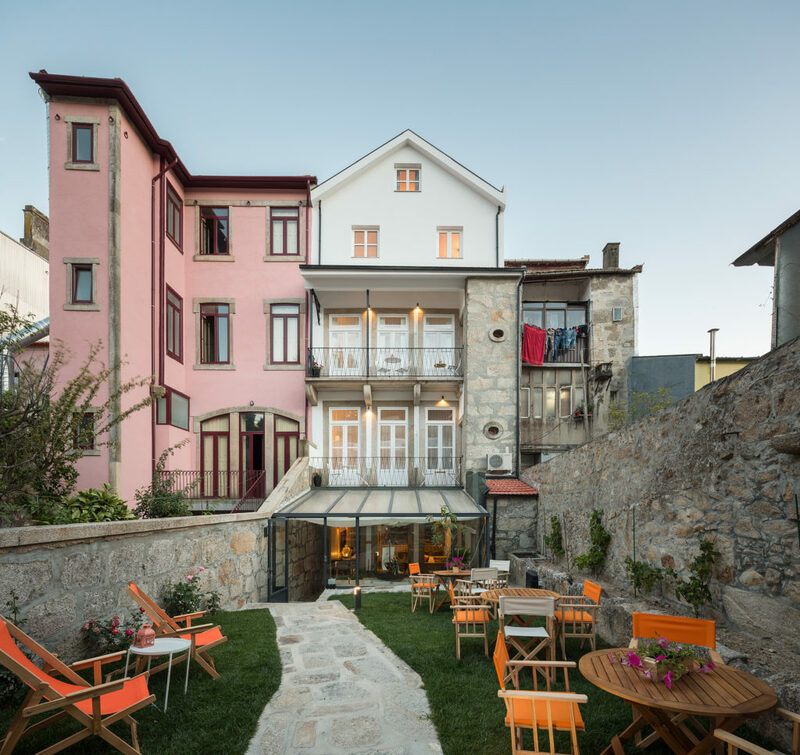 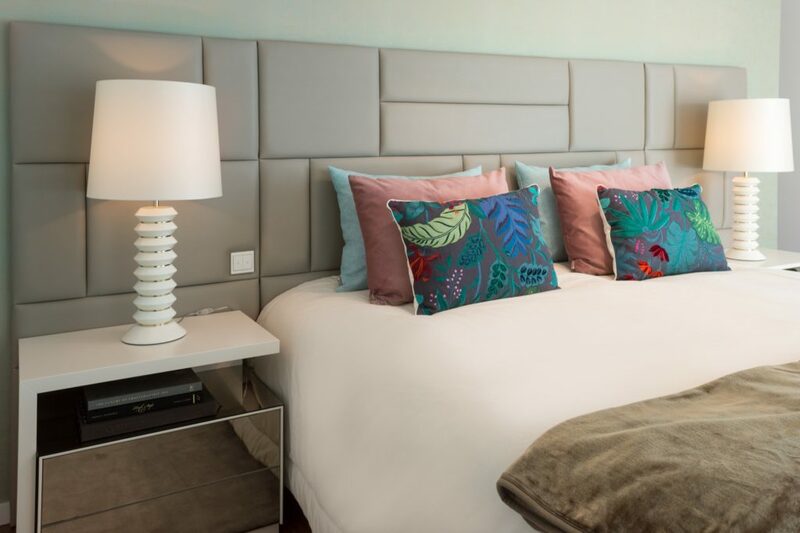 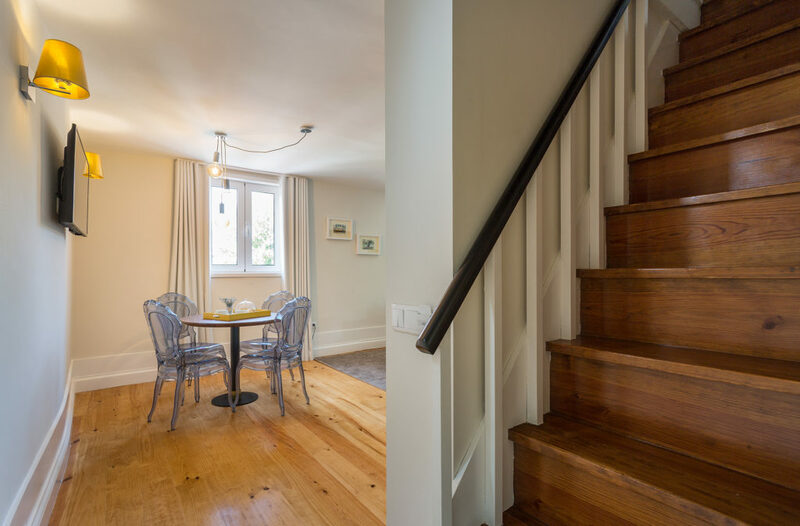 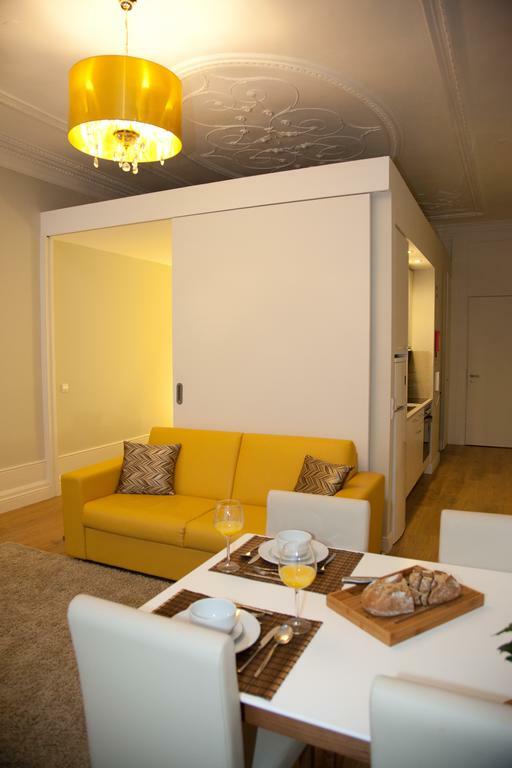 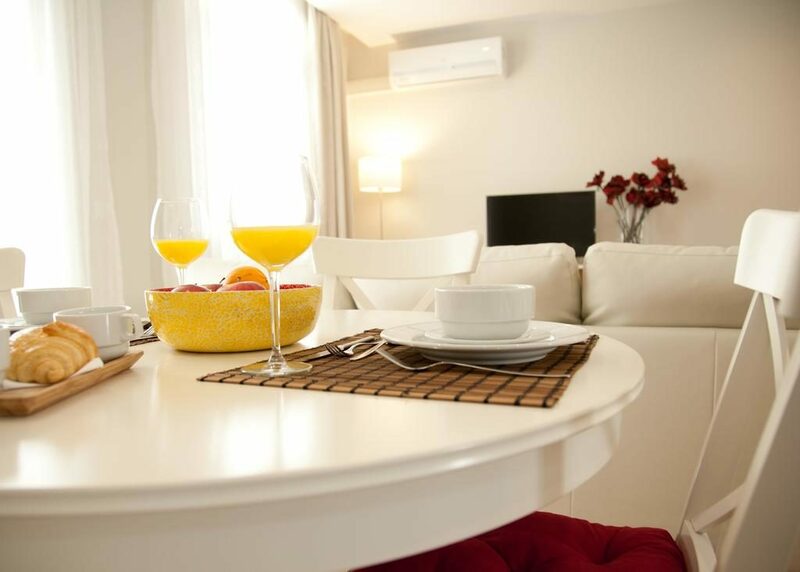 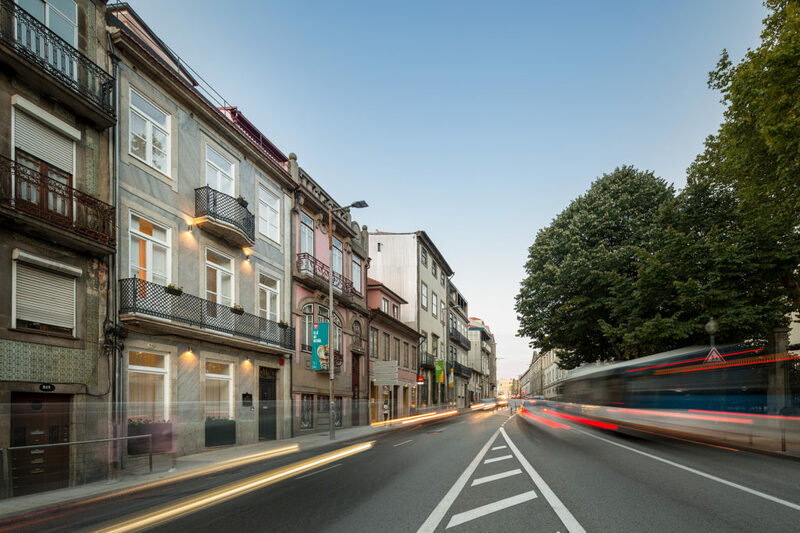 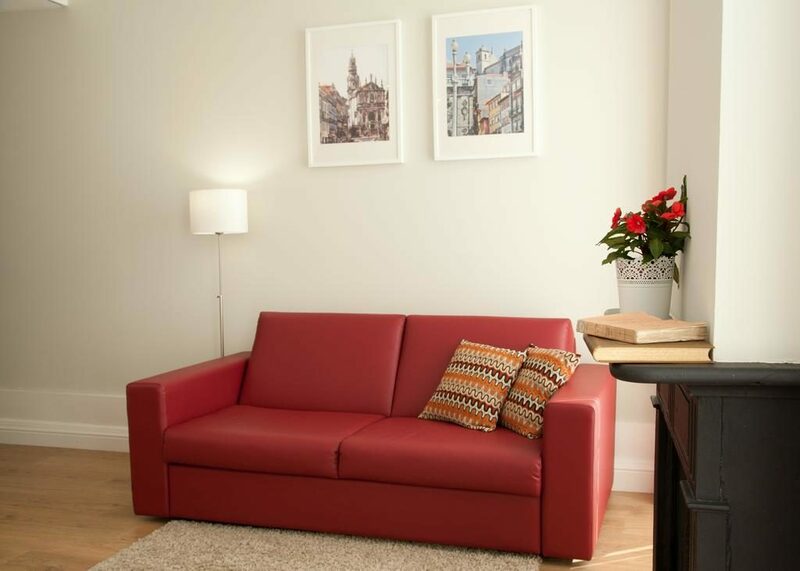 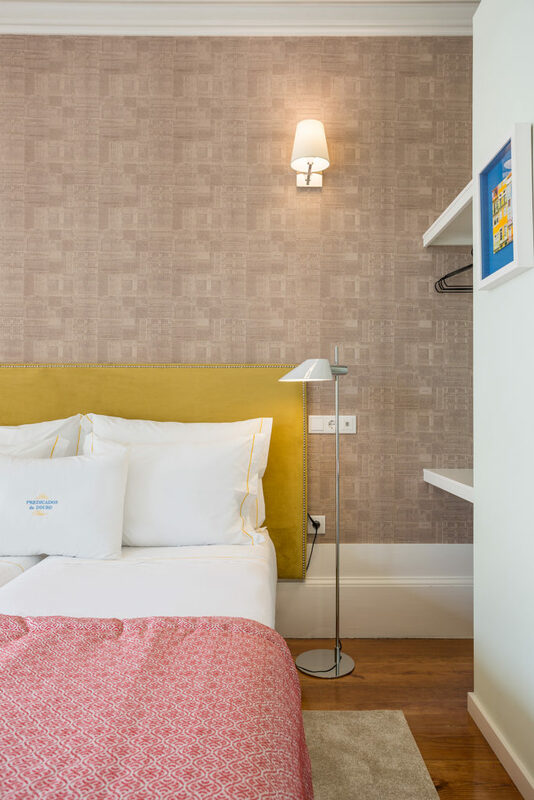 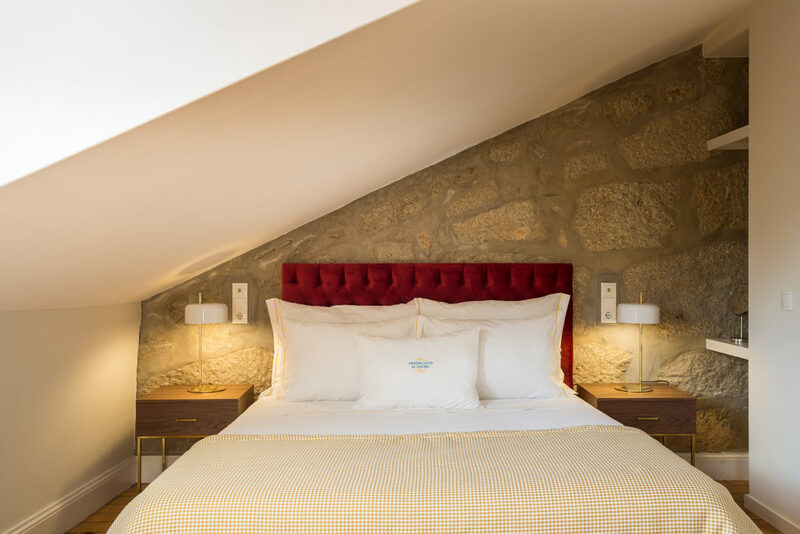 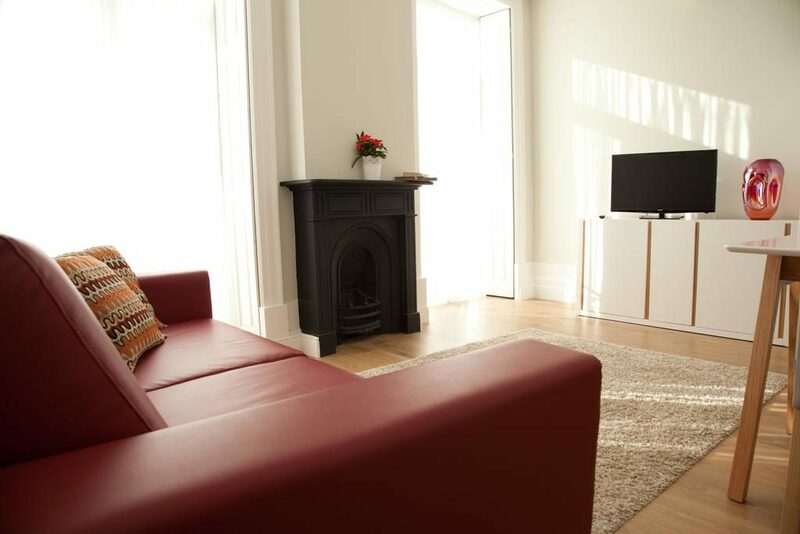 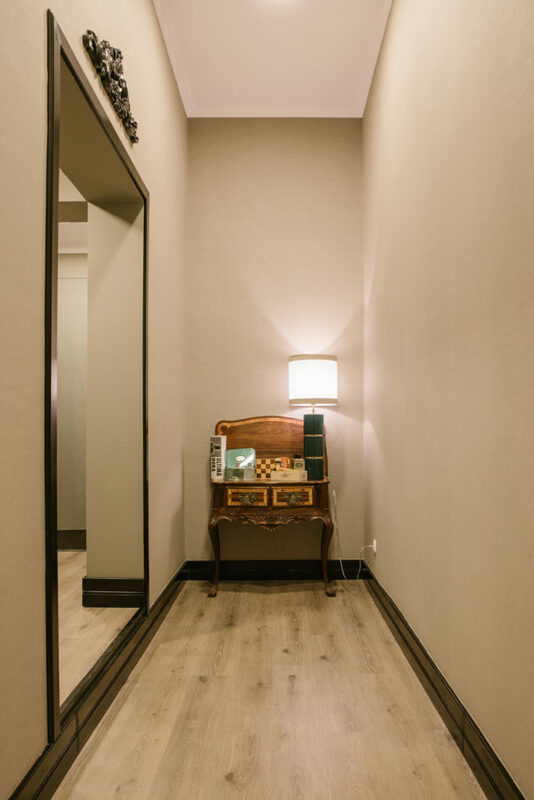 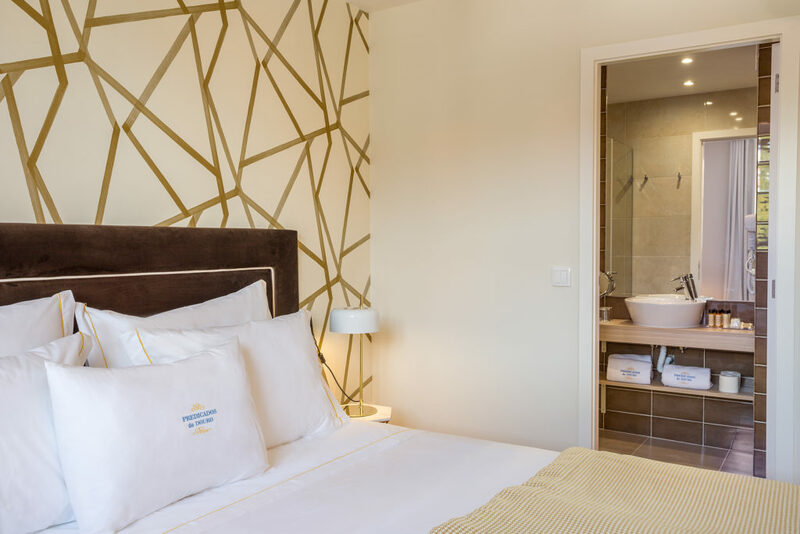 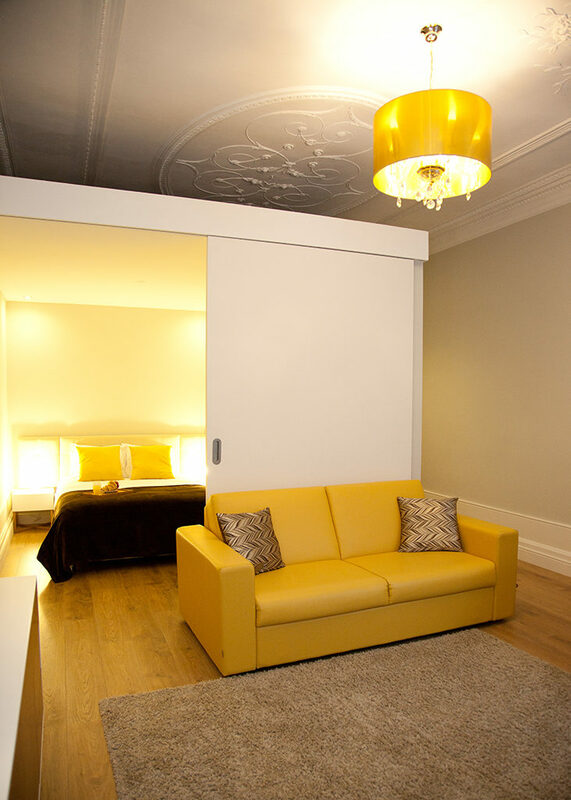 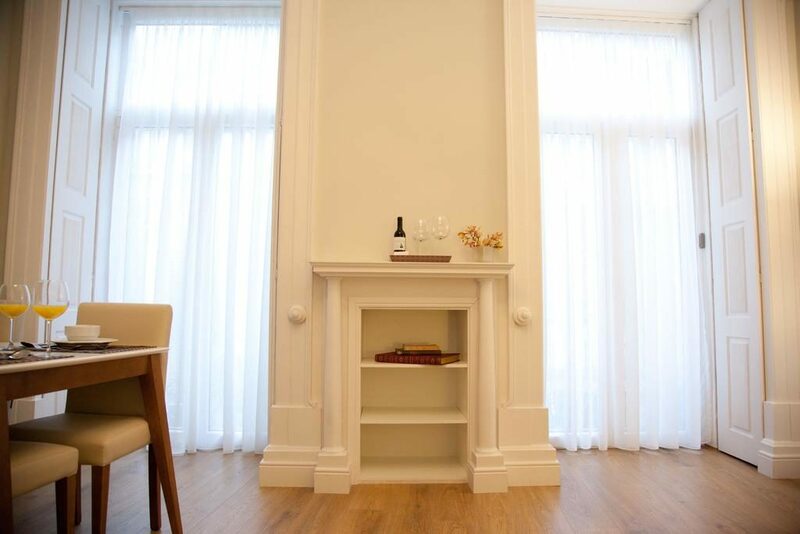 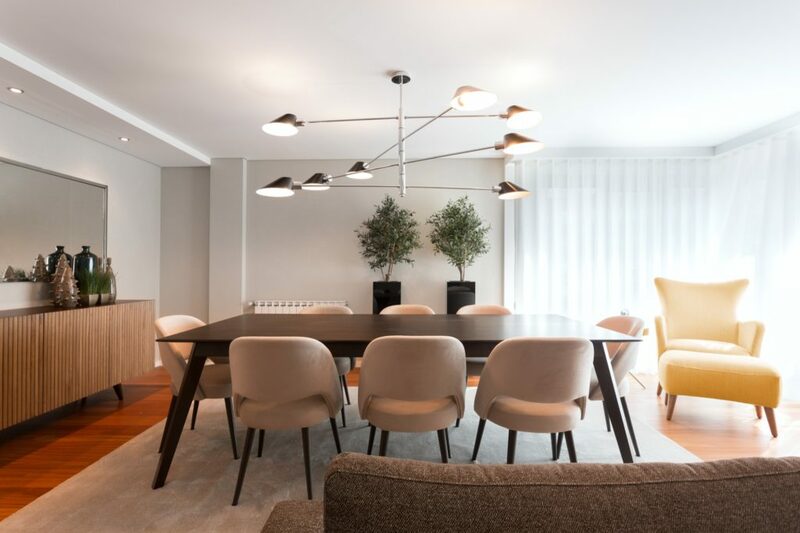 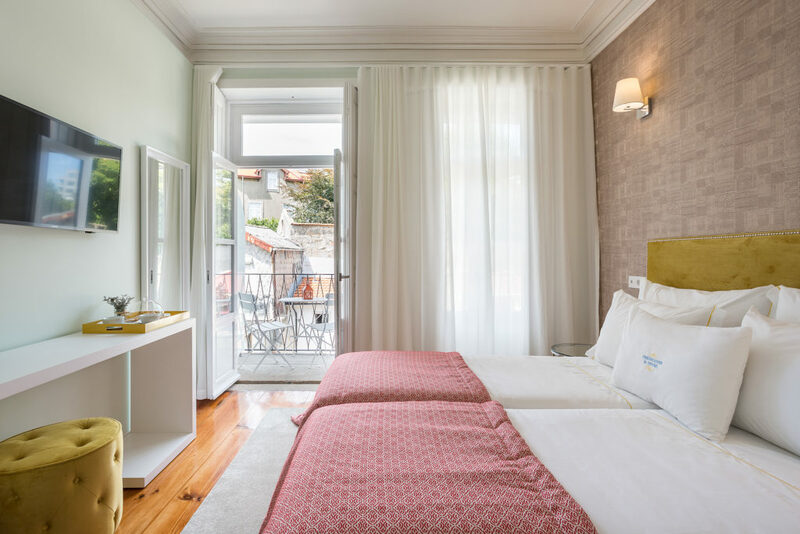 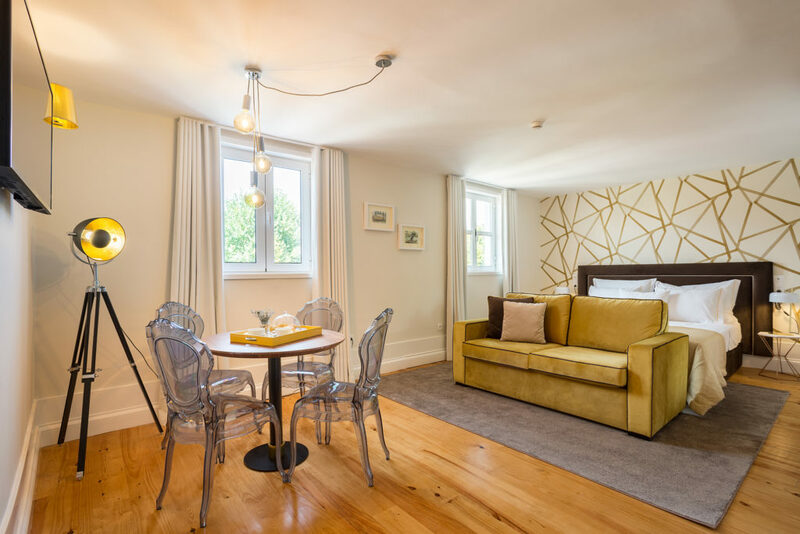 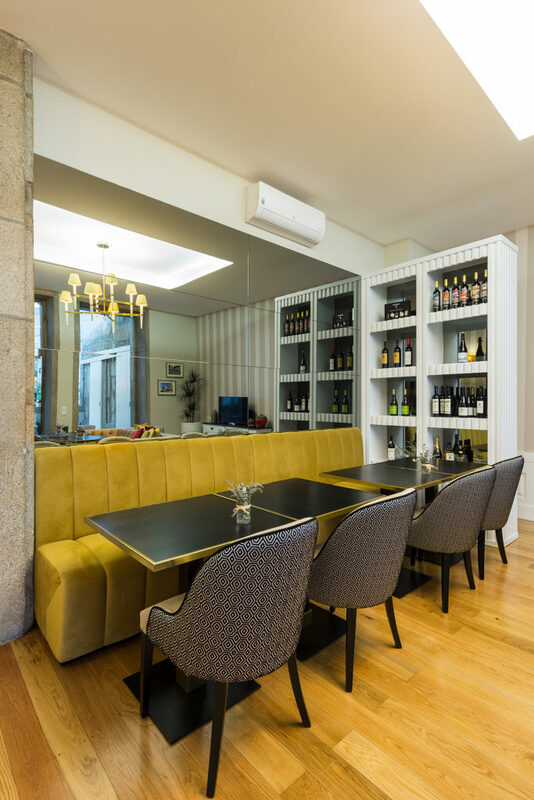 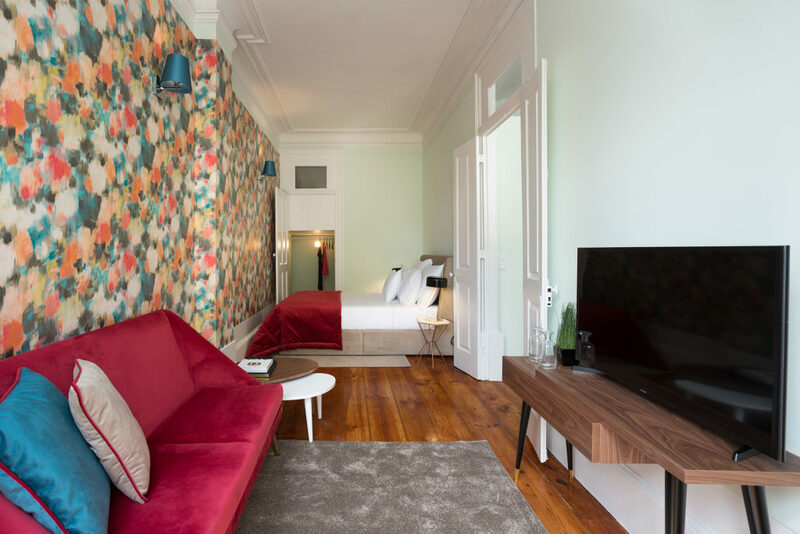 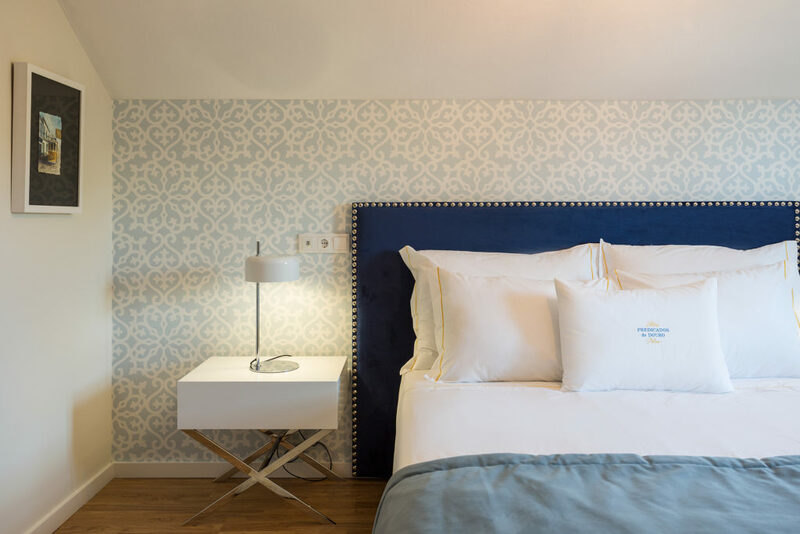 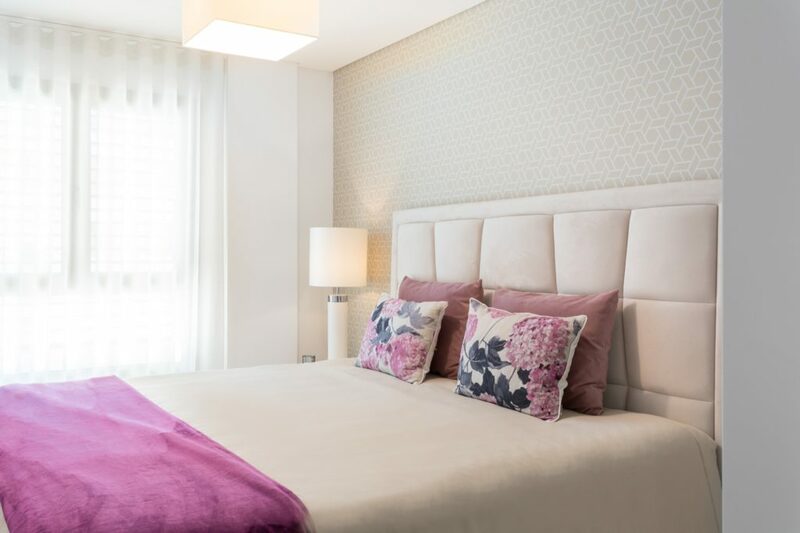 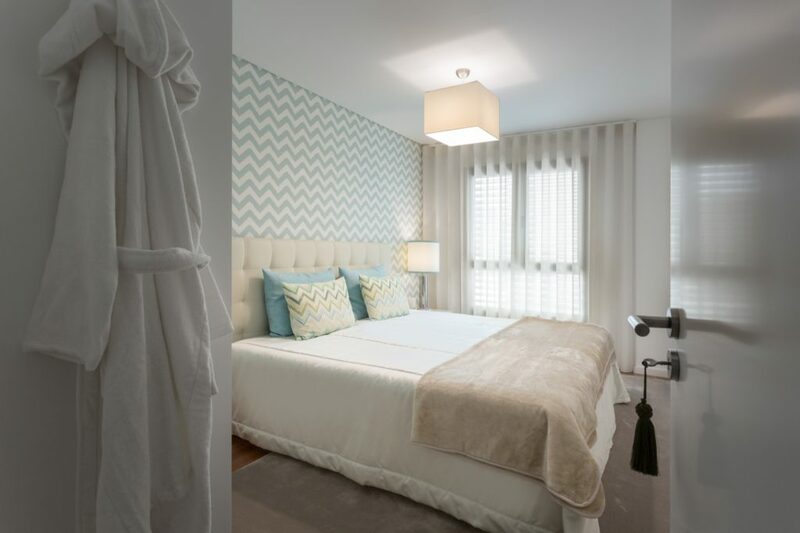 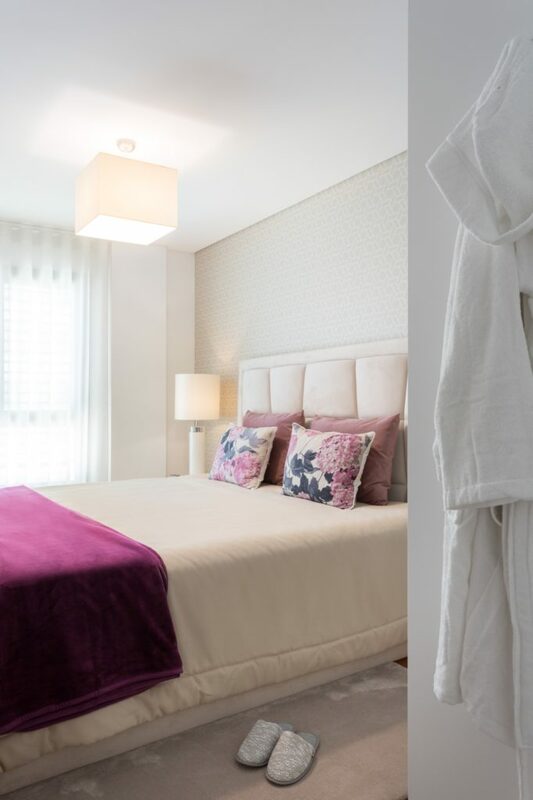 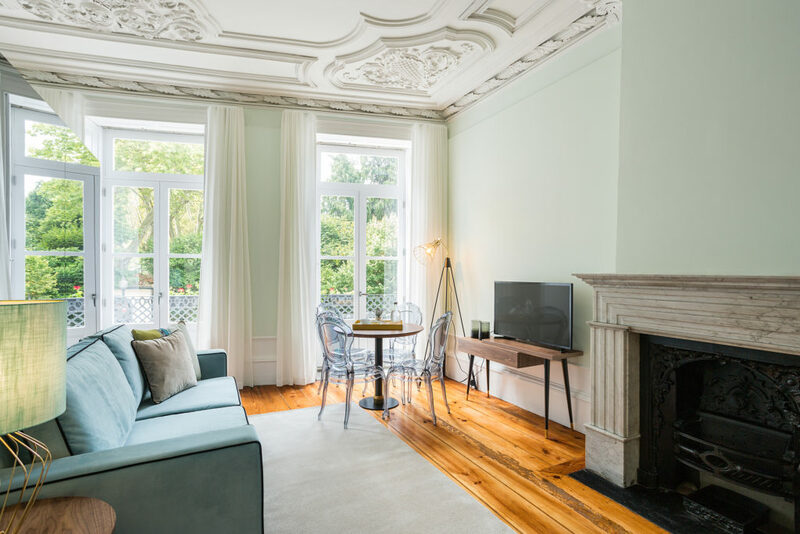 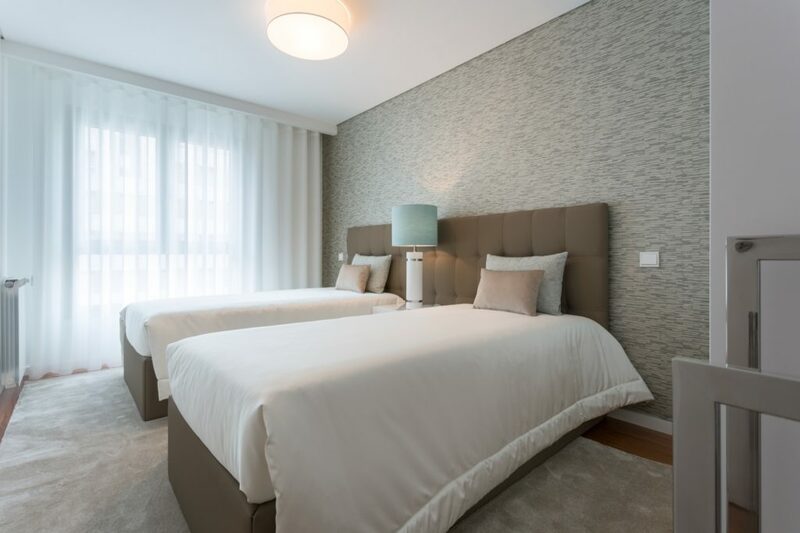 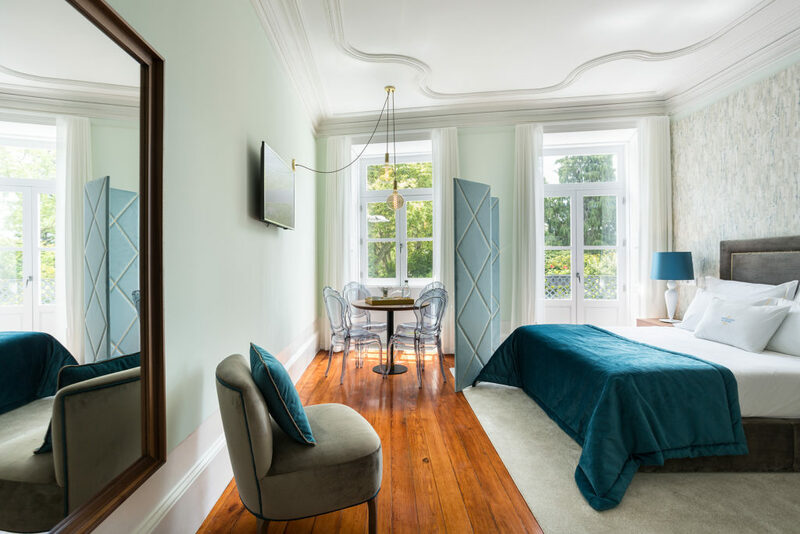 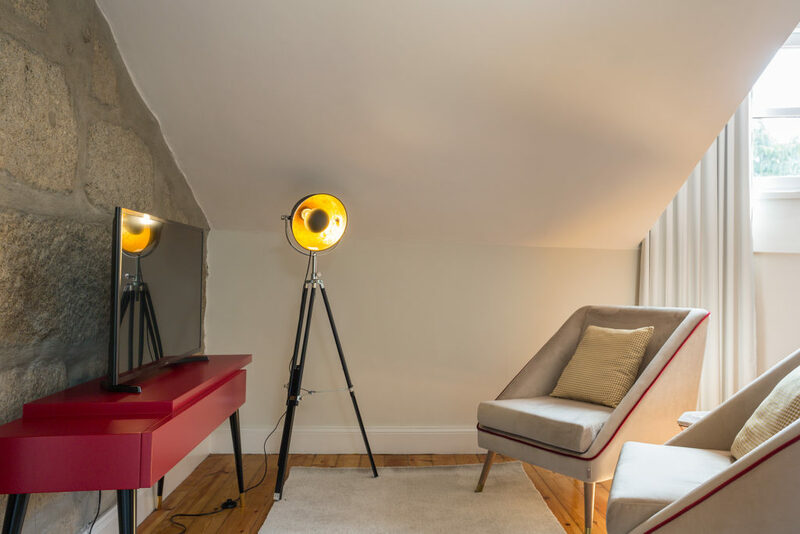 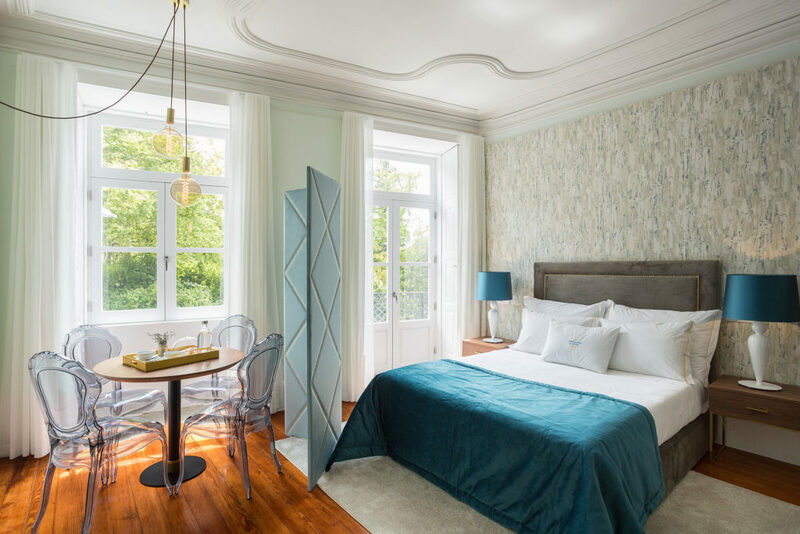 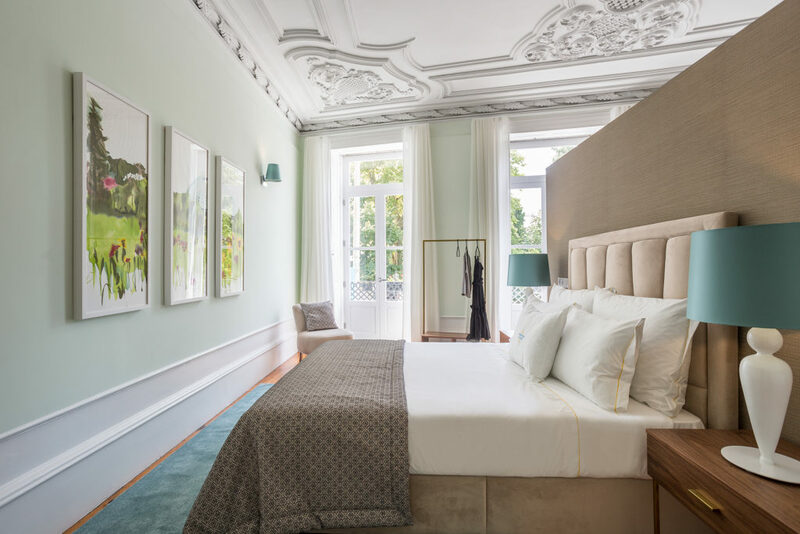 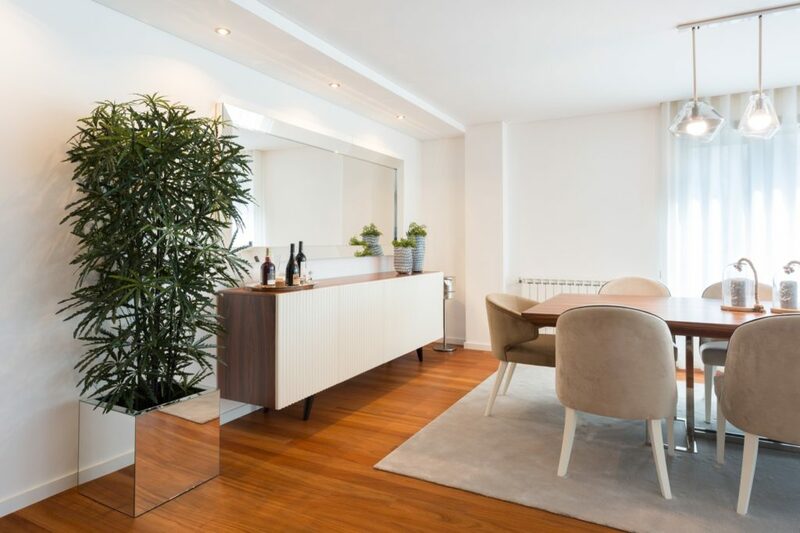 This hotel has eight apartments for the accommodation, with a fully equipped space for maximum comfort and you can have an intimate and unique stay in the city of Porto. 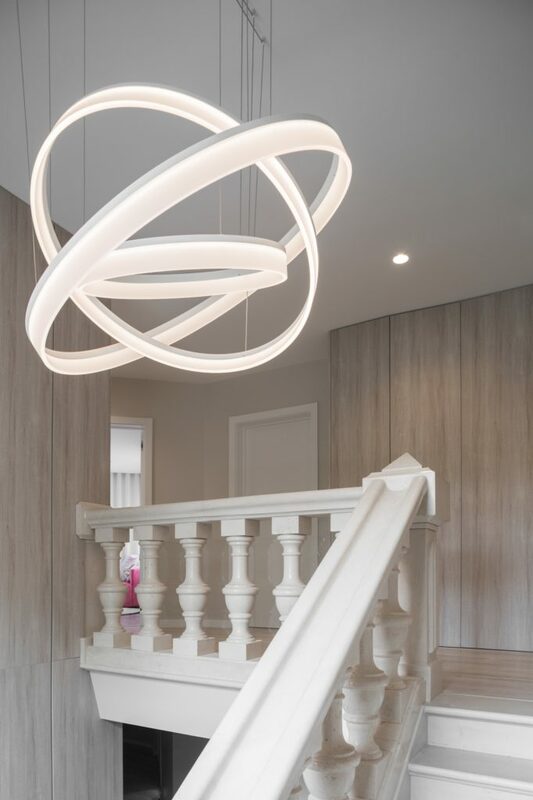 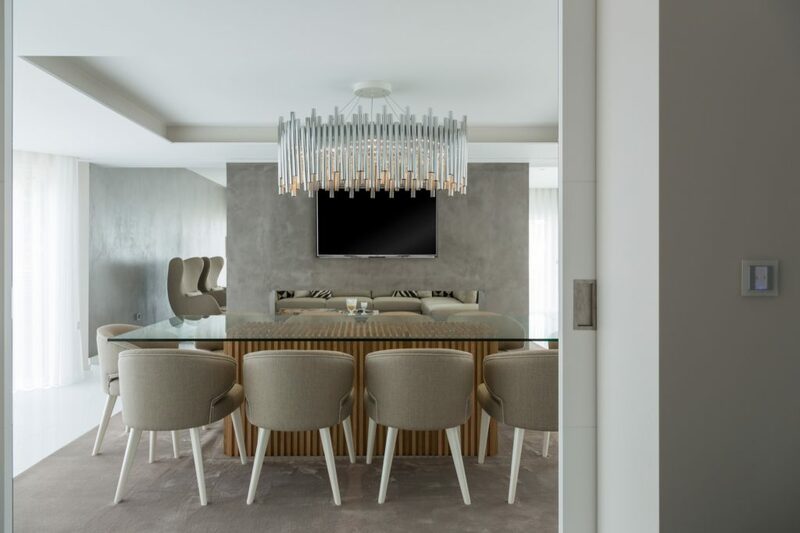 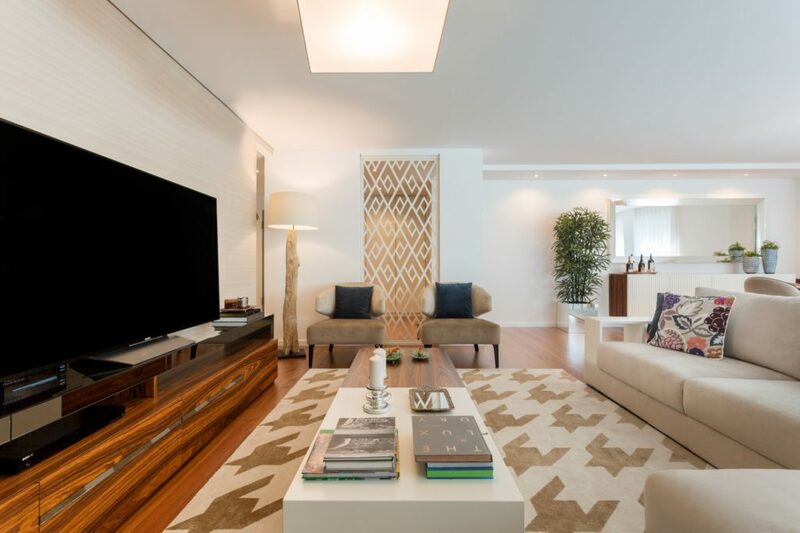 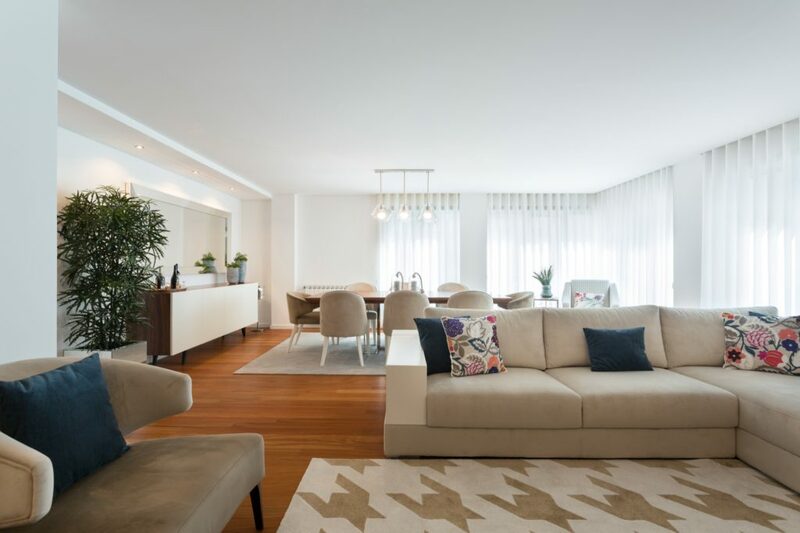 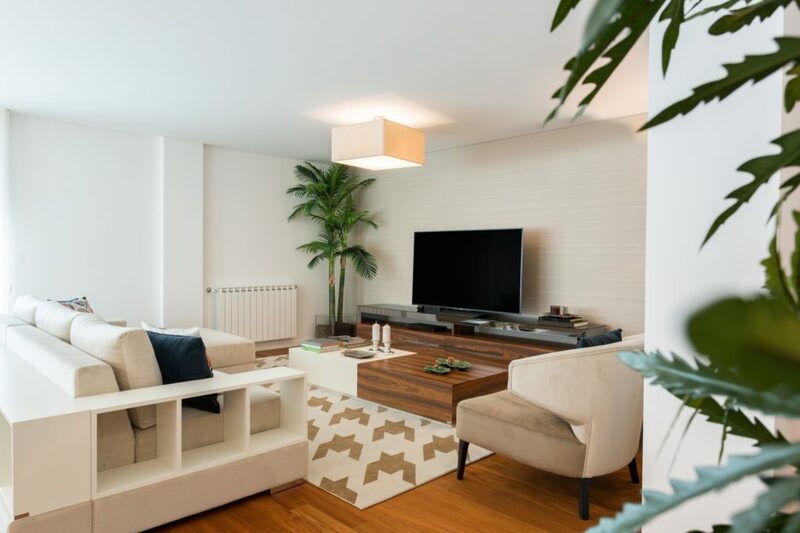 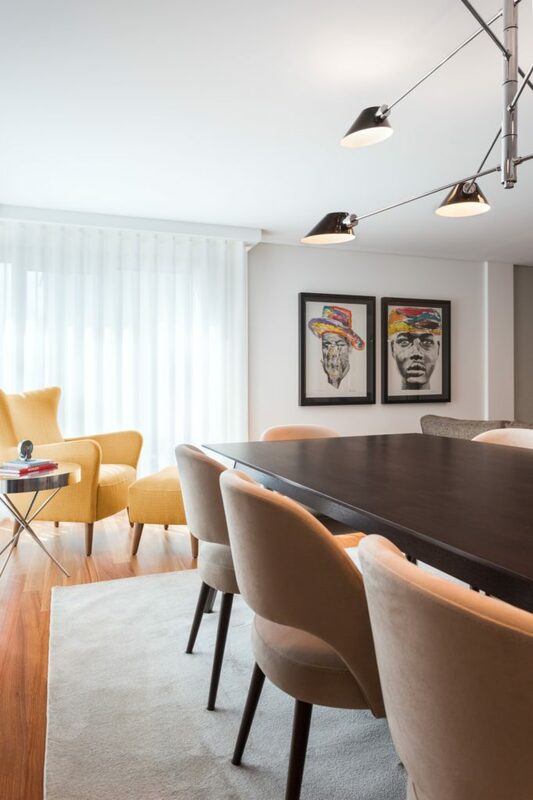 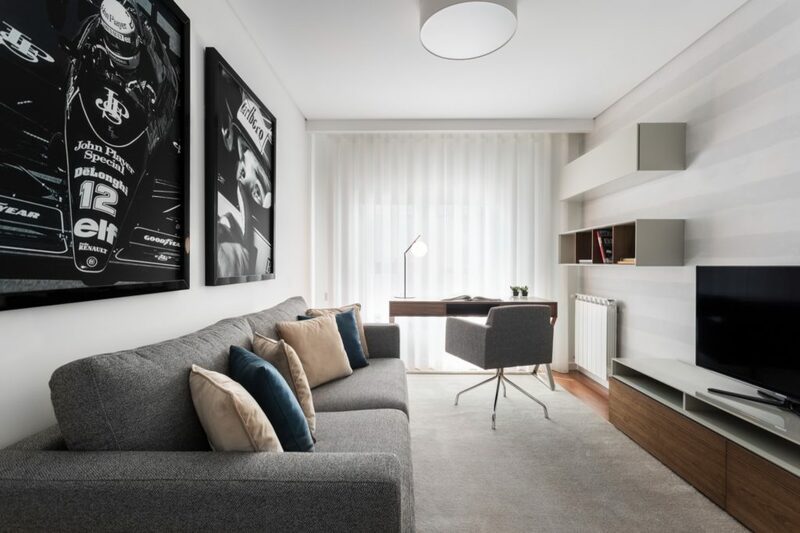 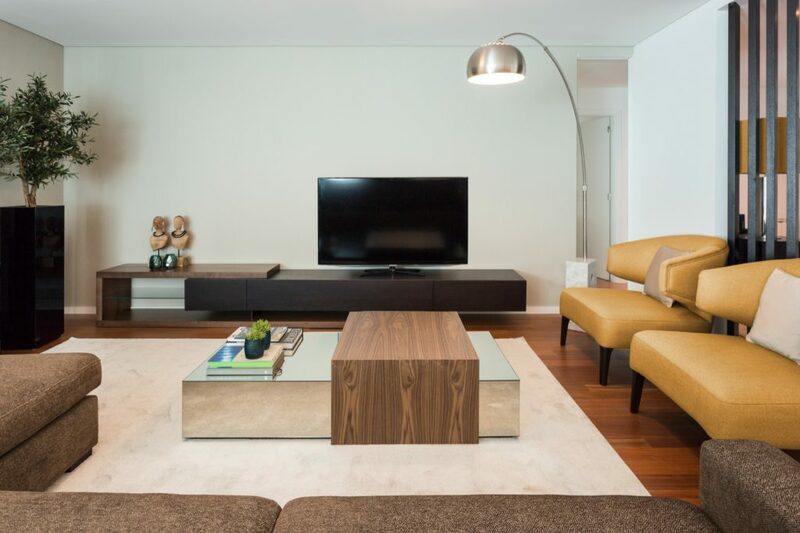 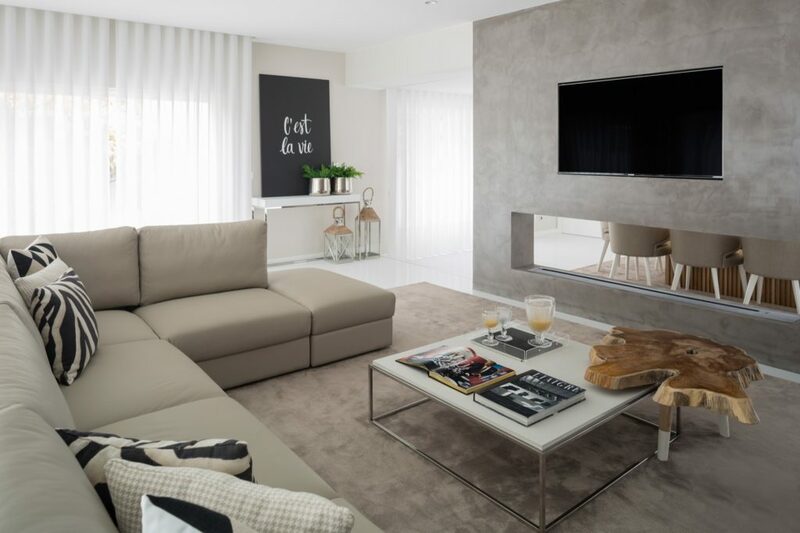 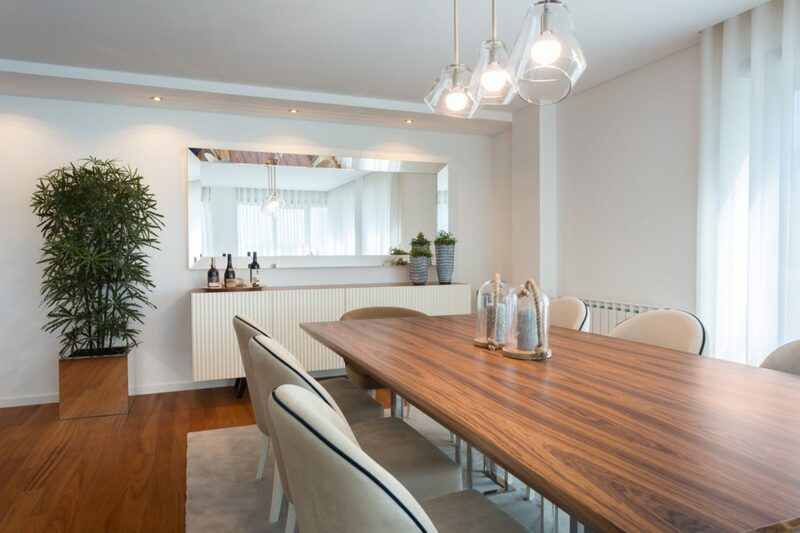 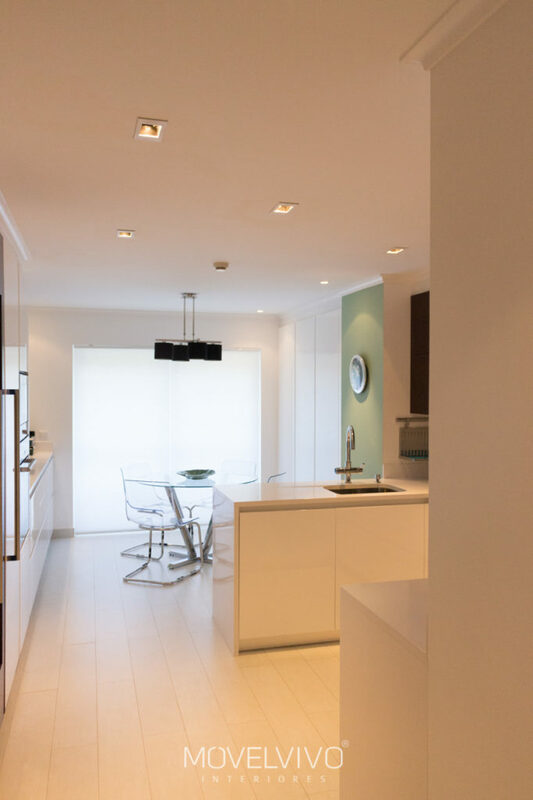 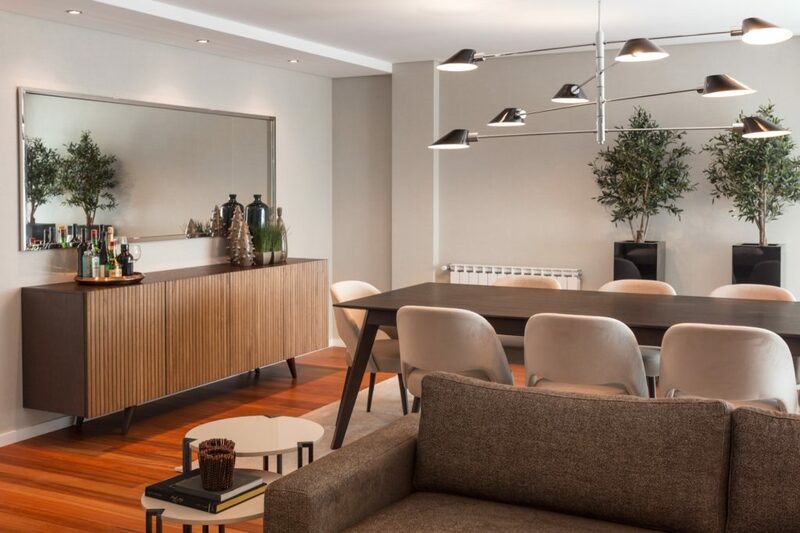 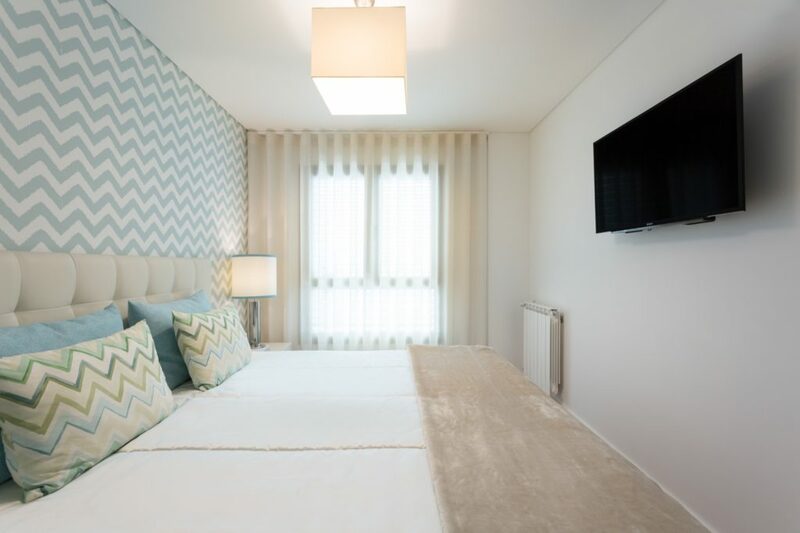 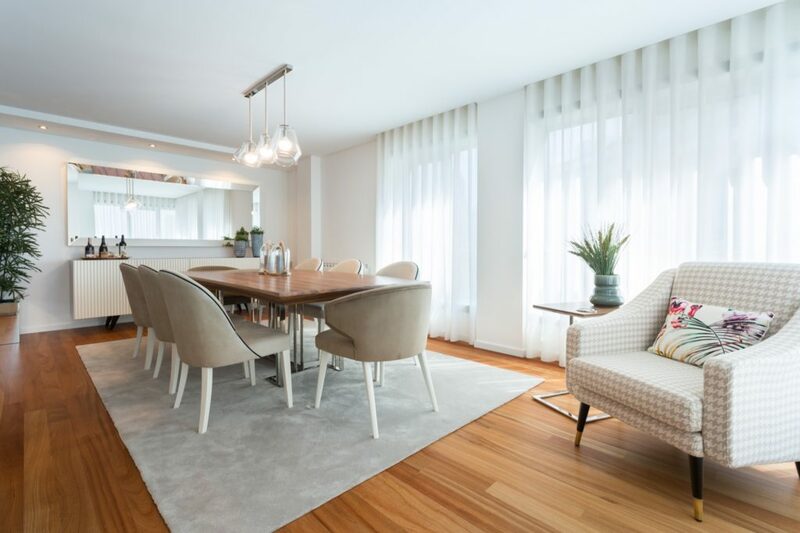 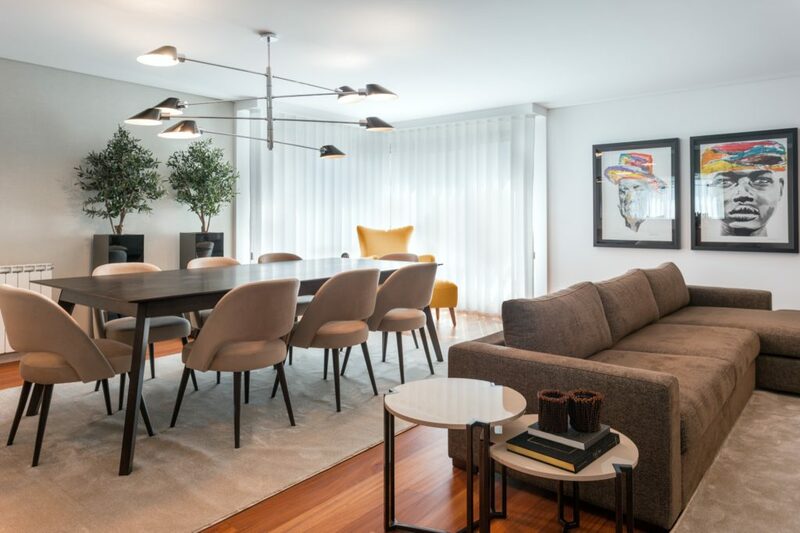 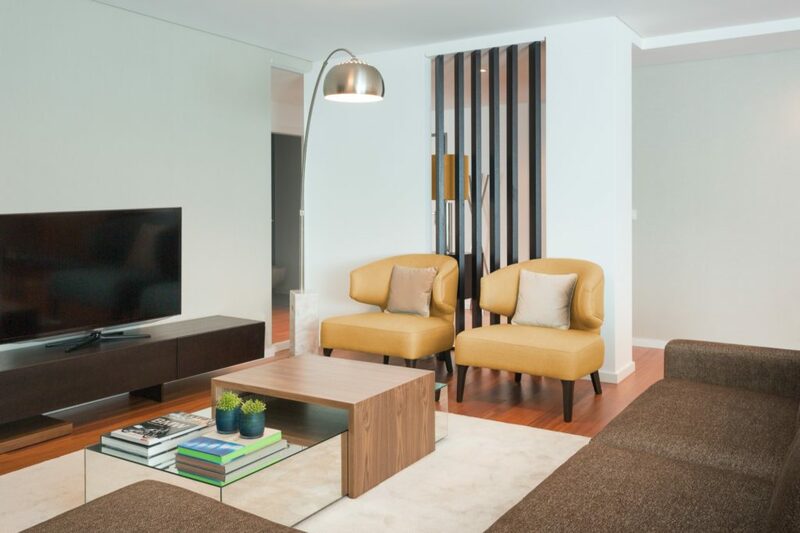 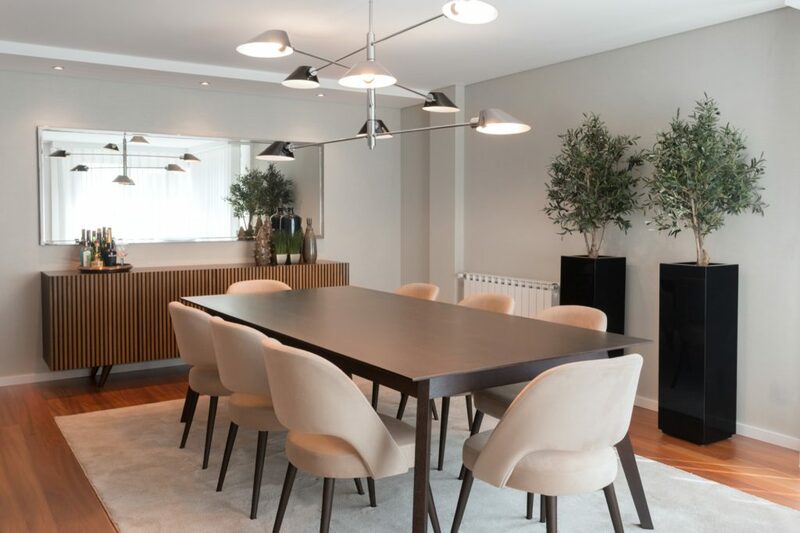 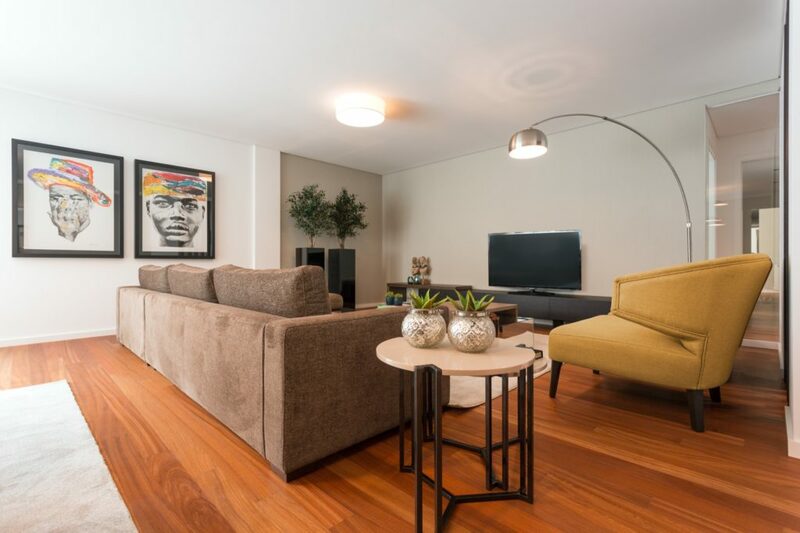 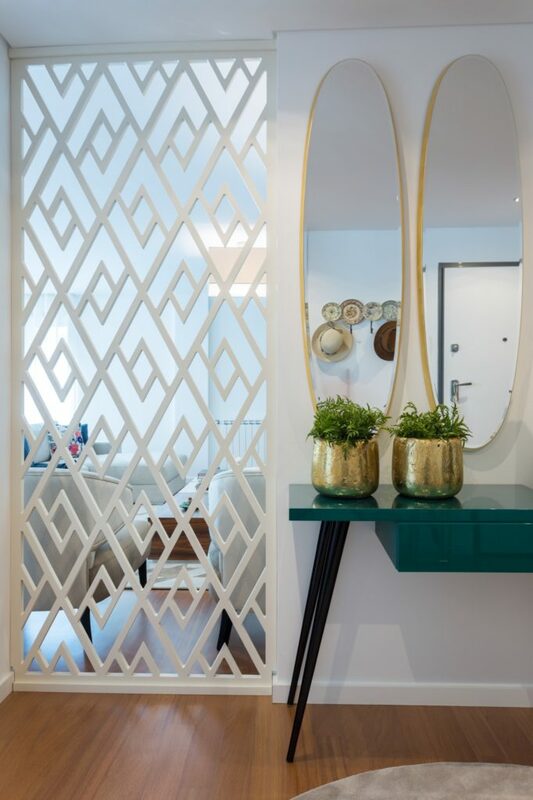 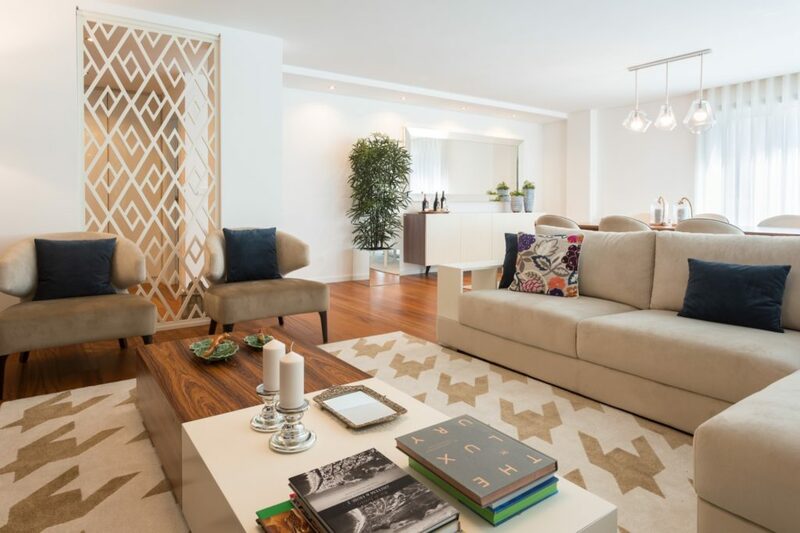 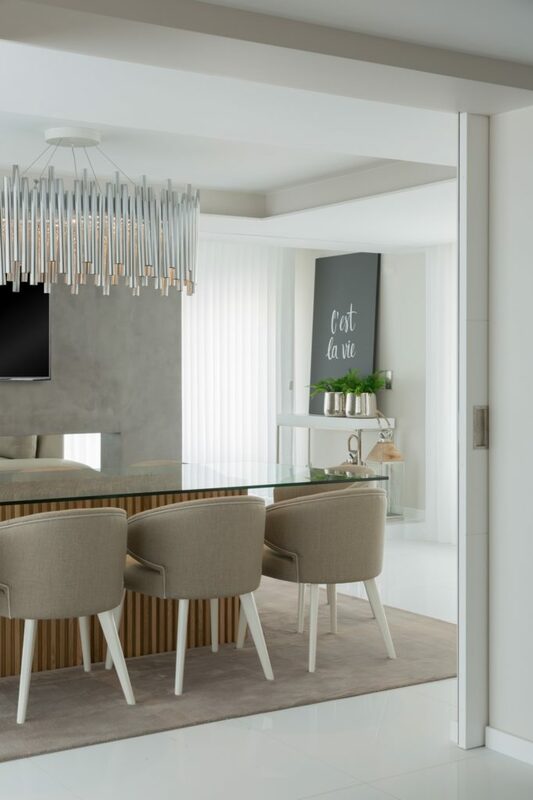 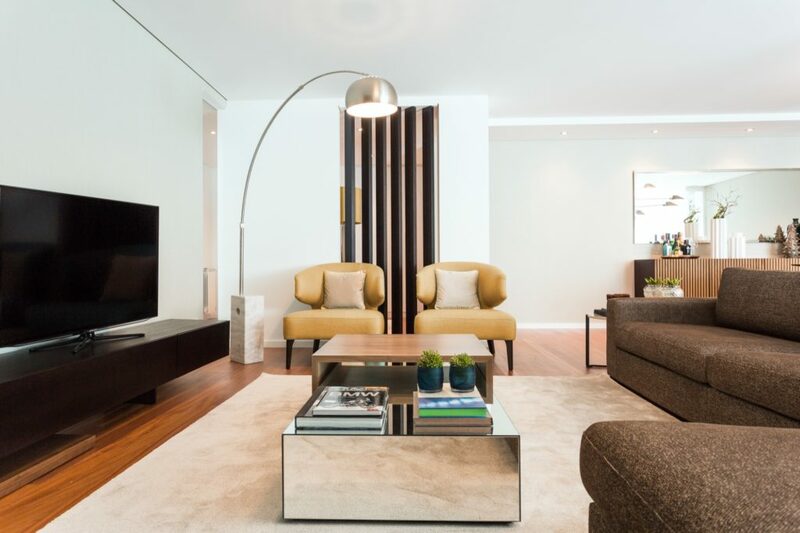 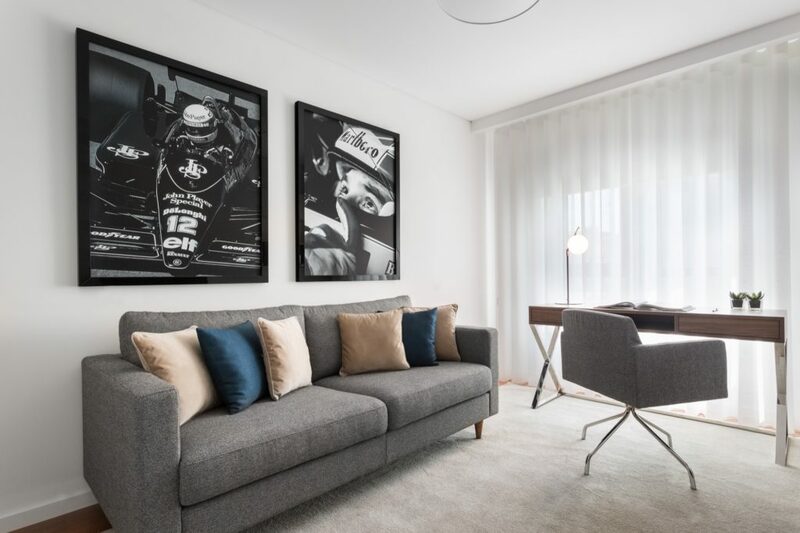 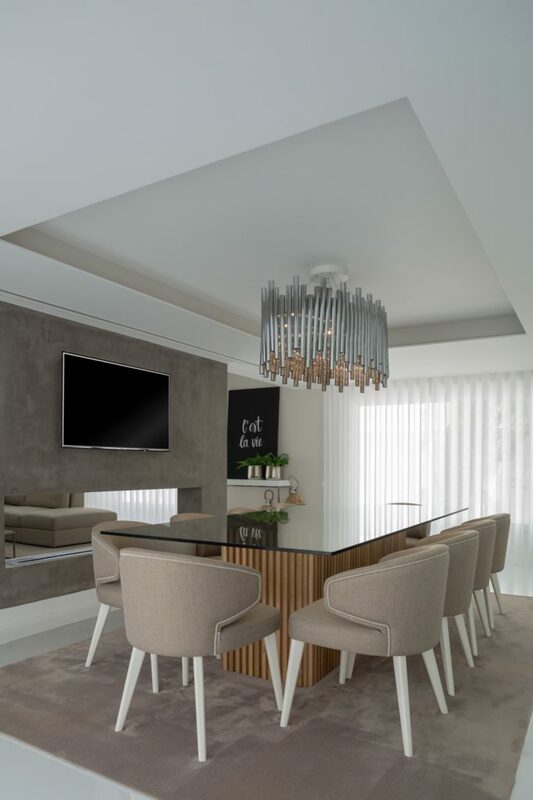 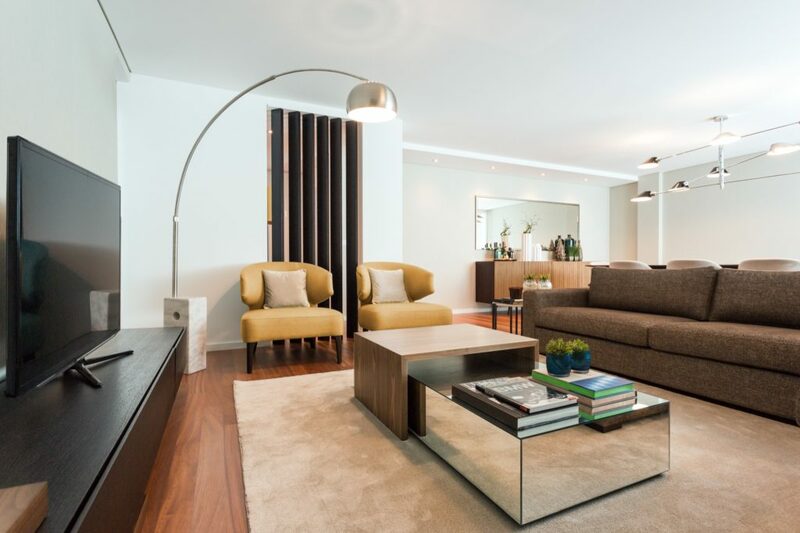 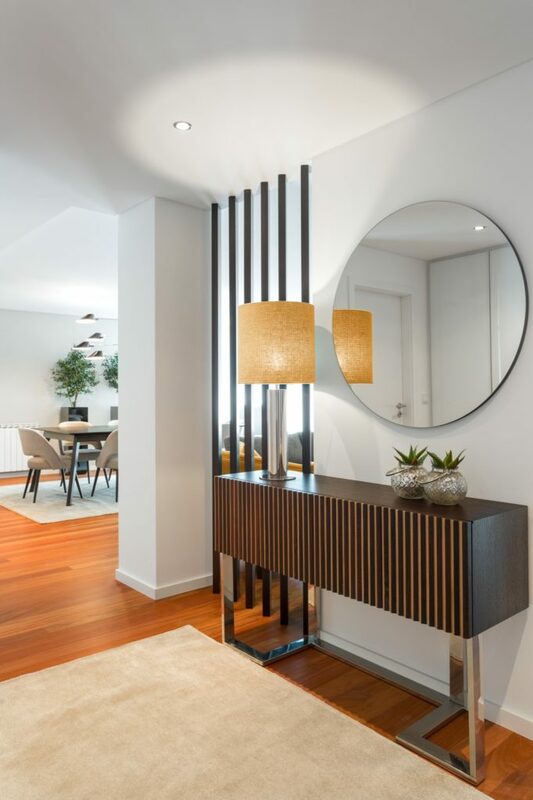 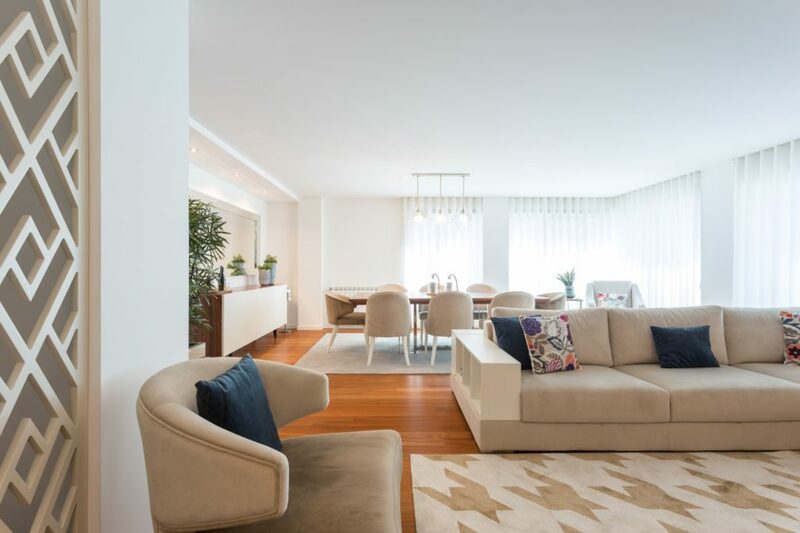 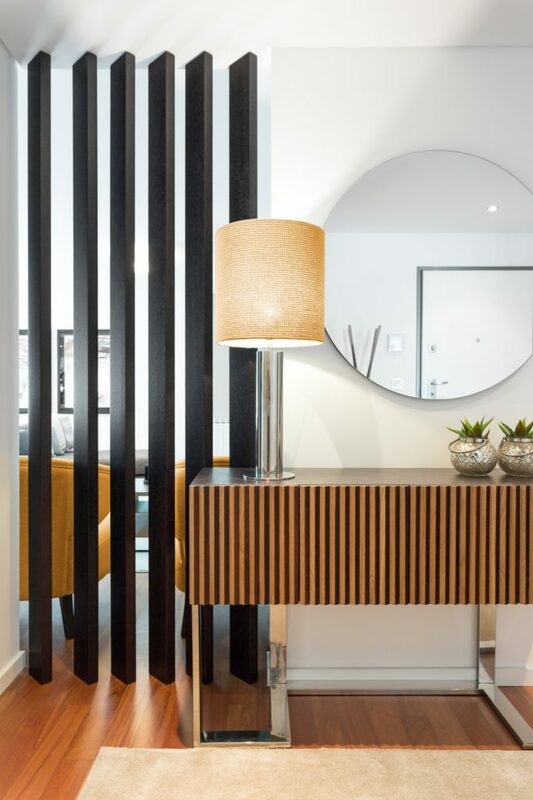 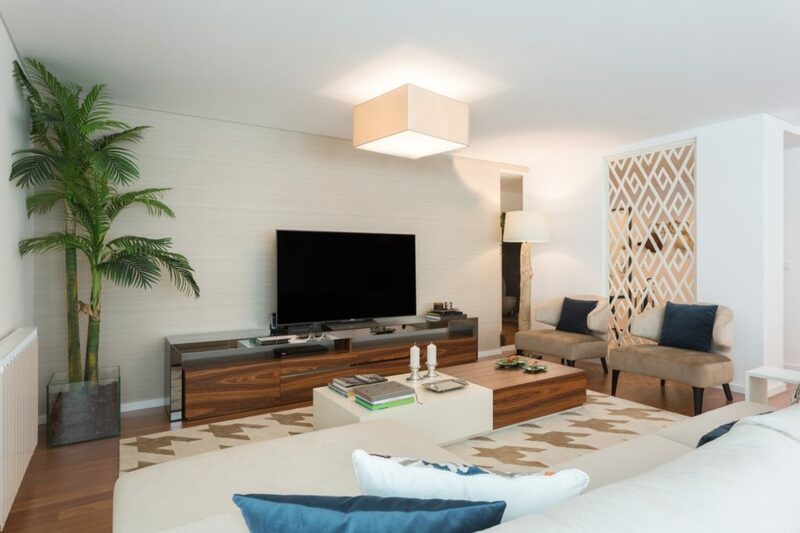 These modern apartments demonstrate the connection between the details of an old building with the contemporary design of the decoration. 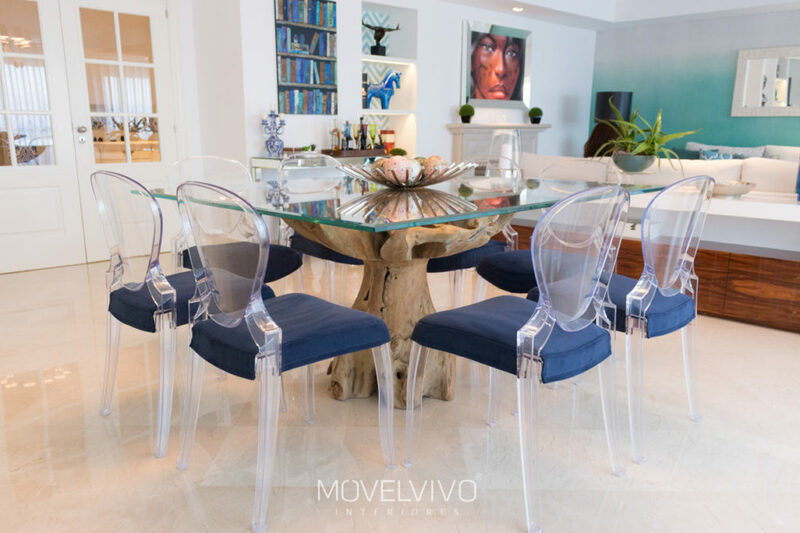 This is the proof that Movelvivo is the perfect choice to grow your business and to get more clients. 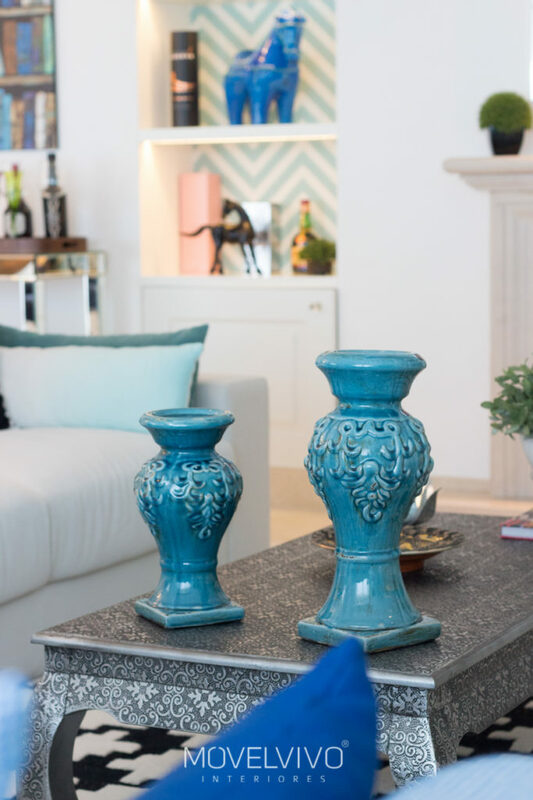 Hire an interior designer now! 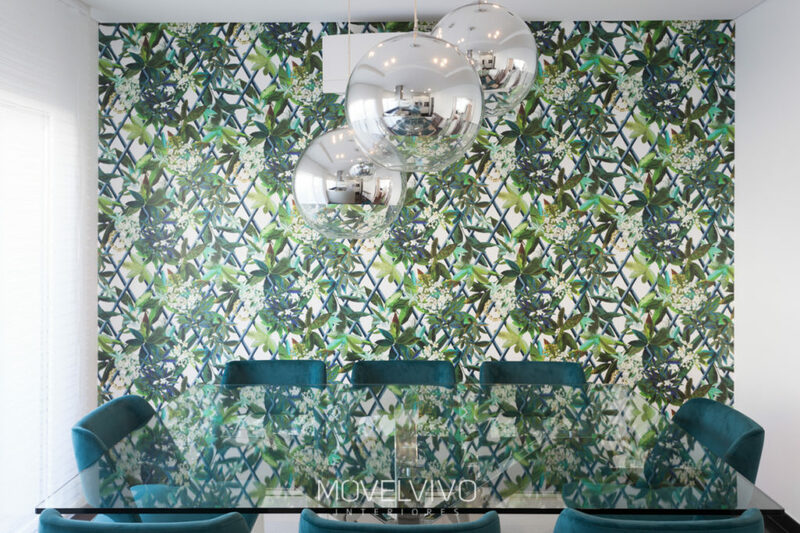 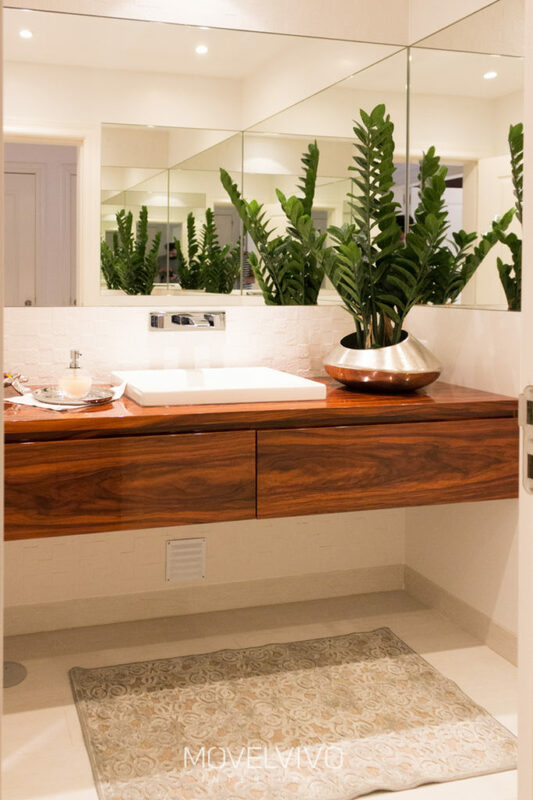 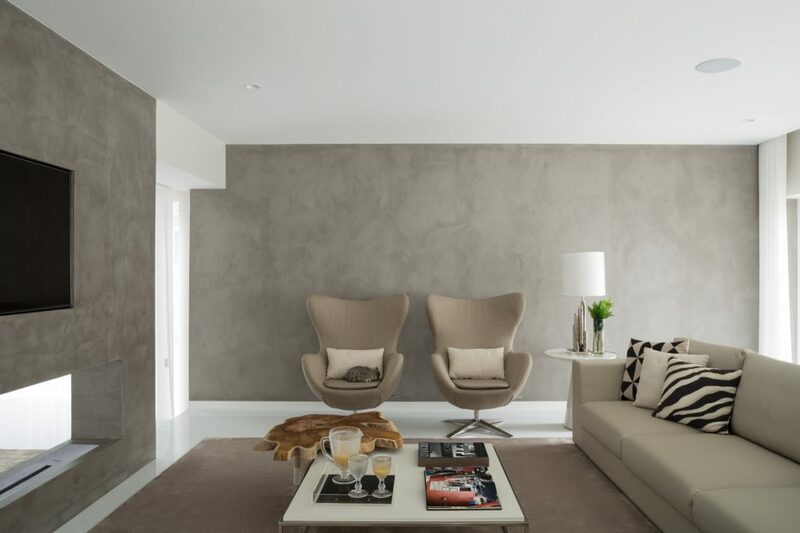 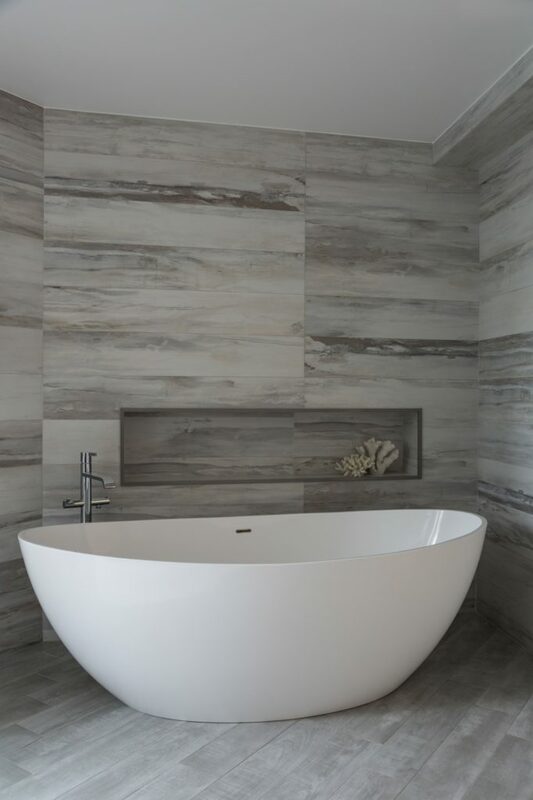 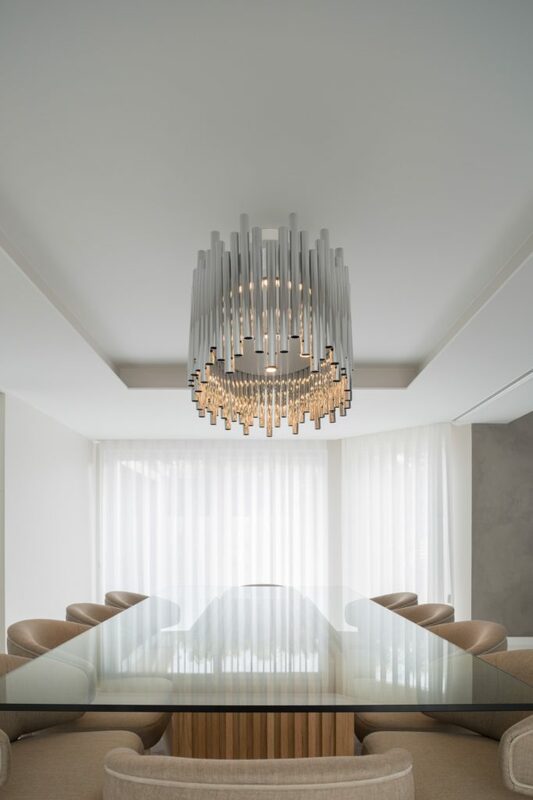 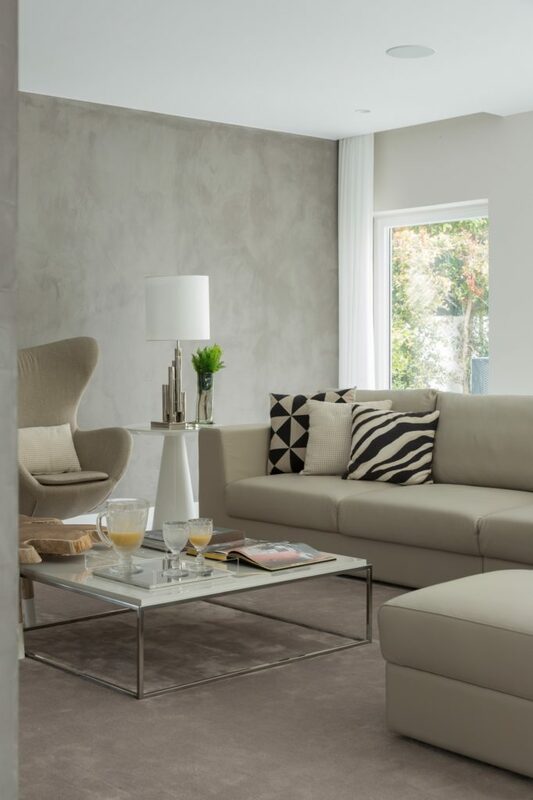 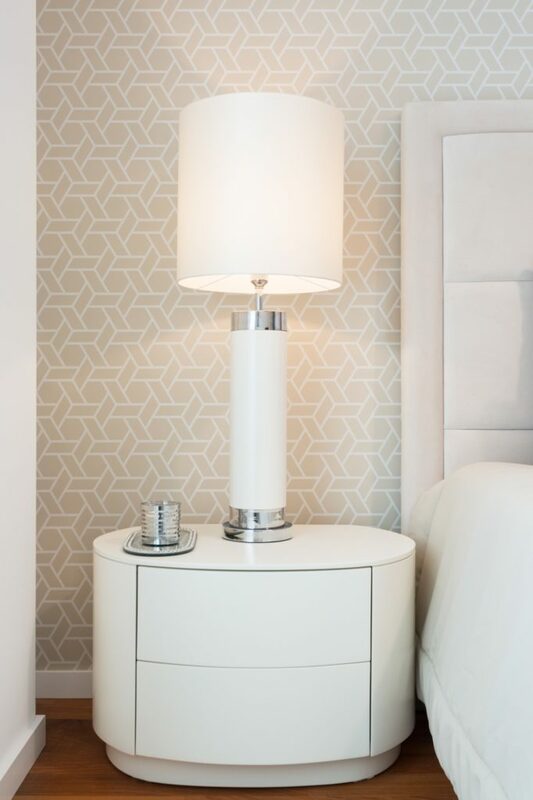 This space is Minimalist and Functional, from the lighting to the sublime wallpaper. 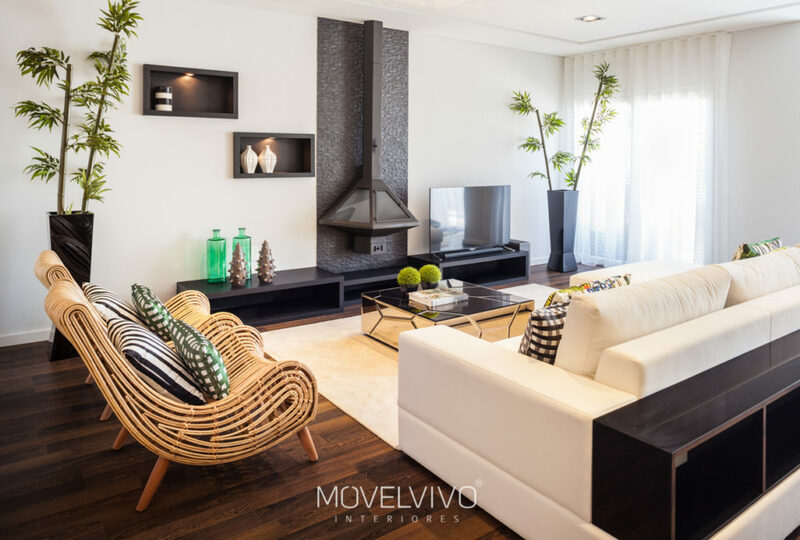 This house privileges simplicity and comfort, that gives you a calm and warm environment, with functionality in all divisions. 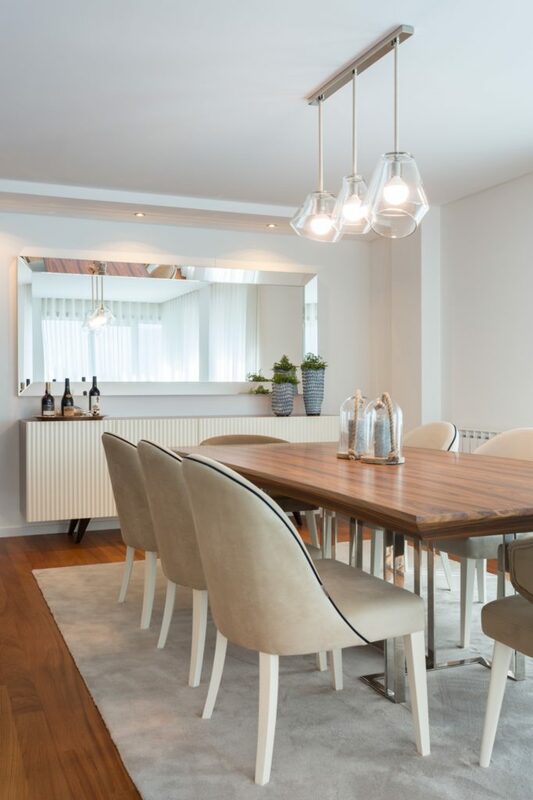 Take a look to the beige tones in common on the living and dining rooms. 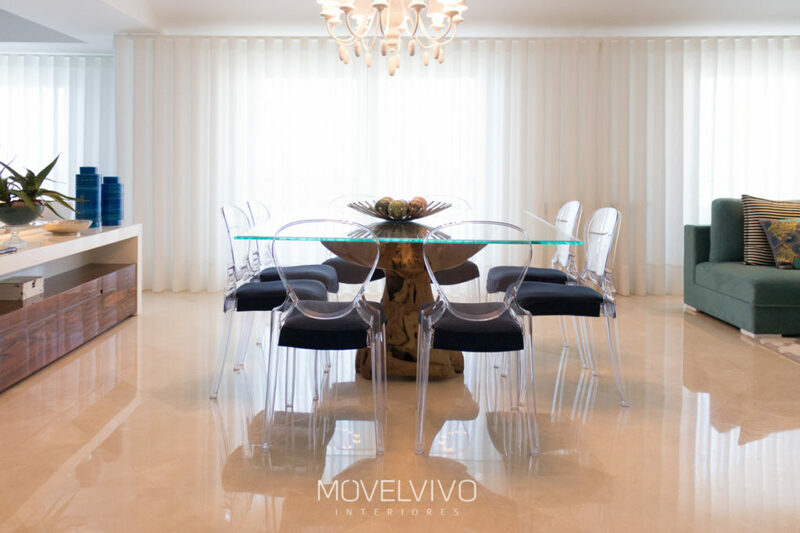 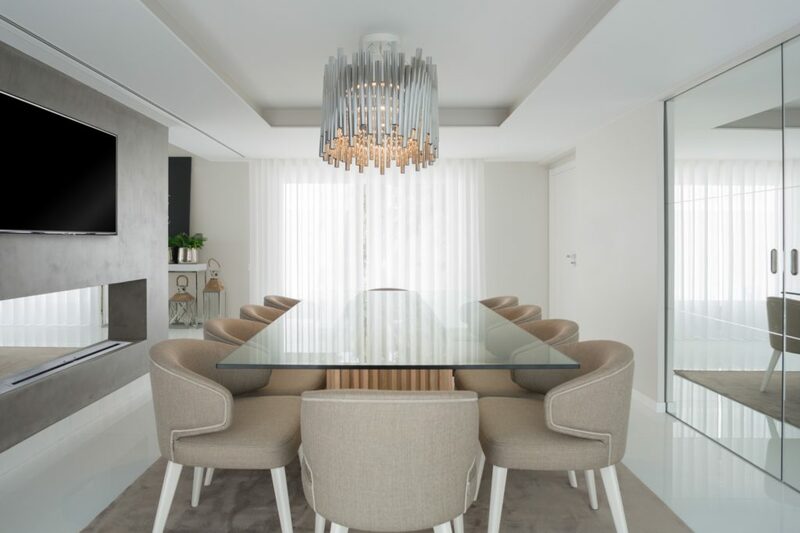 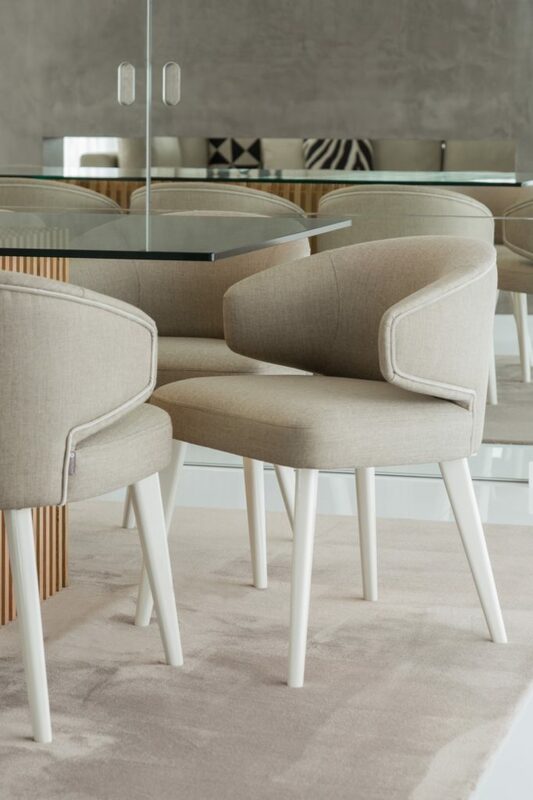 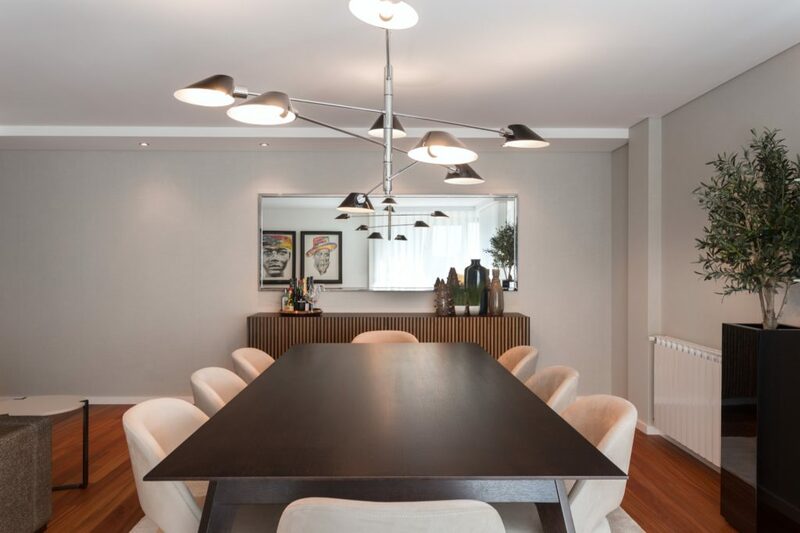 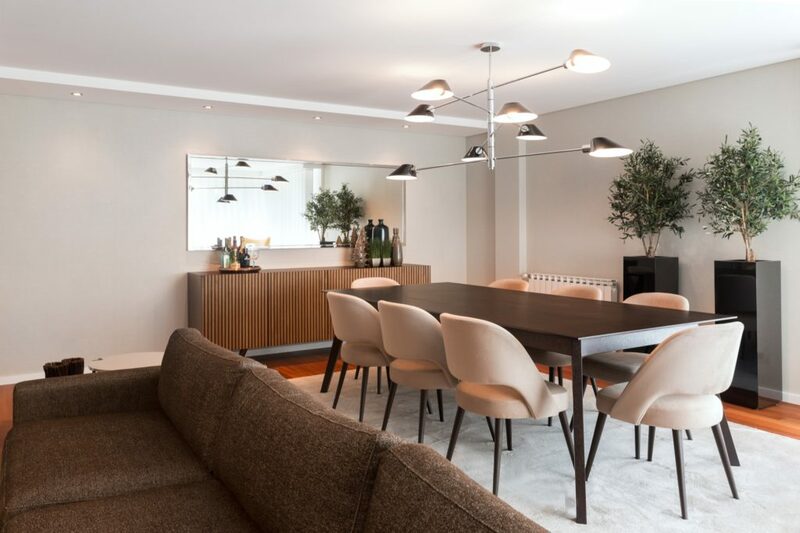 The dining table is surrounded by Sanzio chairs and the living room has a chaise-longue sofa with shelves in the back. 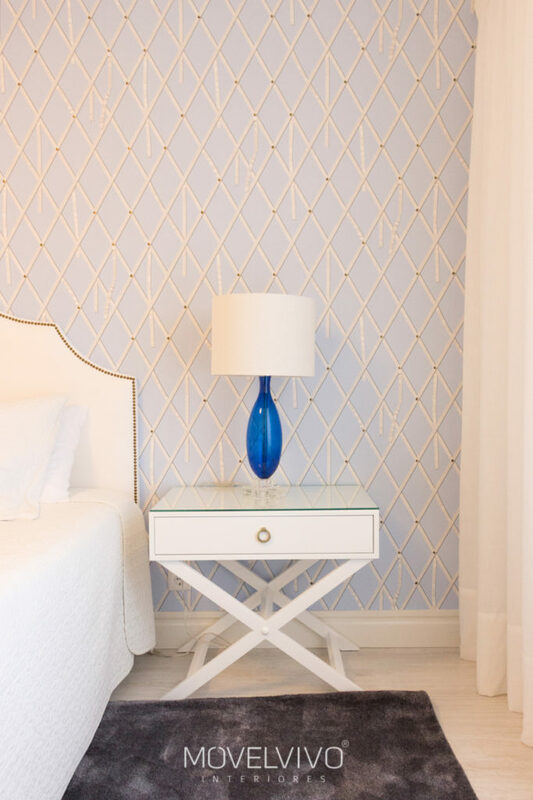 Discreet wallpapers around the house are the sobriety detail of this decor. 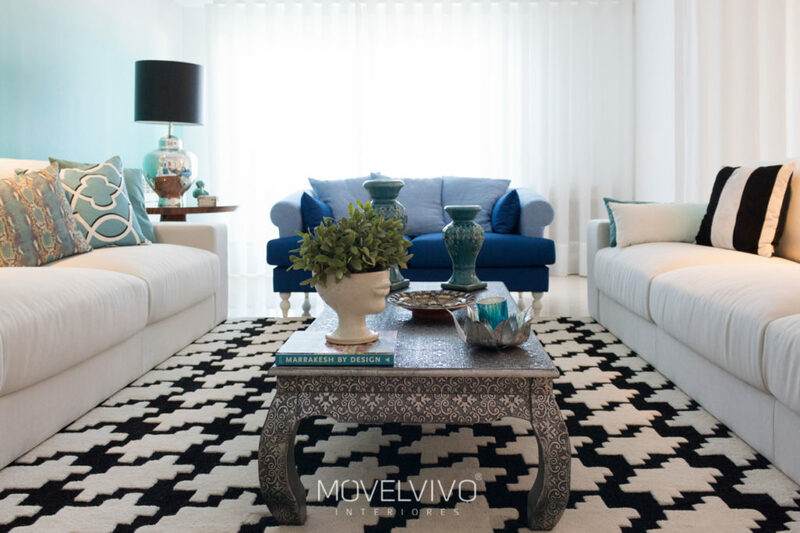 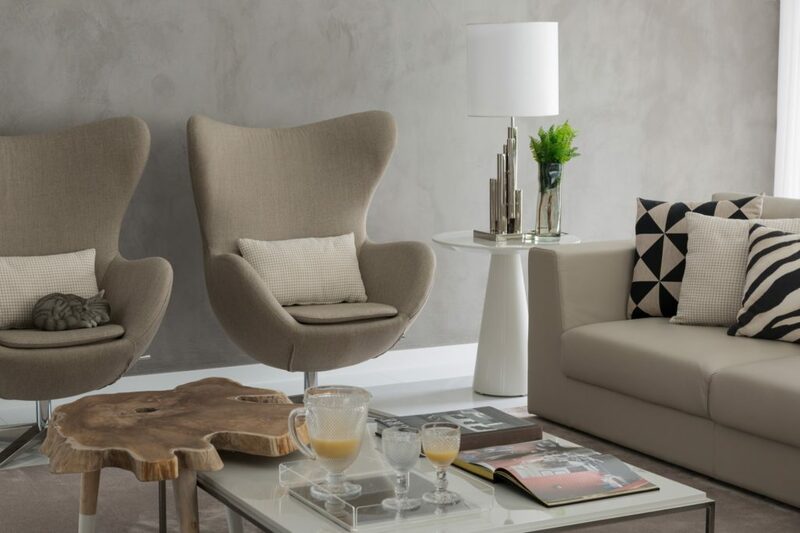 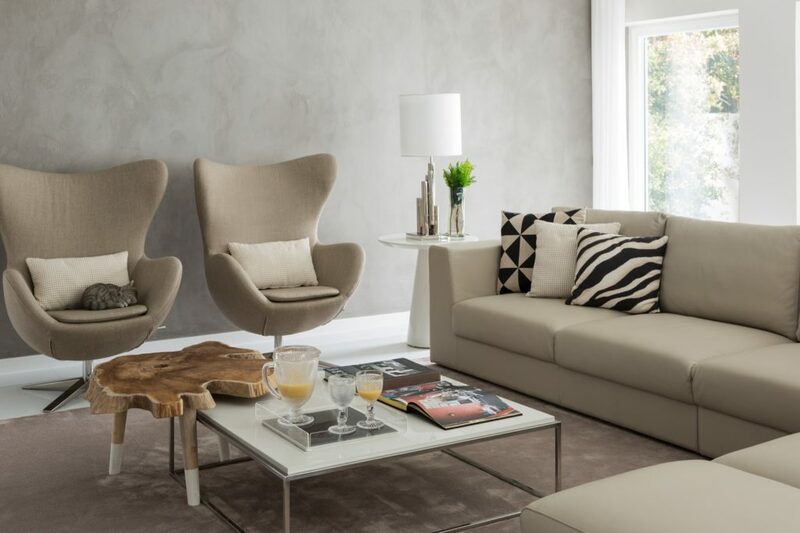 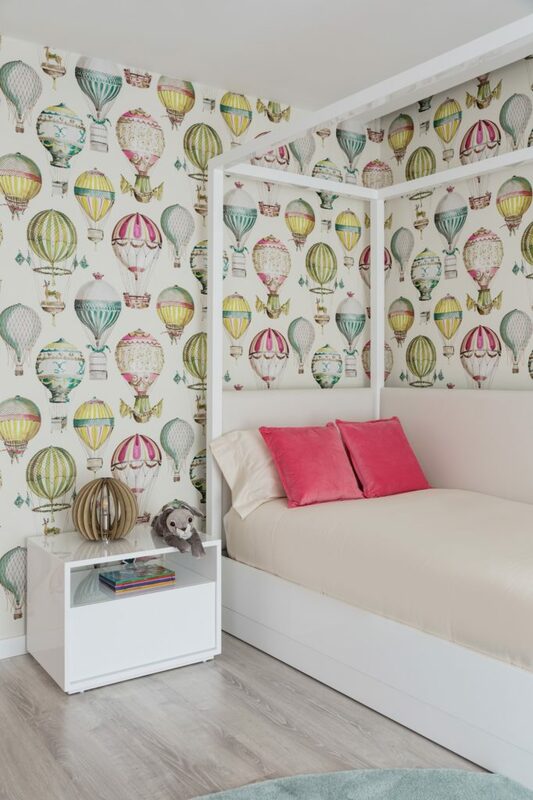 Get inspired by the distinct rooms demonstrating all the personality of each decor. 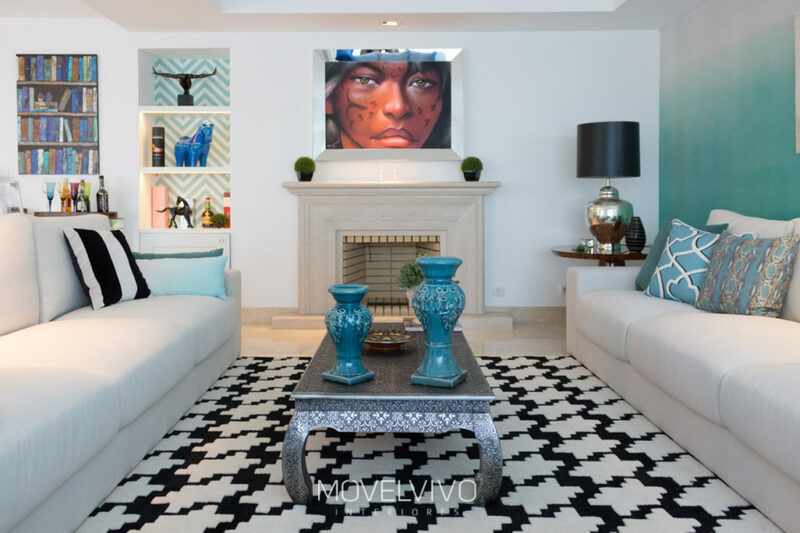 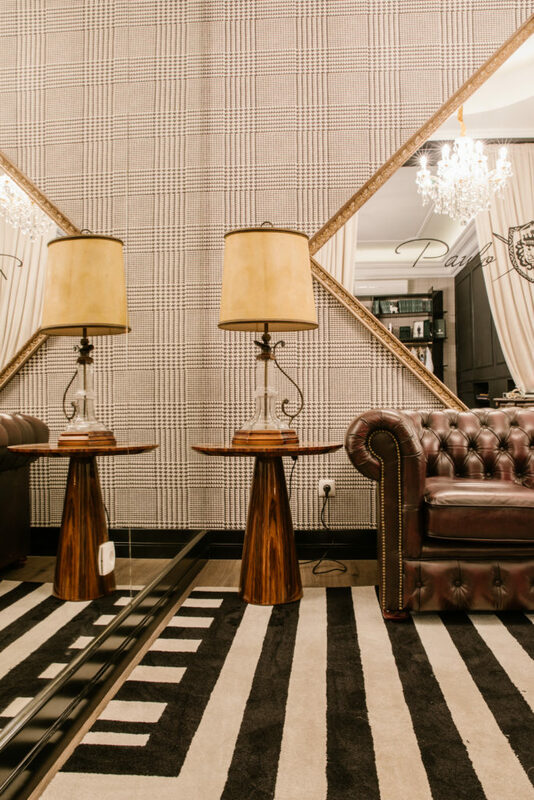 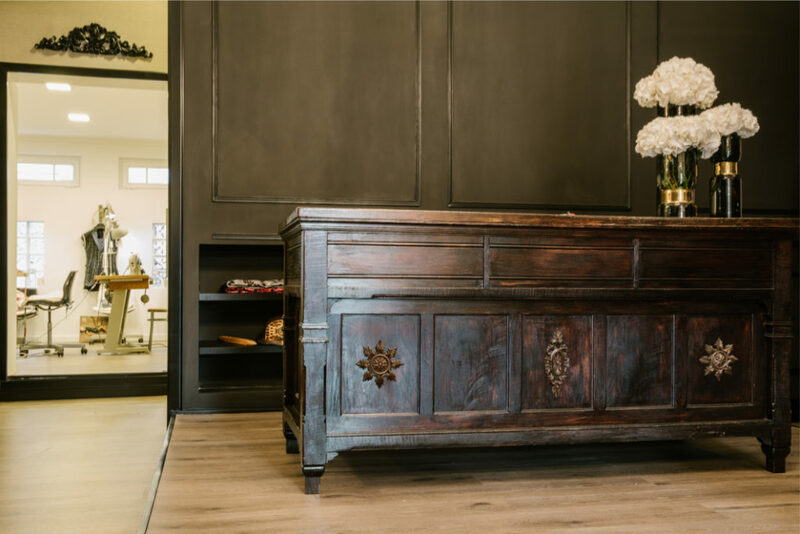 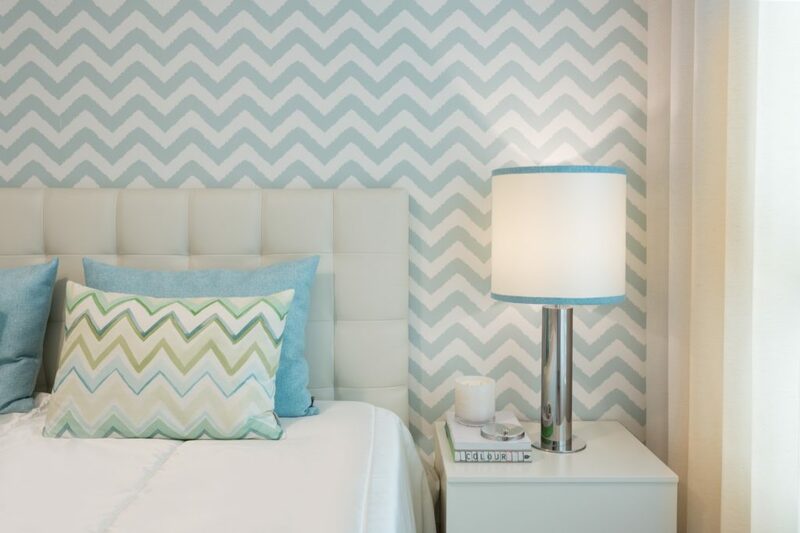 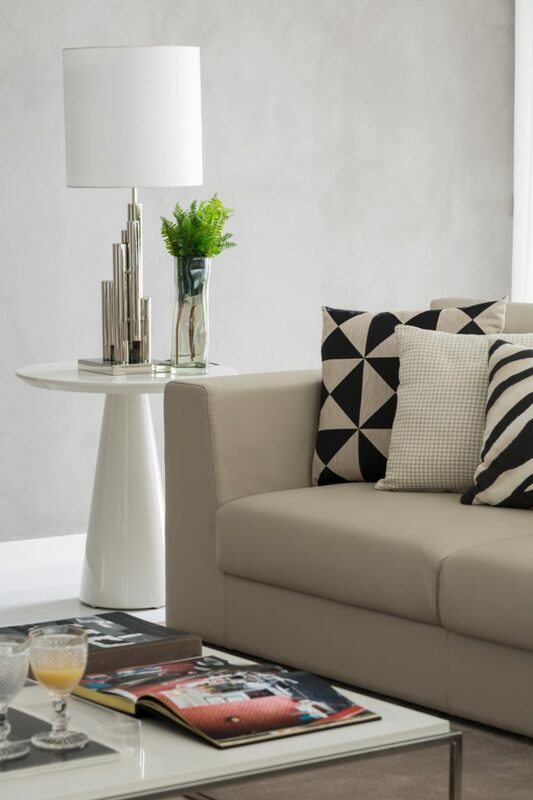 Hire an interior design and get a new personality in your house. 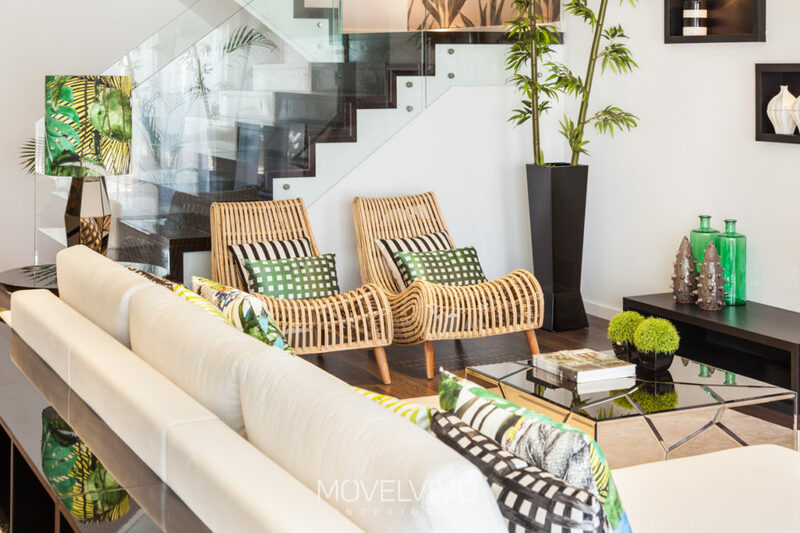 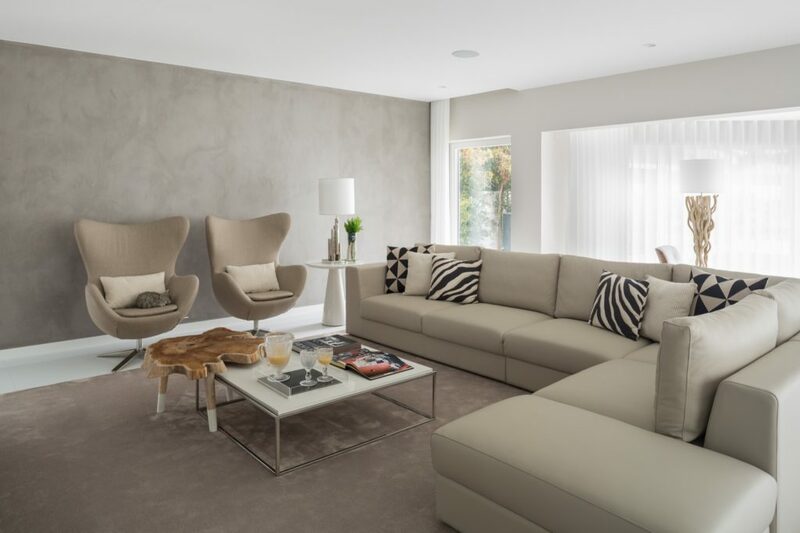 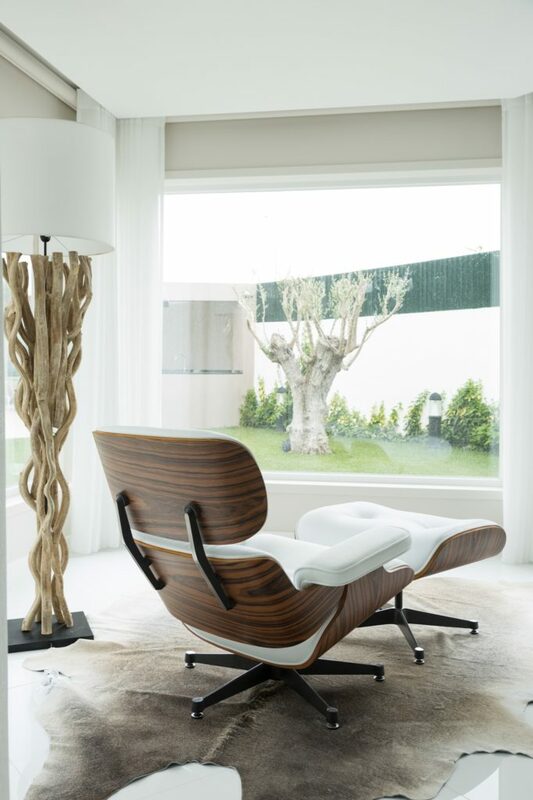 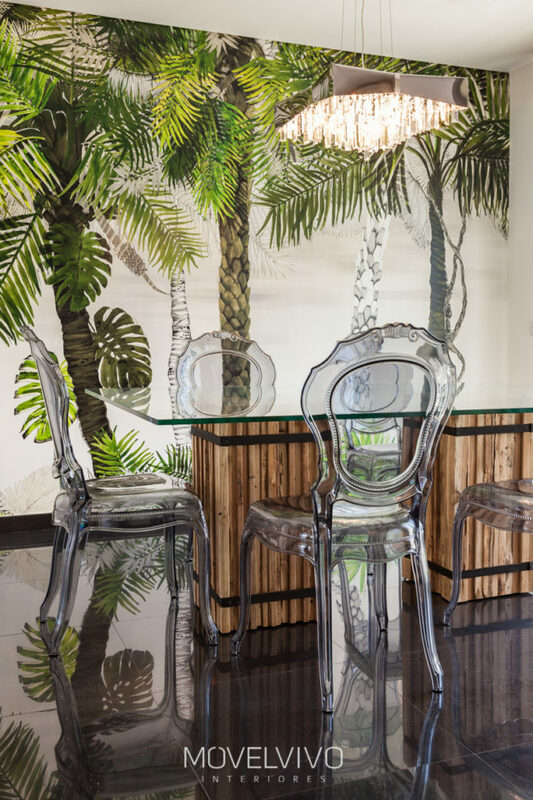 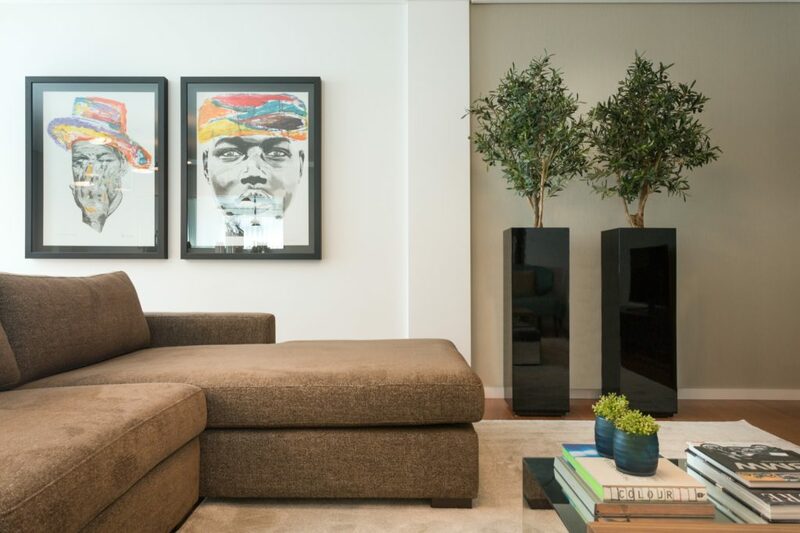 A home characterized by its artistic and contemporary touch fills anyone’s taste. 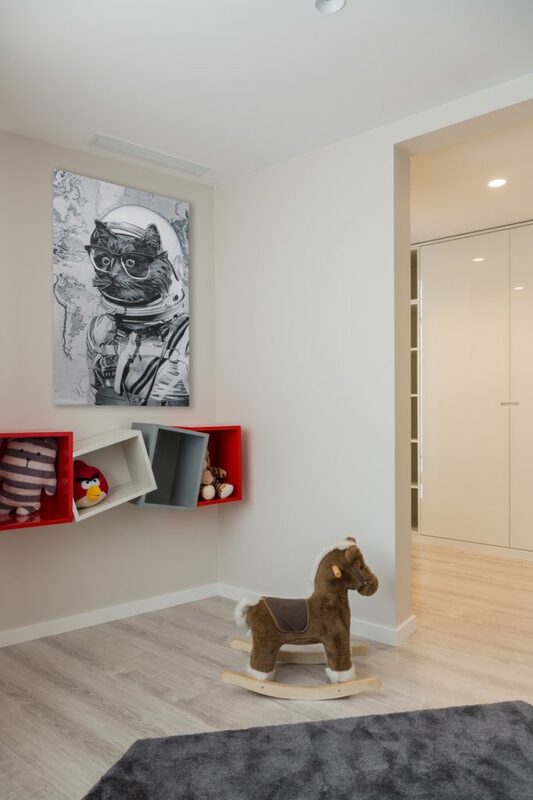 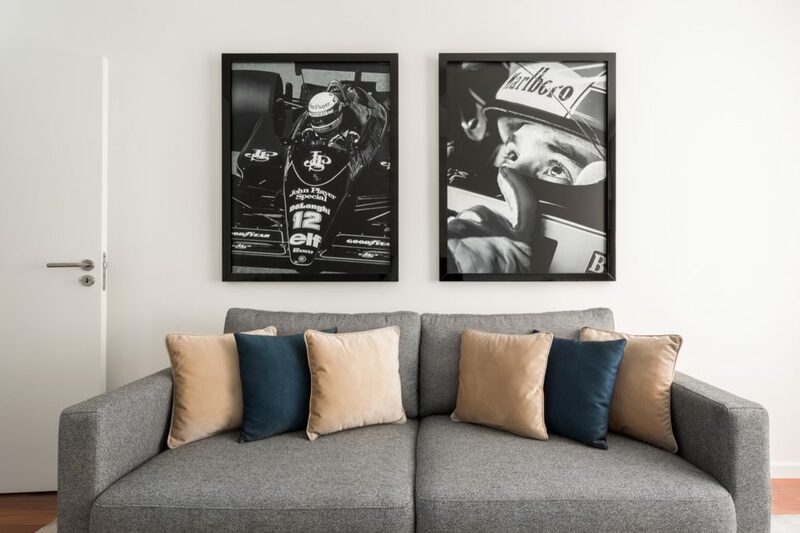 This house has fantastic details, from paintings inspired with faces full-filled by emotions to the black-and-white racing machines, the walls of this house are filled with art. 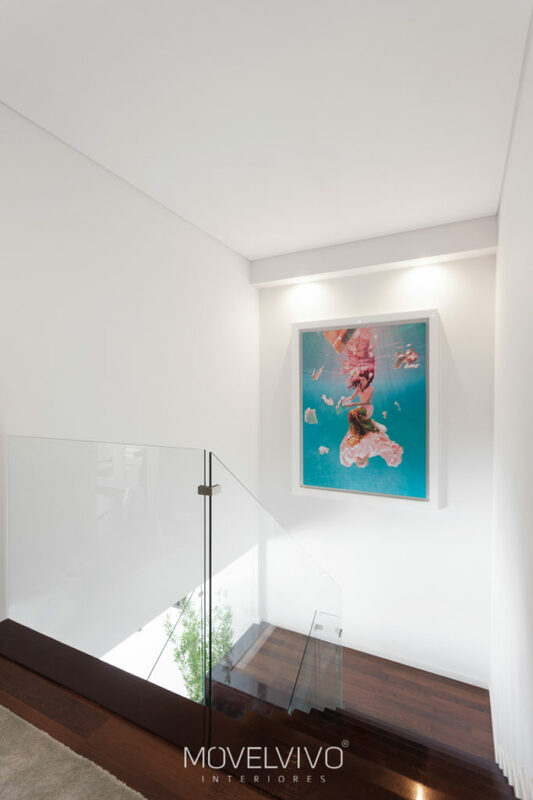 Apart from painting, we also have another art, the interior design work. 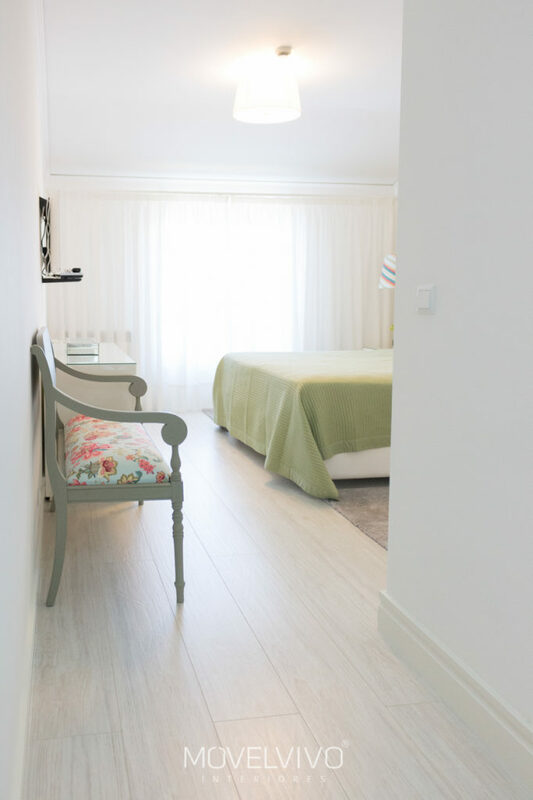 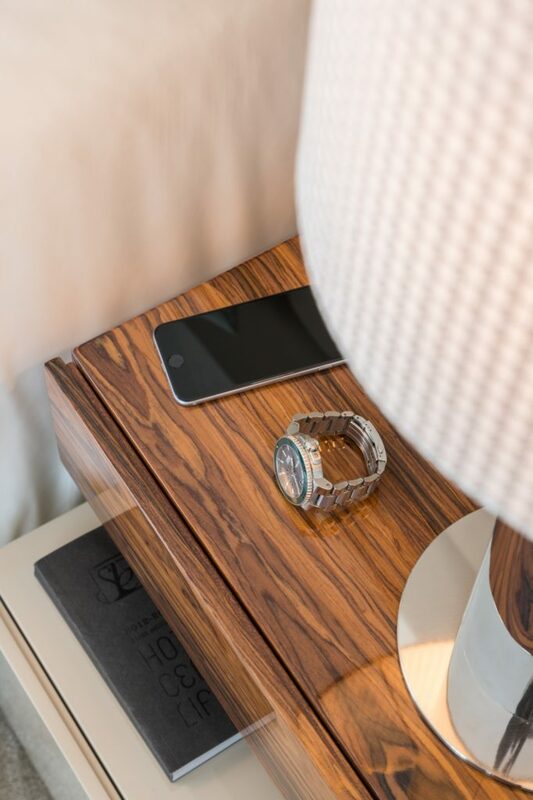 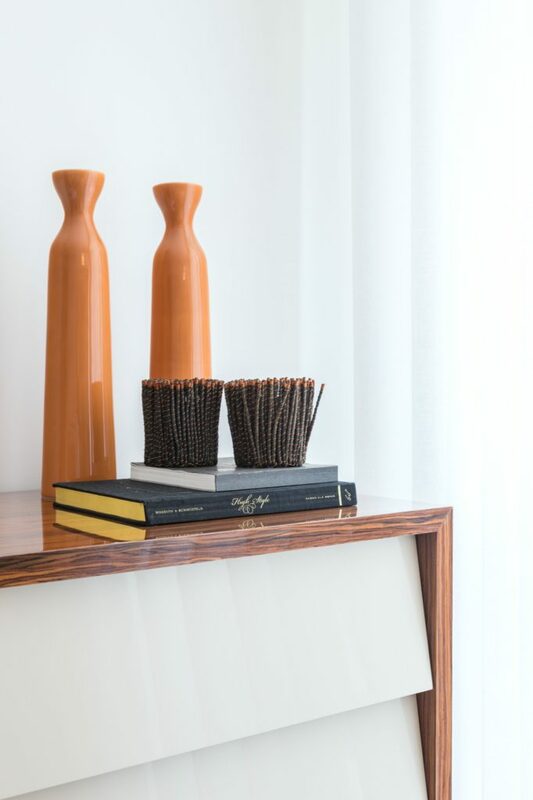 Starting in the room, with summer details walking into the autumn, the room is a statement of decoration. 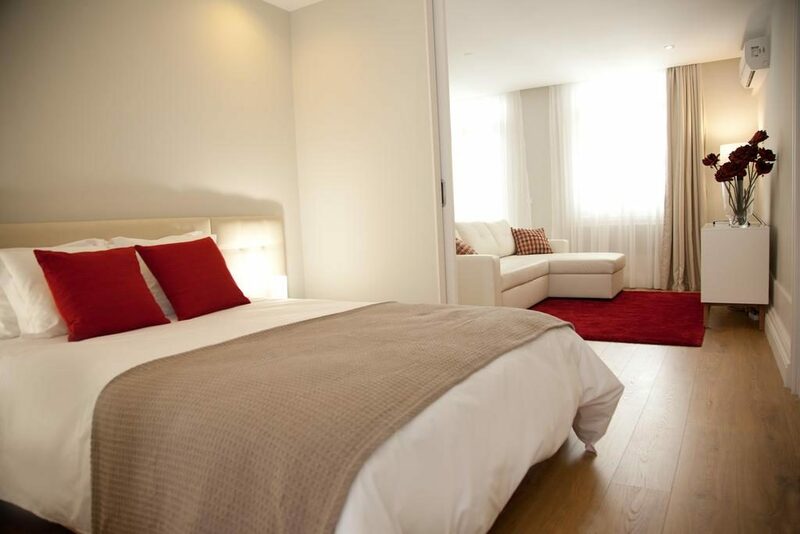 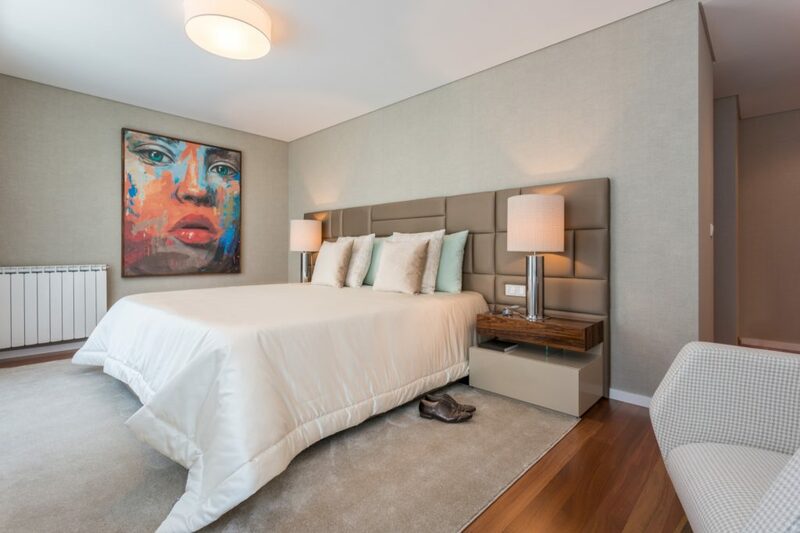 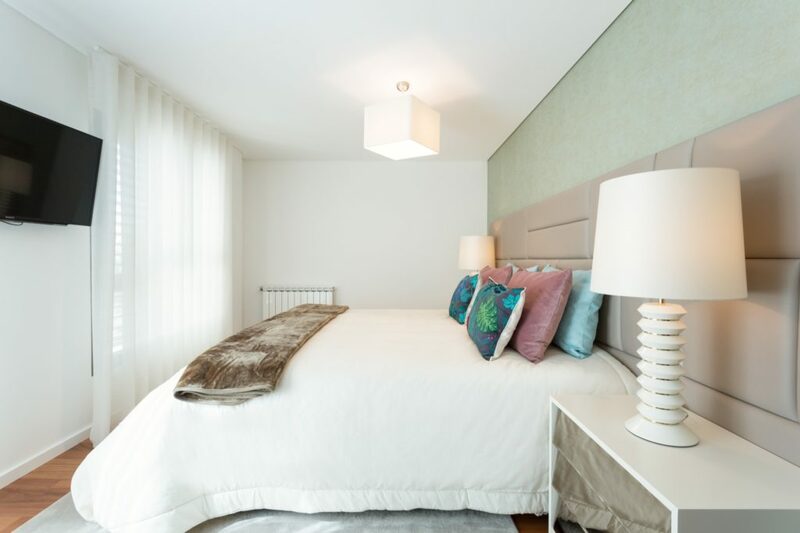 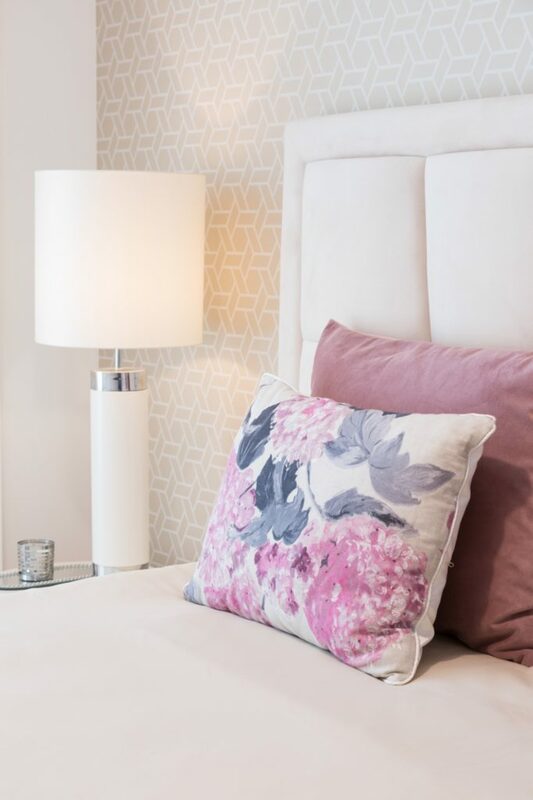 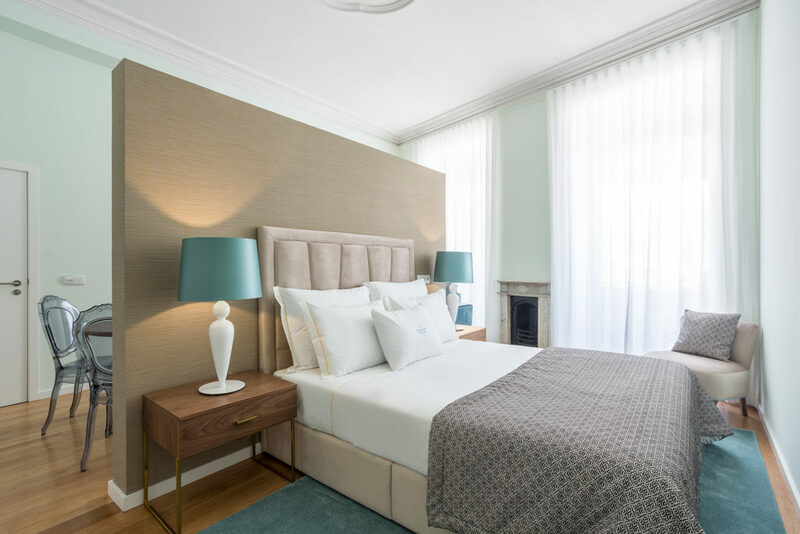 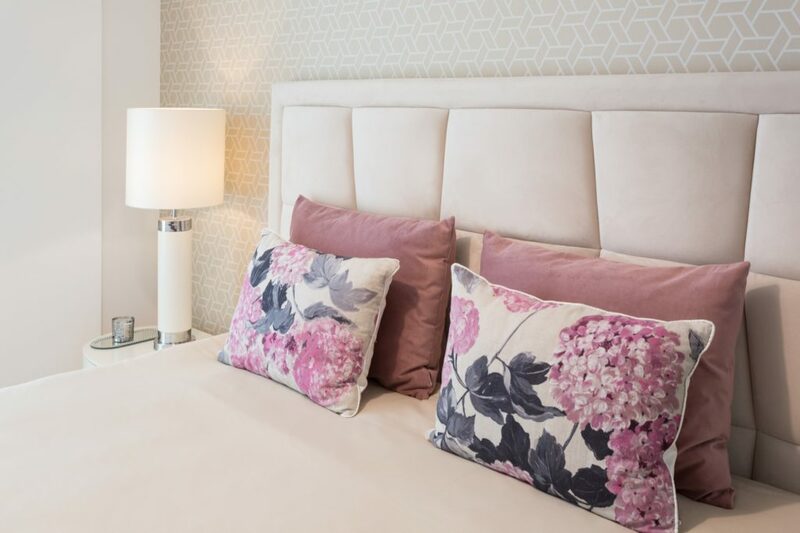 Not forgetting the private side of the house, the master bedroom has all the comfort that you deserve. 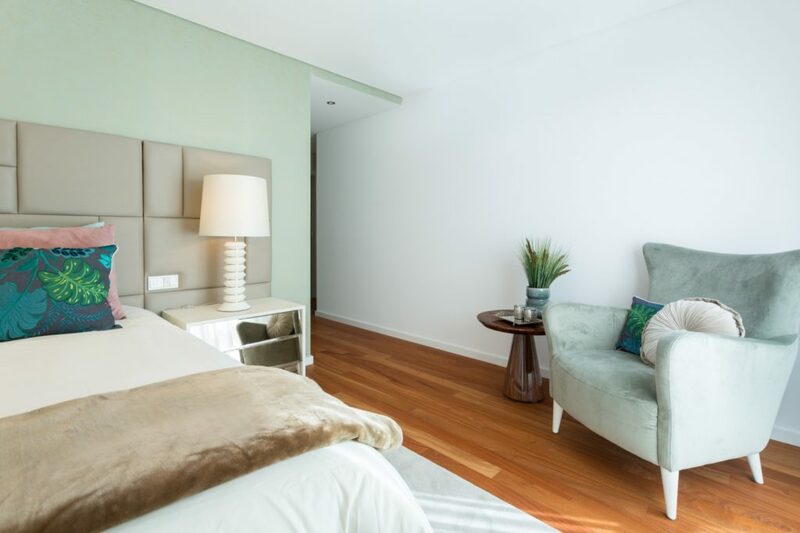 And regarding the remaining rooms, one of them is a guest room and the other is a green office or a private living room. 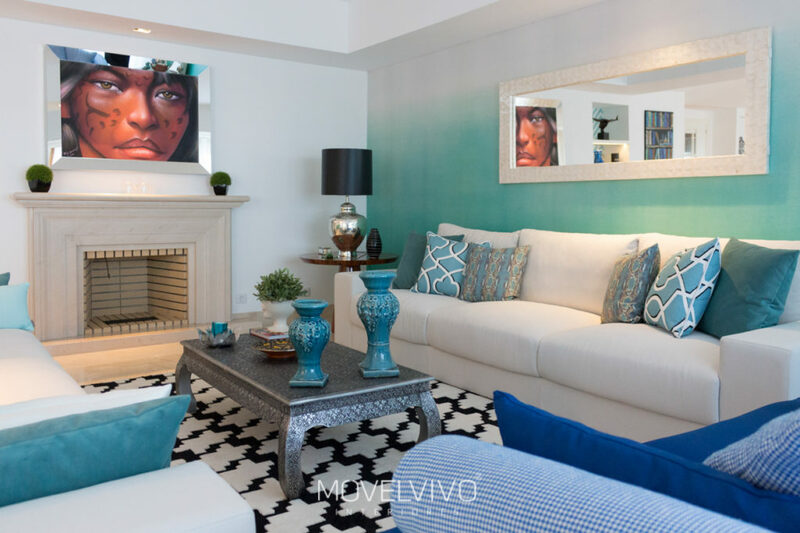 The blue colors contrasting with neutral environments on this living room makes the apartment very audacious and comforting. 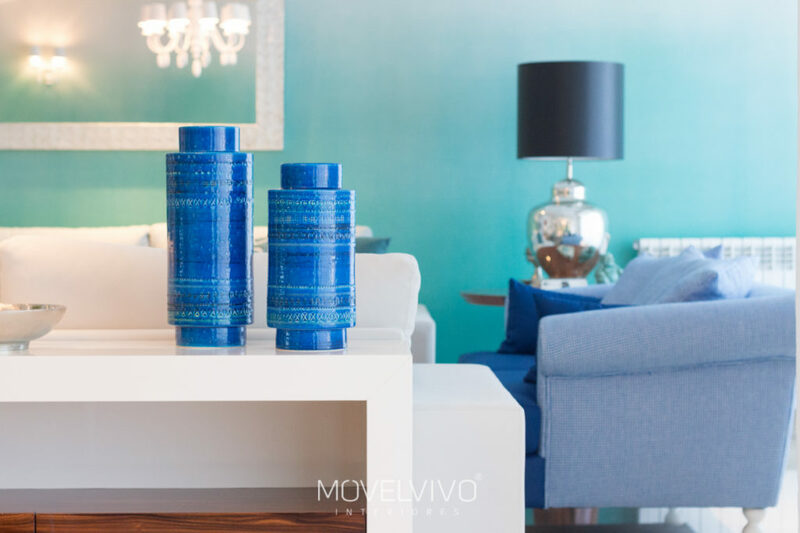 The turquoise blue is a refreshing and tranquilizing color and it helps to eliminate the daily stress. 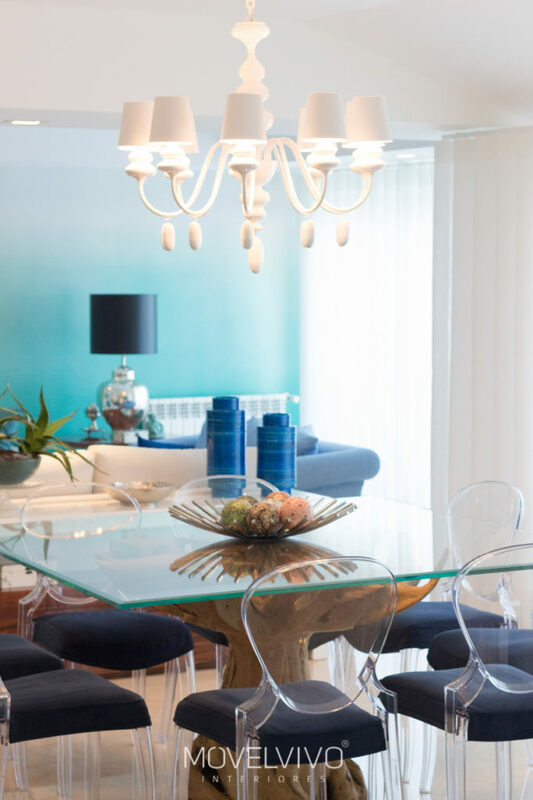 This color is the perfect choice for those who want to bring happiness to the house. 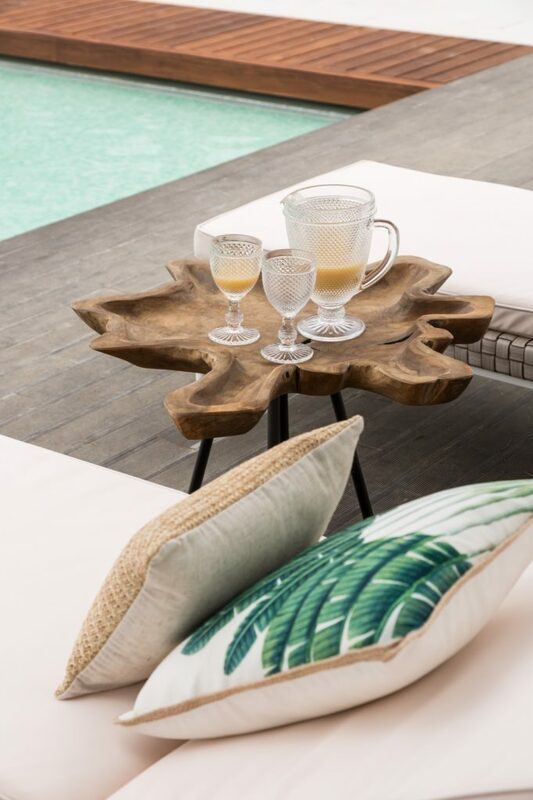 Start each day with a good vibe and full of new ideas. 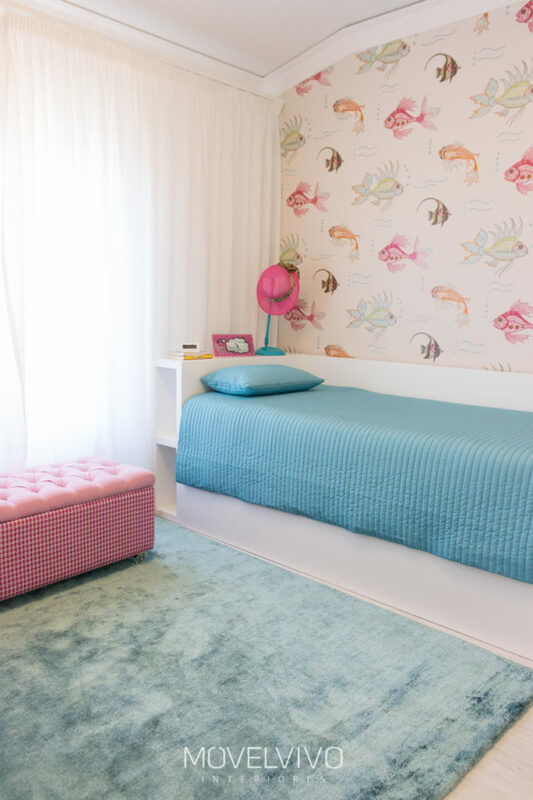 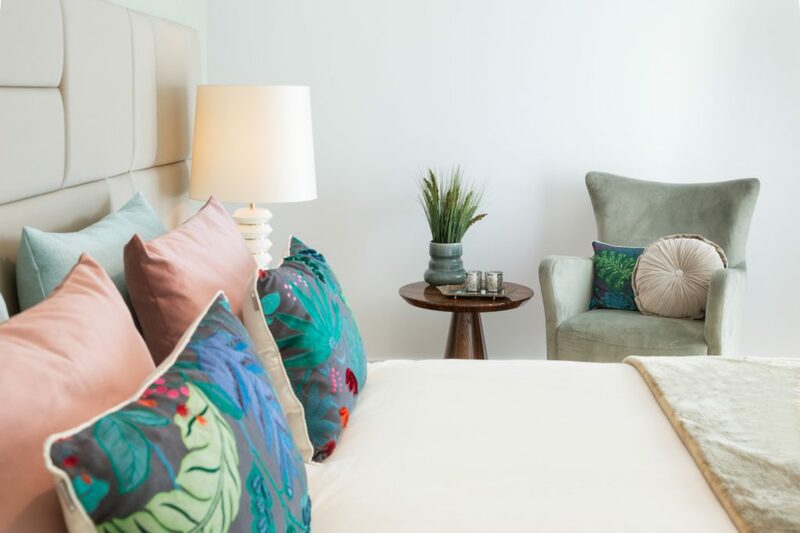 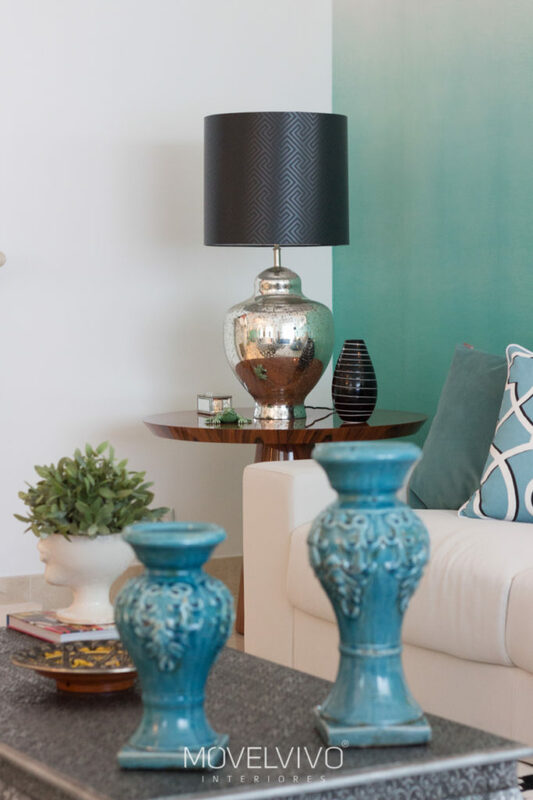 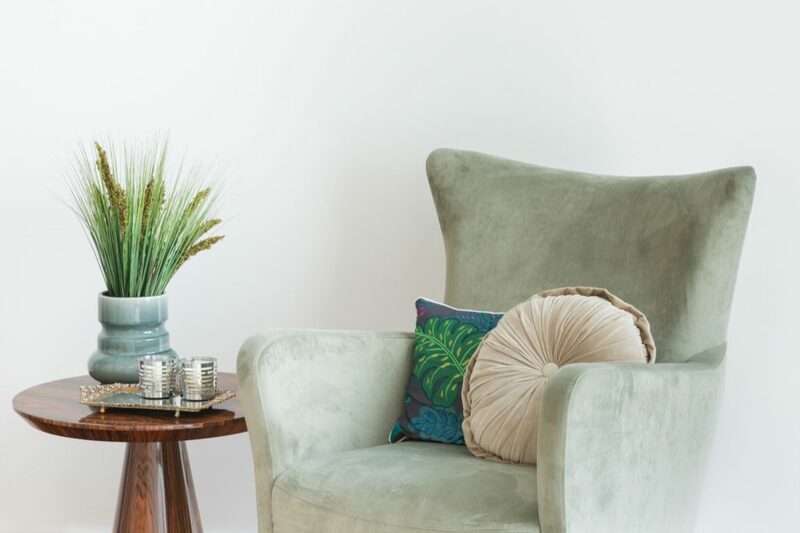 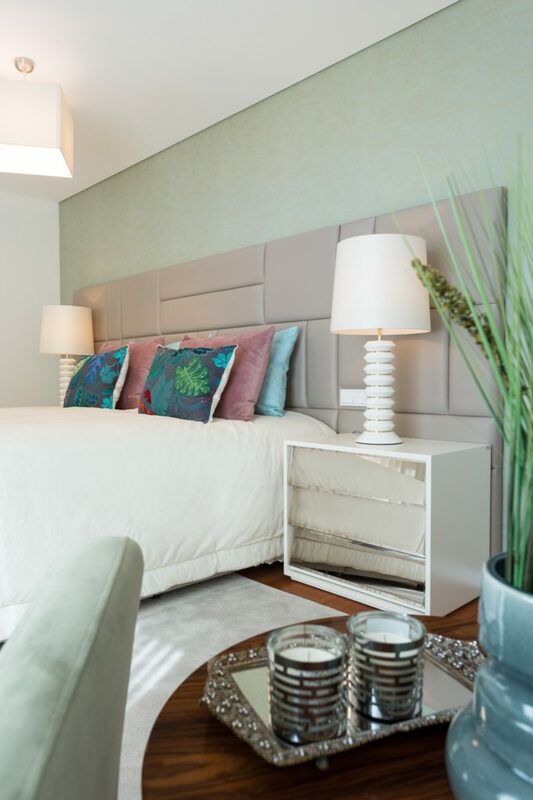 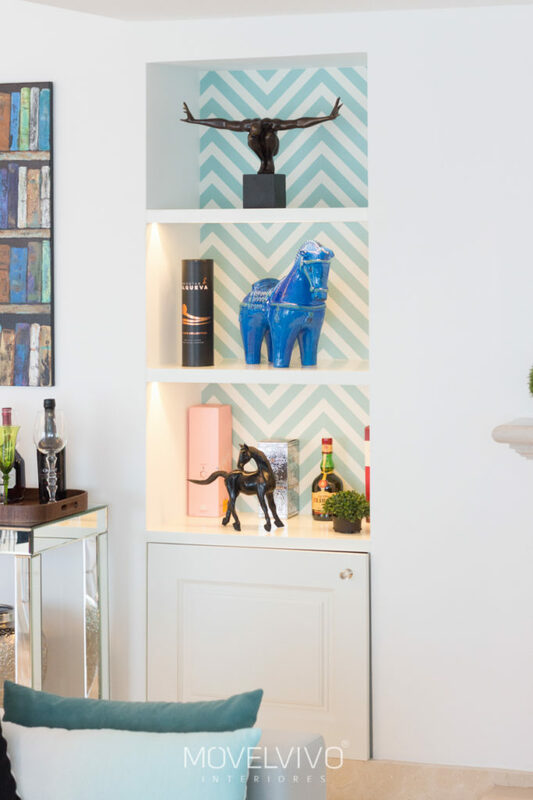 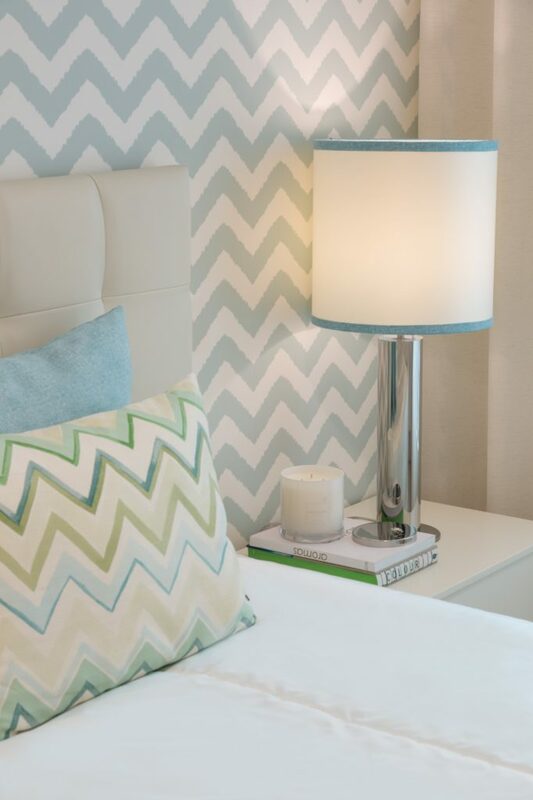 Like the other vibrant colors, the turquoise should be used in the right dosage to keep the wised balance in the house, helping to create a more inviting environment. 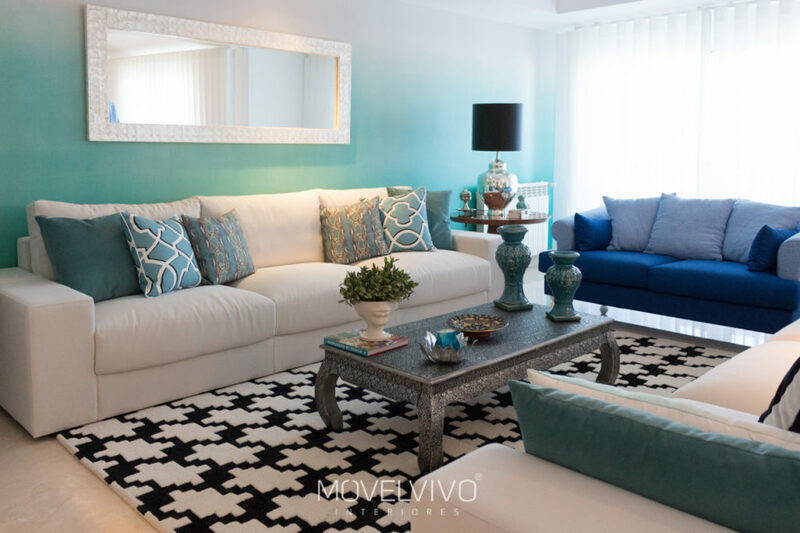 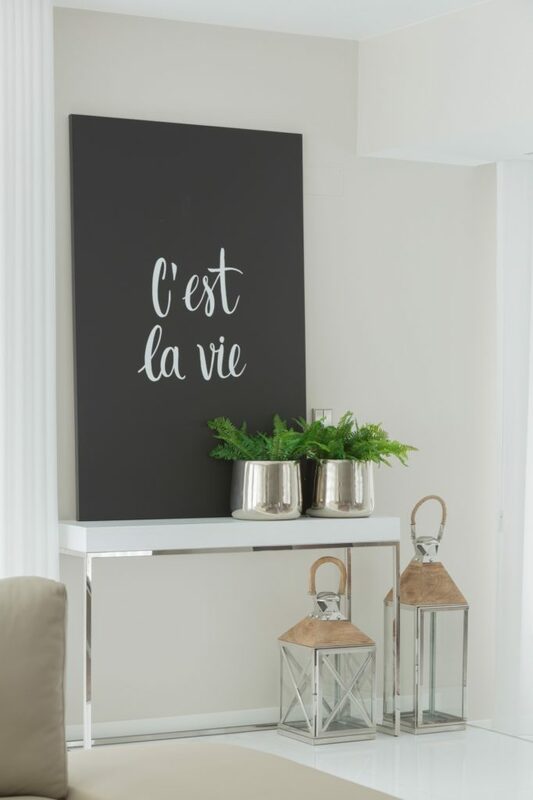 Enjoy this inspiration to change your home and change your life!